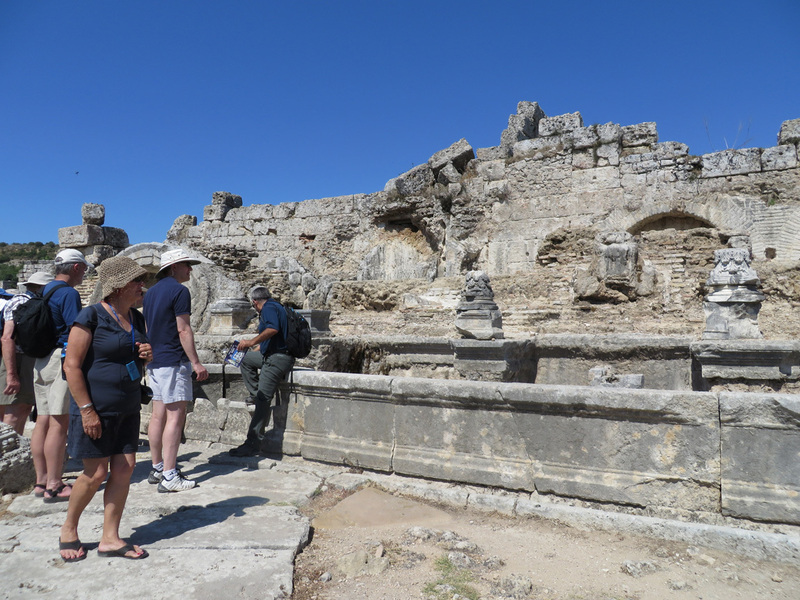 We got back from our pleasant trip to Perge about 12:15. 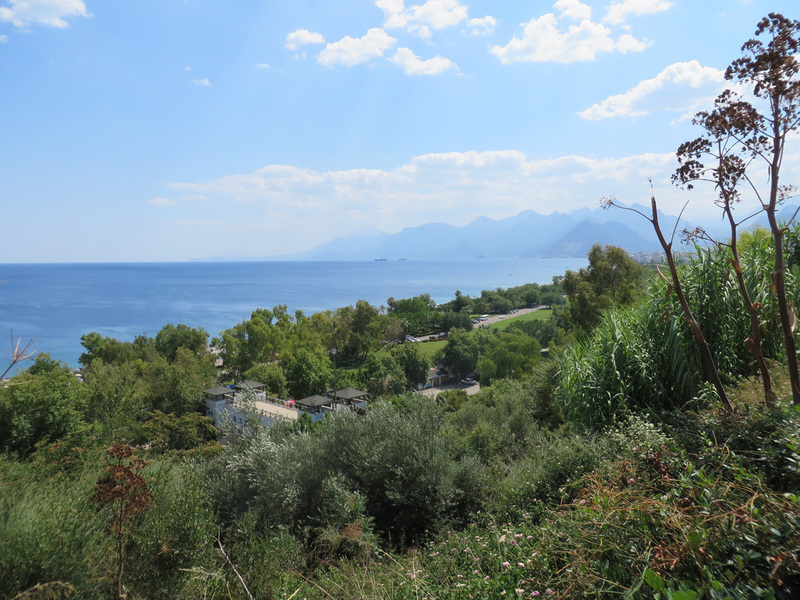 We had the option to go on a tour of old Antalya, but decided we wanted some time to explore on our own. So we packed up our swim suits and headed down to the sea. 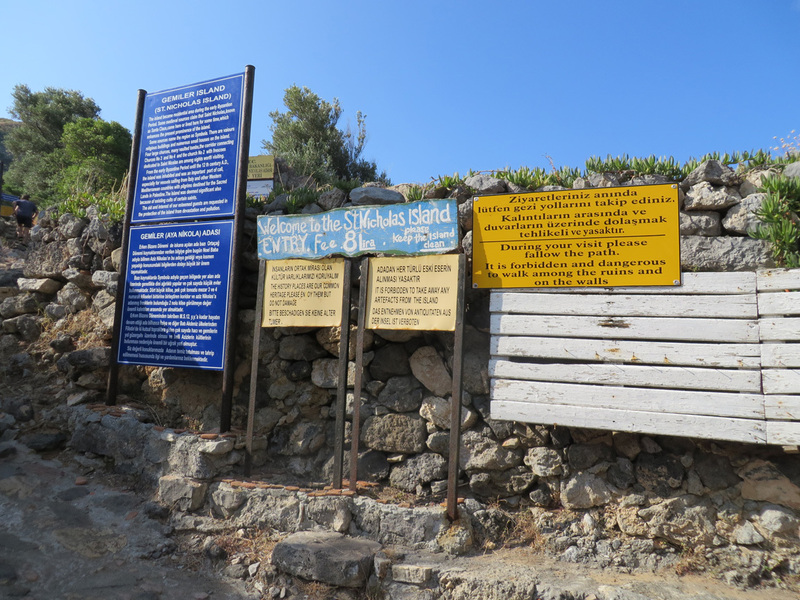 At the top of the sea cliffs, a pathway runs along the top of the cliff. Lots of restaurants, some fancy, and tourist stops. 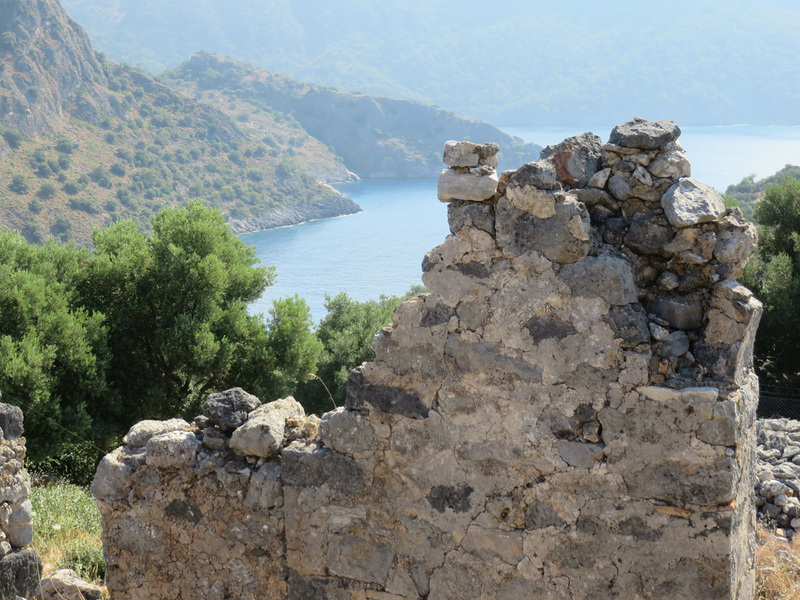 Here is the view to the left, of the buildings on the cliffs above the Mediterranean Sea. 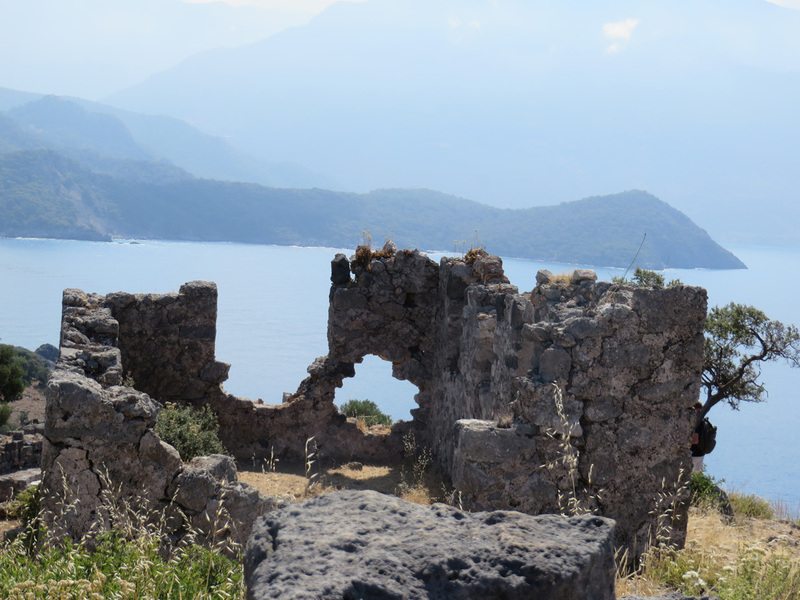 The view to the right, of the steep mountains that take off right at the shore. Zoom in on the people on the beaches. 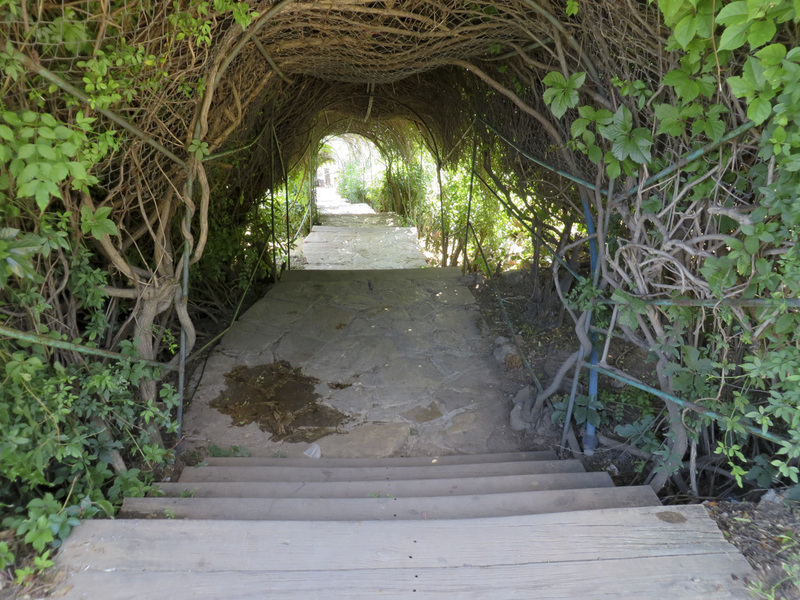 This is the cool entryway to the foliage-covered steps. 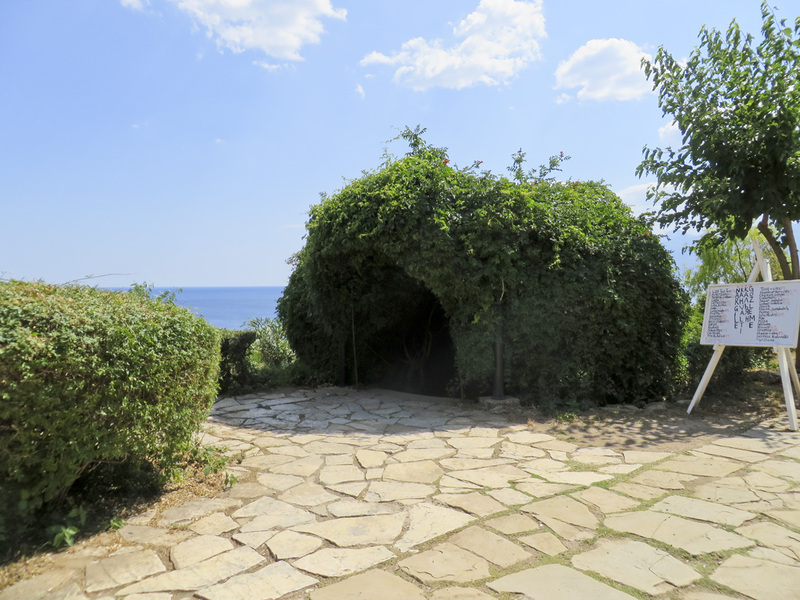 The first time we came up to it, we had no idea it was the way down to the beaches, until we saw some Turkish people pop out of it. It was like entering a secret forest. After a couple flights of stairs there would be a landing with a couple shops, like for henna tatoos and street food. Then you descend another couple flights, and more shops. 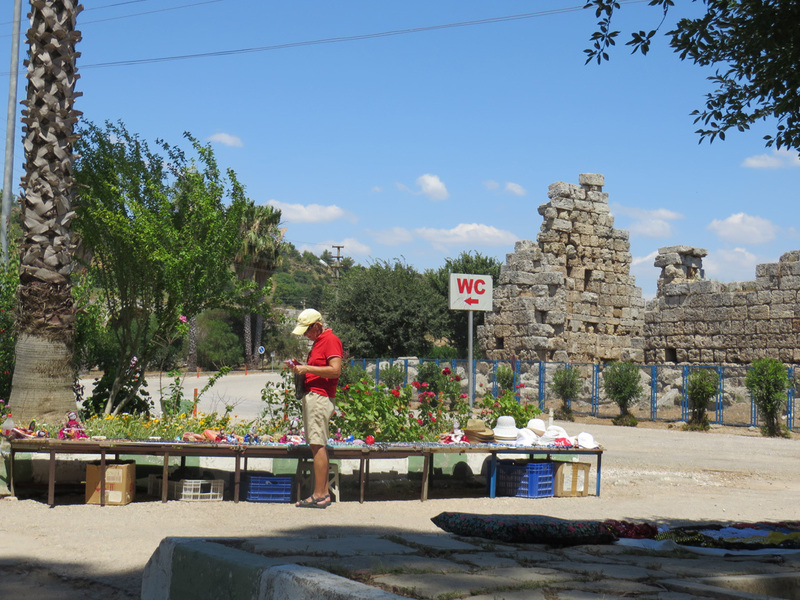 We were on a mission to get something other than kebabs and meze: like hamburgers! And we found them, great ones, fresh and perfect. And fries. And Efes beer. 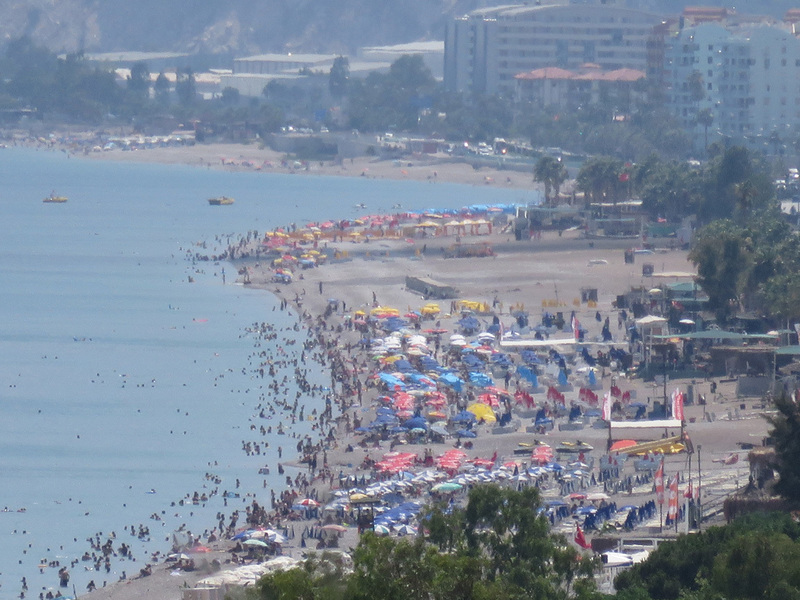 We found a spot on the shore where chairs and umbrellas were for rent - 10 lira, a great deal. We put down our towels and - how wonderful! - a young man came to sell us cold beers! The beach was made of big hot pebbles instead of sand. The water was heavenly and warm and clear and the views spectacular. When we swam close to the beach, we felt cold water mixing with the warm sea water. Must be from undergound streams from the tall mountains. It was an amazing spot. I could have stayed several more days enjoying that beach. But alas, this is our last day in this lovely spot. For the Oddysey Farewell Dinner, Ali took us to a restaurant high on the cliffs with a grand view of the resort area. The food was over-the-top great, from meze to dessert. We had entertainment from friends of Ali, who used to be a Turkish folk music performer himself. Then they projected â€œGo Colorado Buffalosâ€ on the bank of cliffs behind us. Luckily, one of our tour members had a photo taken of all of us. What a time. A perfect ending to a near-perfect tour. Thank you Oddysey, thank you Ali. Breakfast at the Rixos was once again the huge, varied breakfast buffet that seems the norm in good European-style hotels in Turkey. Never seen the like in the US. Maybe we just choose cheap hotels for ourselves. 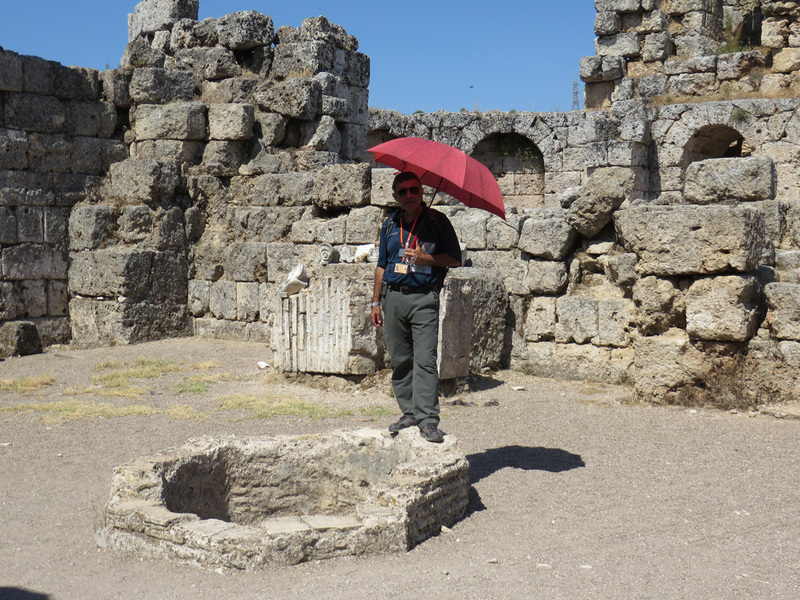 Thank you Odyssey, for making us go to five star hotels. Our last day in Turkey. 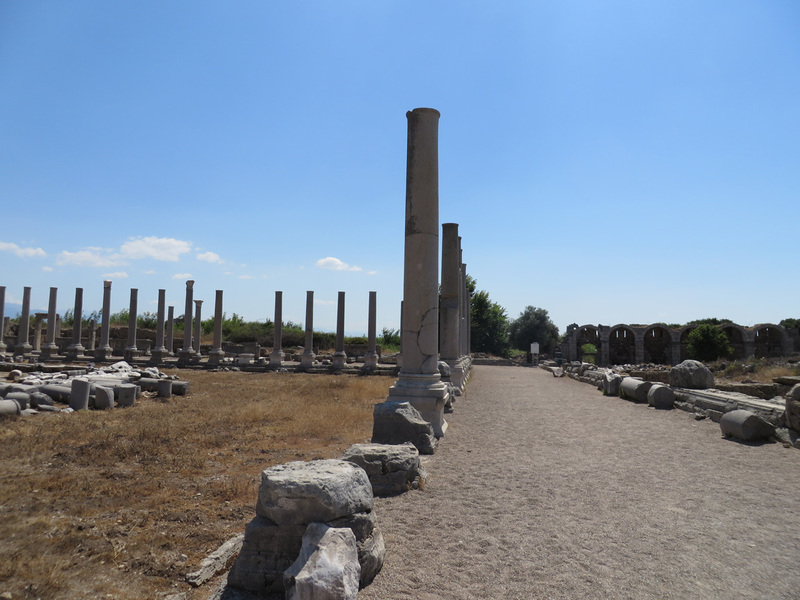 Today we visit Perge, on the outskirts of Antalya. 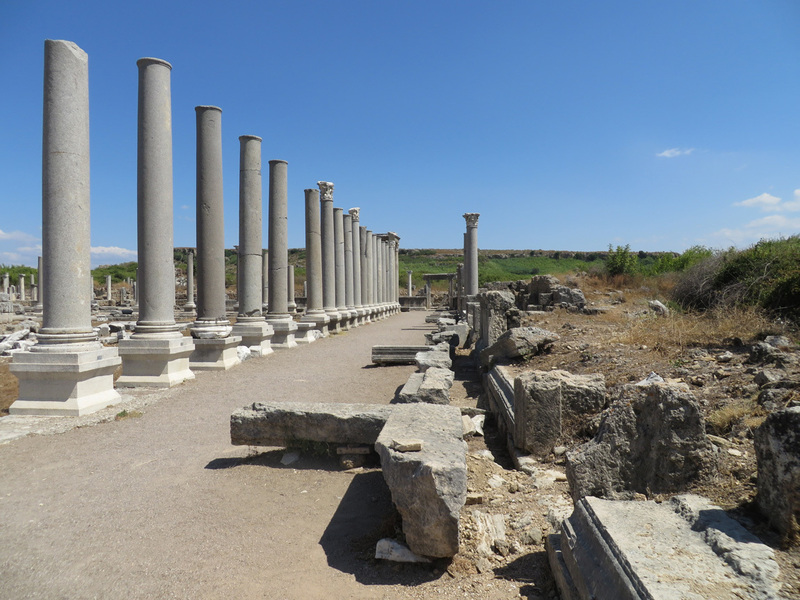 Perge is almost as amazing as Ephesus, but nowhere near as crowded. 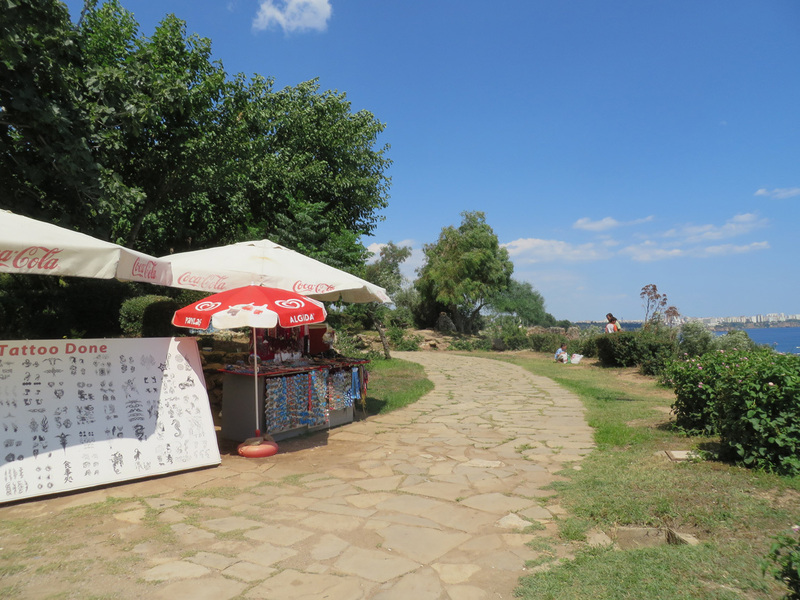 It was hot, but there was a nice breeze, and some shady trees. 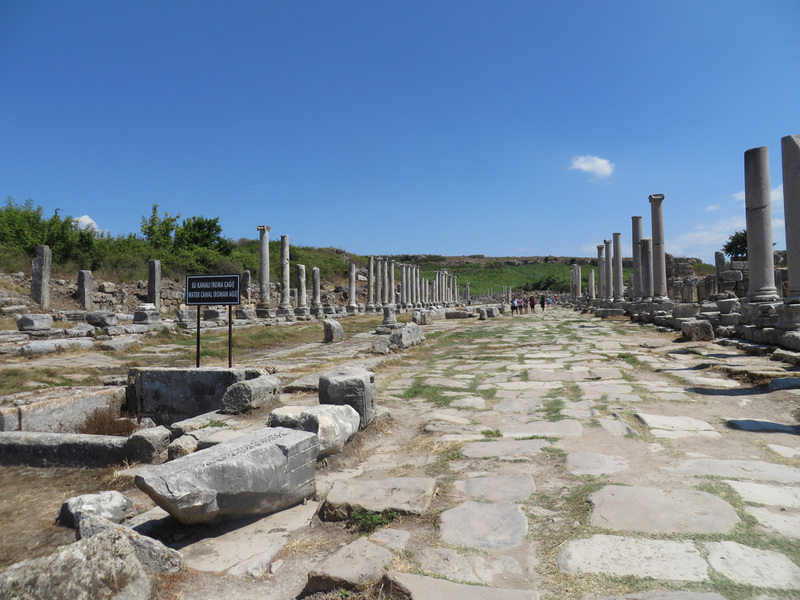 Perge (or Perga) was a city for over a thousand years. 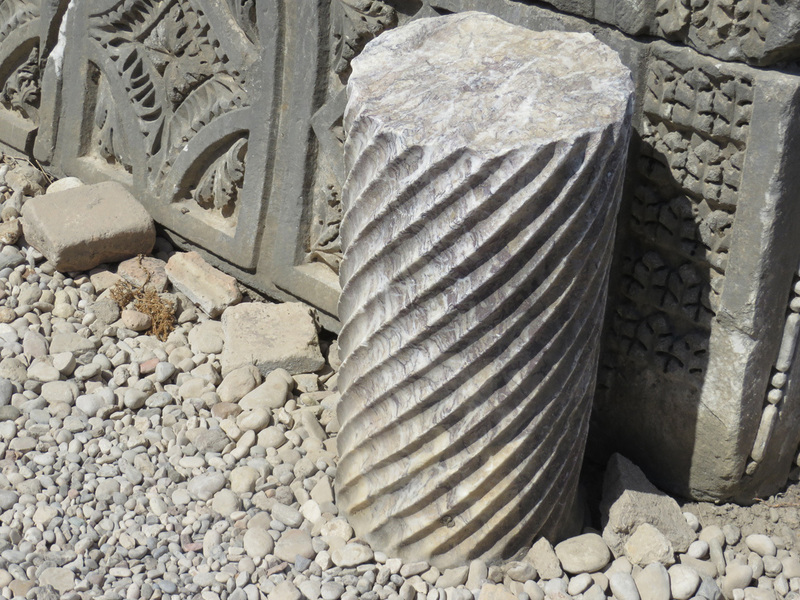 Established in about 1000 BC, it flourished during the Roman period, the time of Alexander the Great (356-323 BC). 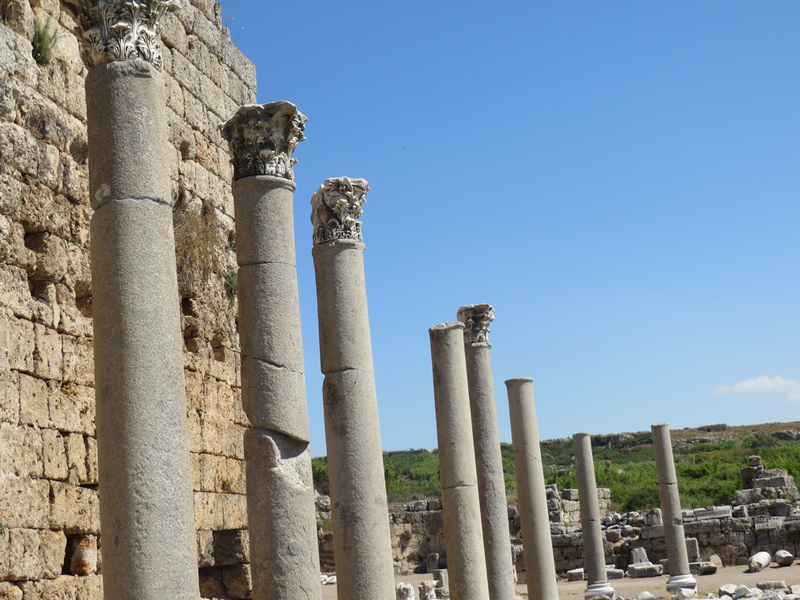 Perge was a viable metropolis until the thirteenth century. The sign at the entrance. 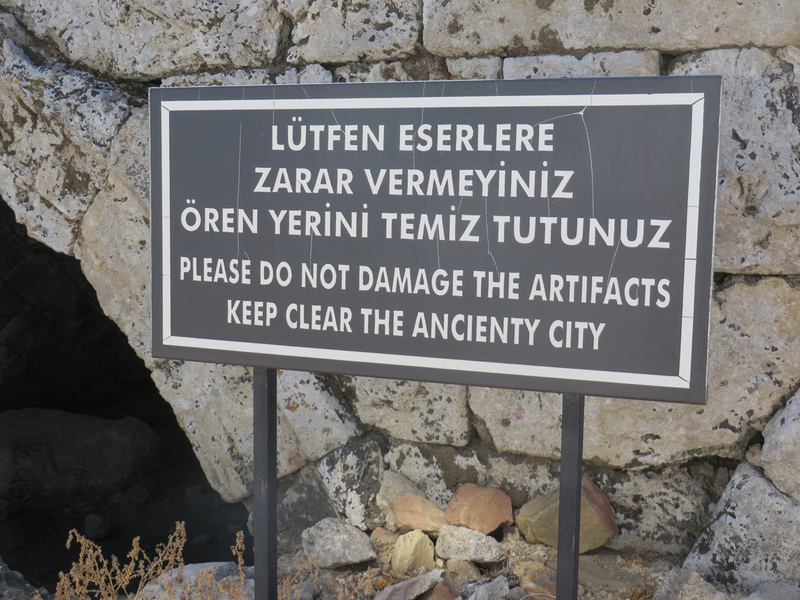 â€œKeep clear the ancienty cityâ€. Love it. 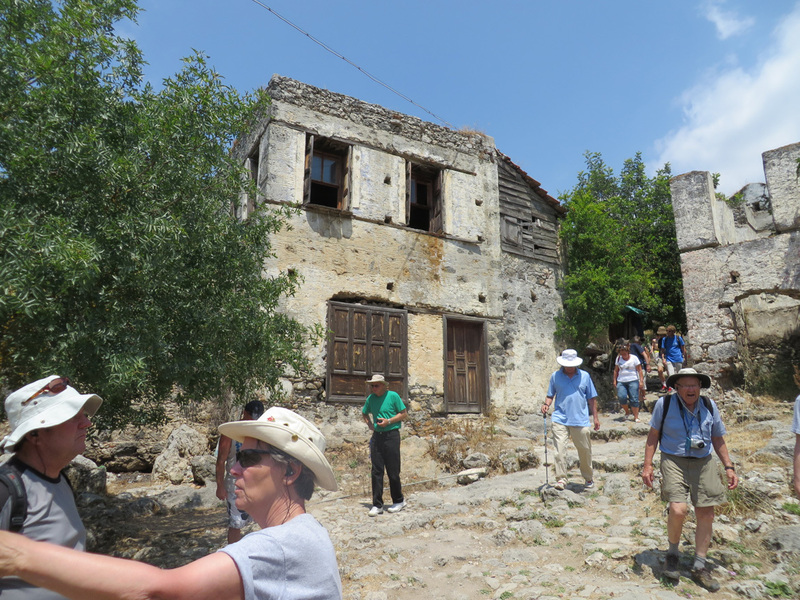 Walking to the ancienty theater. 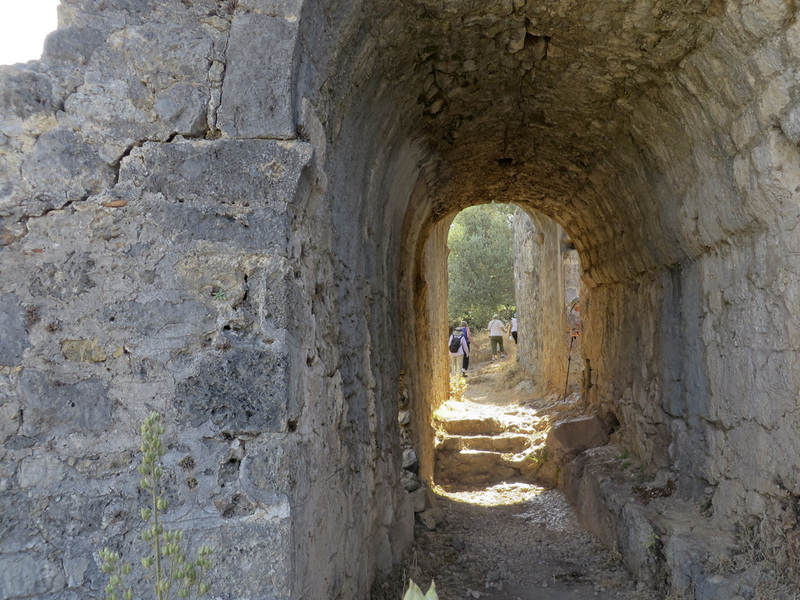 Archways into the stadium area. 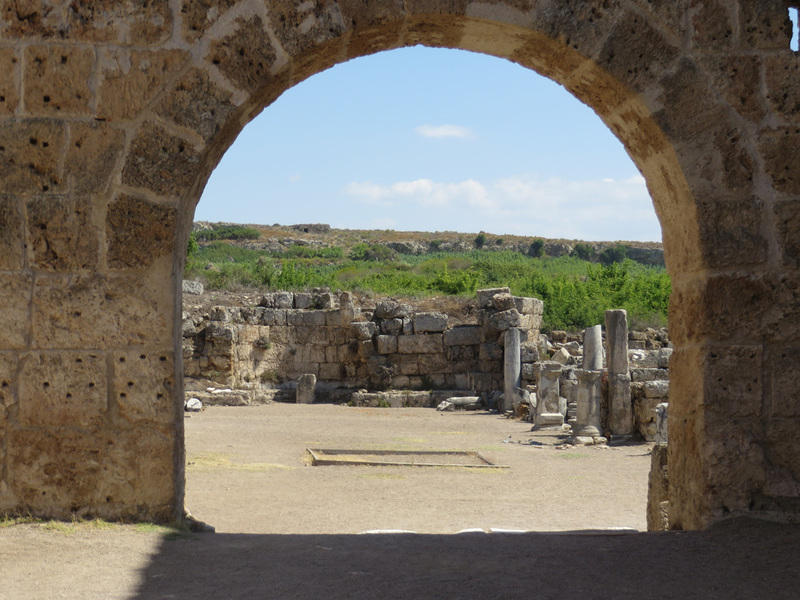 Some of the archways end not in a passageway, but in a niche or a room. 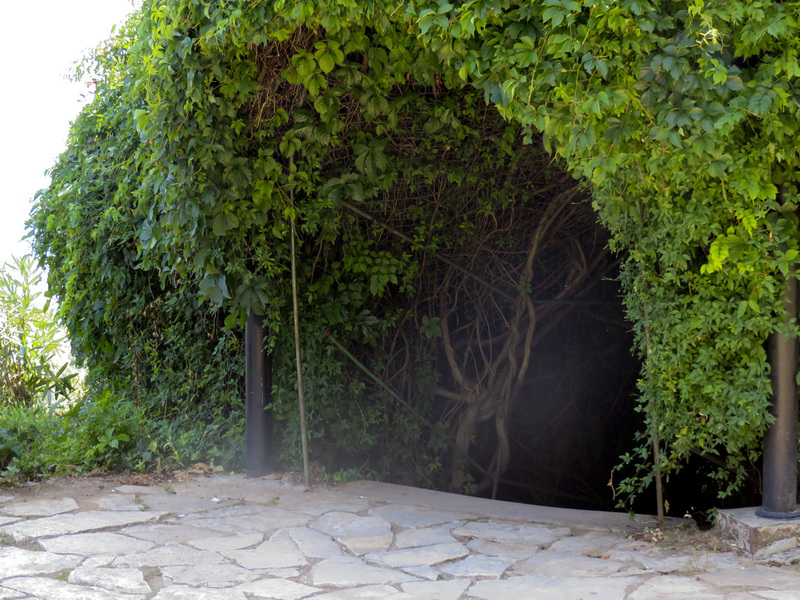 John starting through an archway. 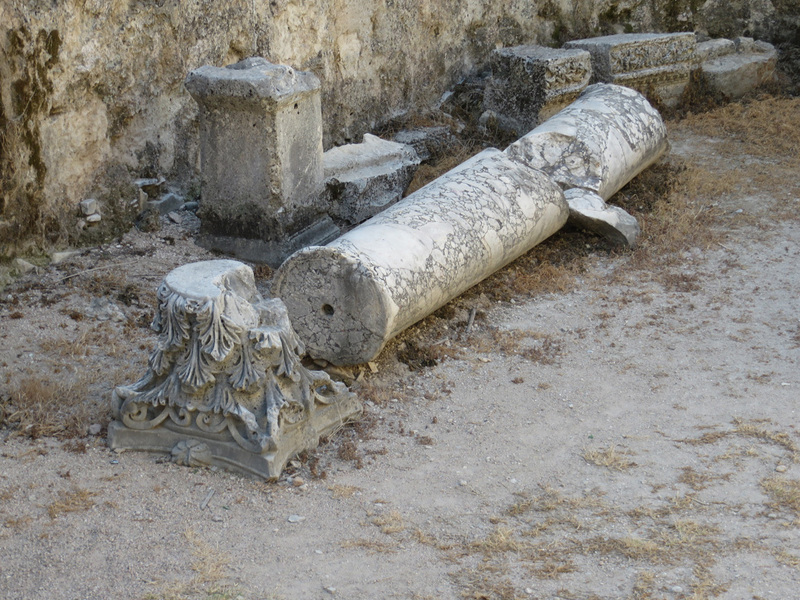 Back in the times of old, he would have handed a token to pass through the passageway to attend the games. I like the trees and the columns. 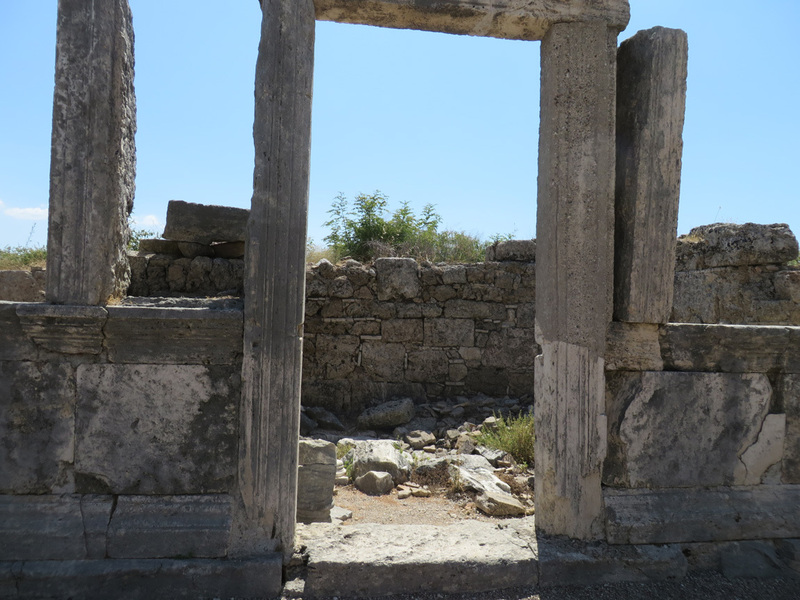 This is one of the doors into the ancient city. 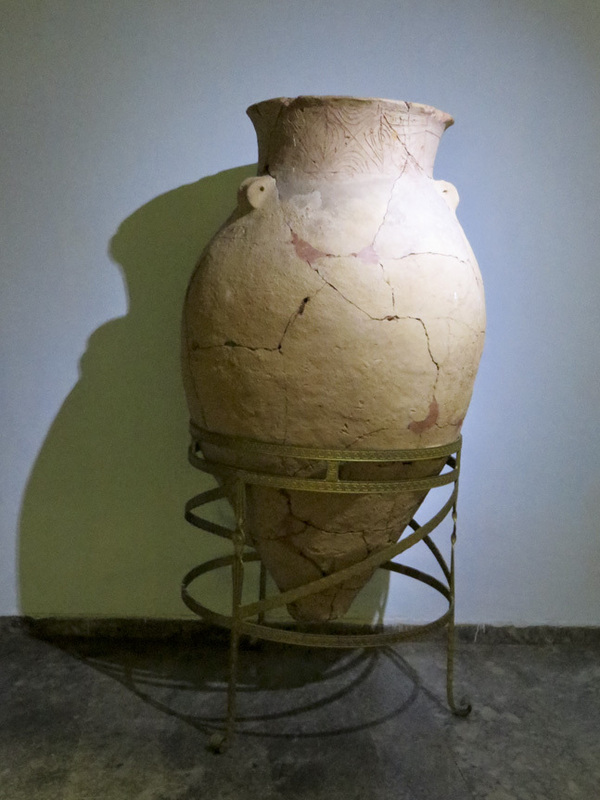 It dates to the Roman and Hellenistic times, about 3-4 AD. 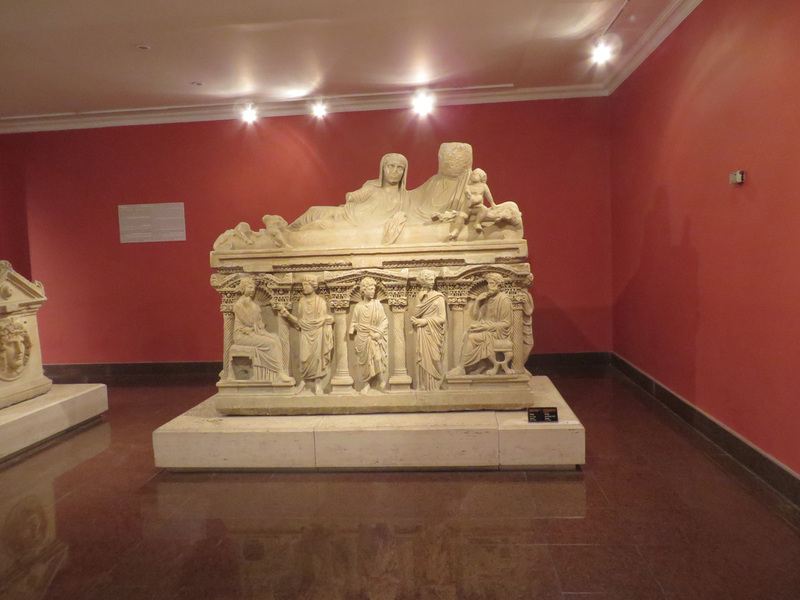 Many of the sculptures that decorated the area are now in the Antalya Museum. 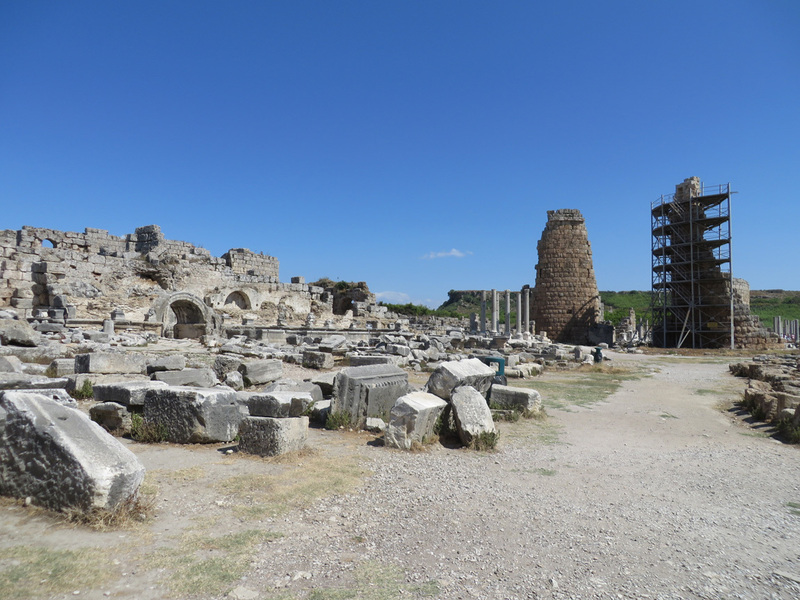 Below is a photo of a field of pieces of the structures and columns and part of a building with archways. Also notice the restoration efforts of one of the towers. 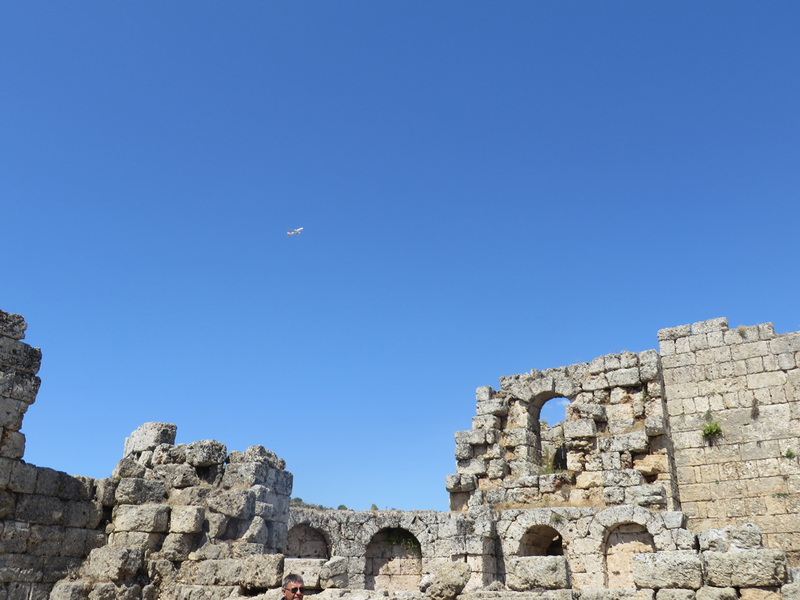 The old and the new: a jet above the ruins. 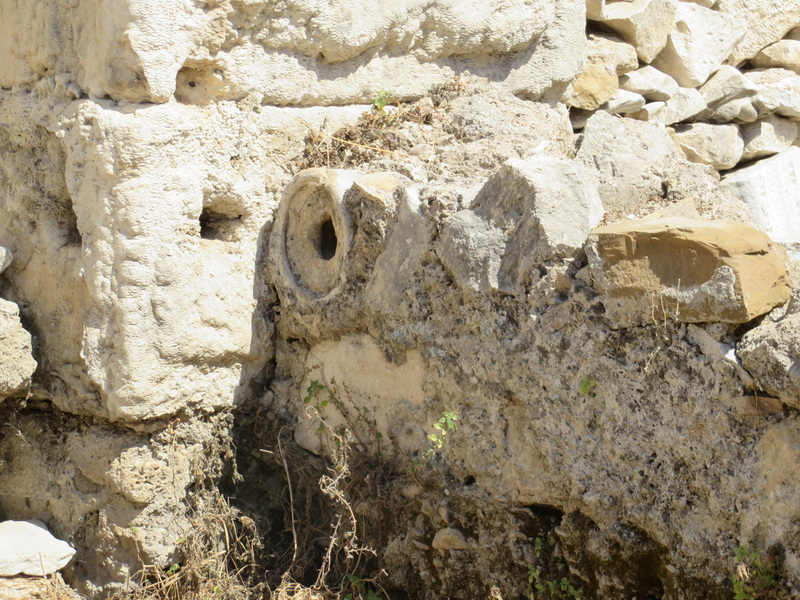 All of these ruins were buried by time. 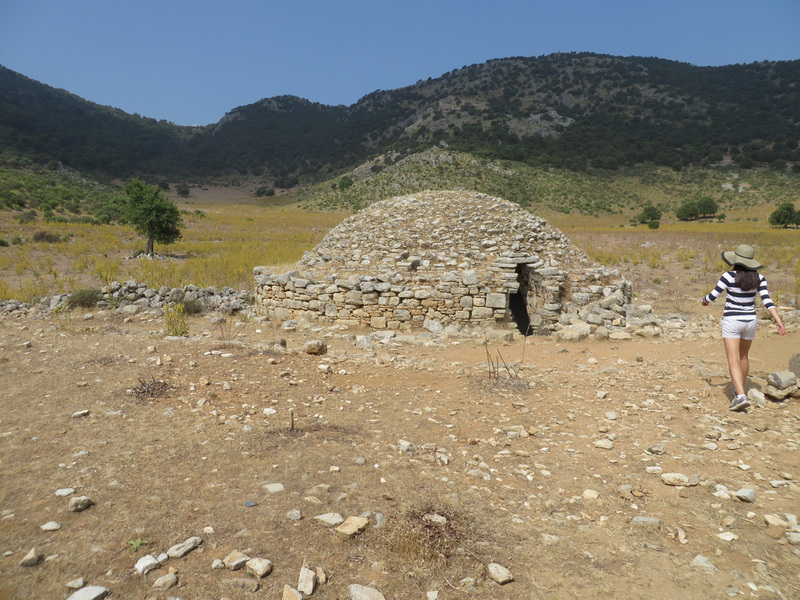 On the top of these half-downed structures, you can see earth and grasses growing. Amazing what they found under the dirt. Earth on top of building. 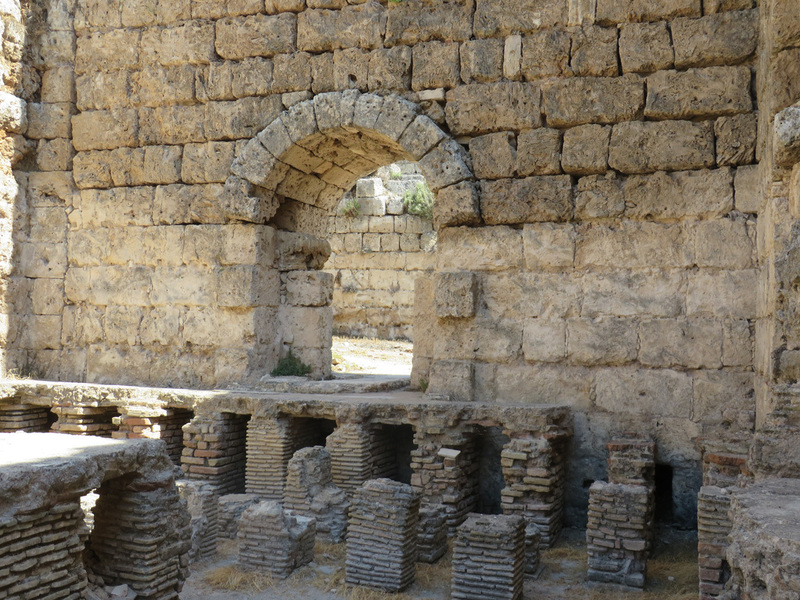 Rooms that served different functions like the dressing room (apodyterium), cold bath (frigidarium), warm bath (tepidarium), hot bath (caldarium), and exercise area (palaestra) were lined side by side and offered maximum utility to the bathers who had the chance to pass from one room to another of their choice. 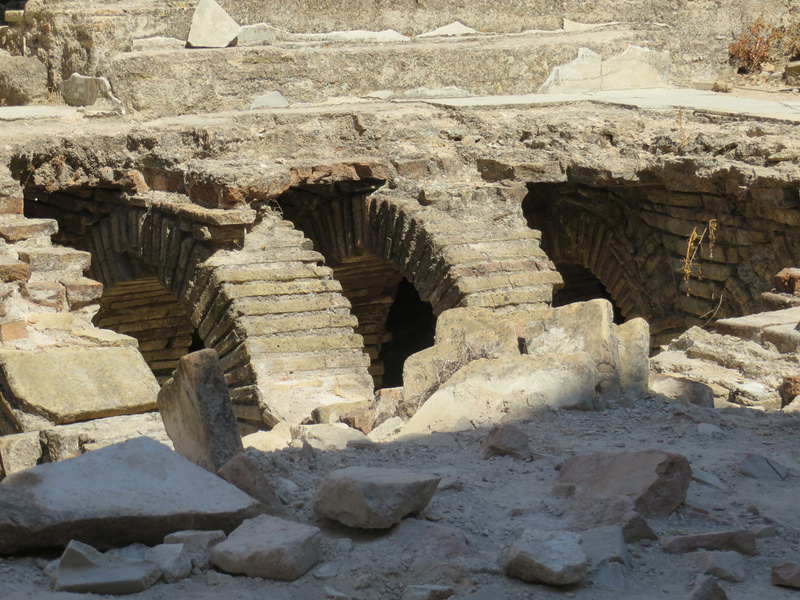 The heating system (hypocaust) can be seen beneath the pavement of some rooms today. 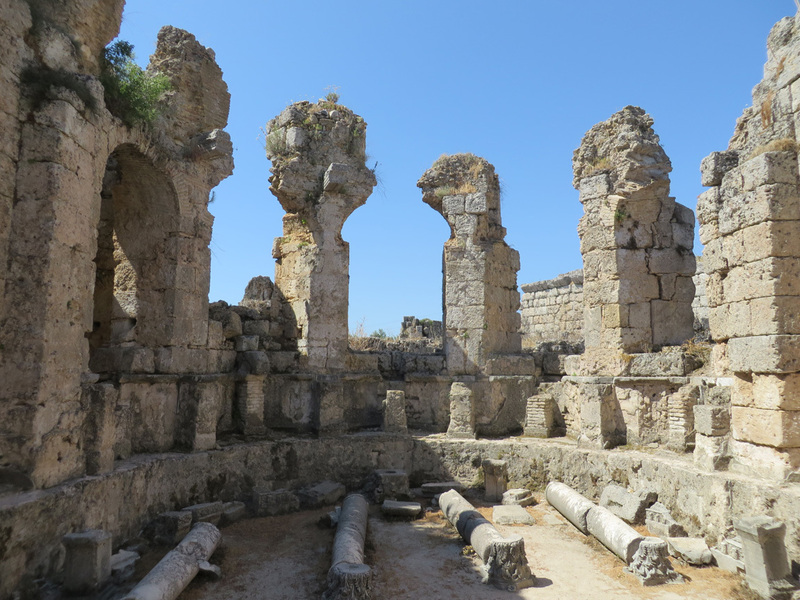 The south baths in Perge also included rooms for intellectual activities, thus preserving the traditions of the Greek gymnasia. The yard outside the palaestra. 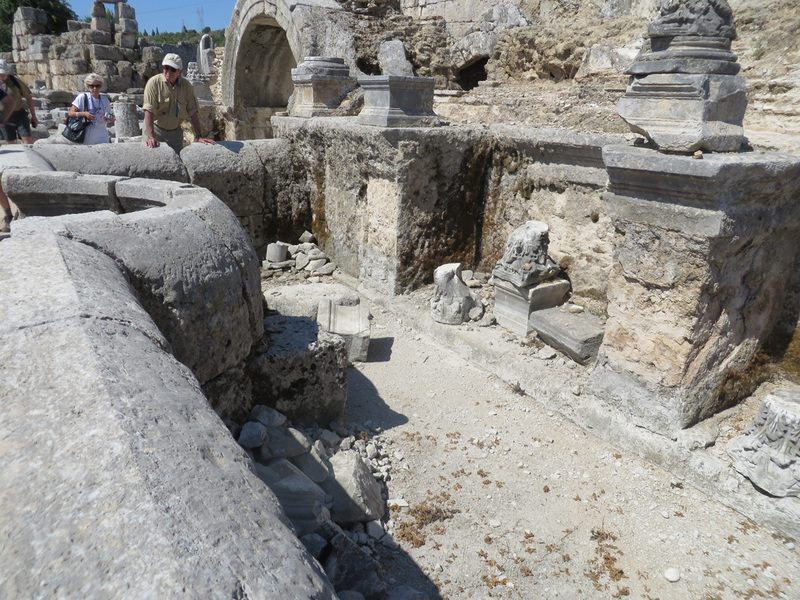 This was once a small store, or stall, where goods were sold. 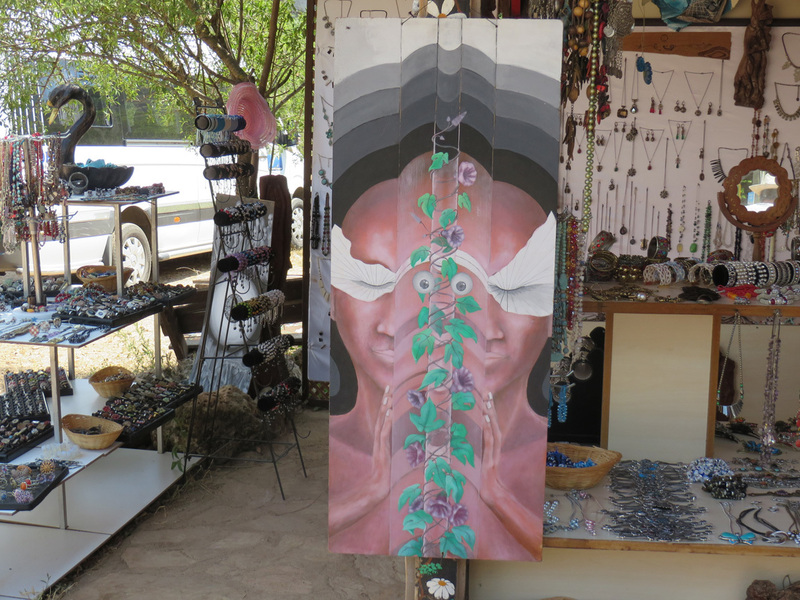 What do you think was sold at this stall? 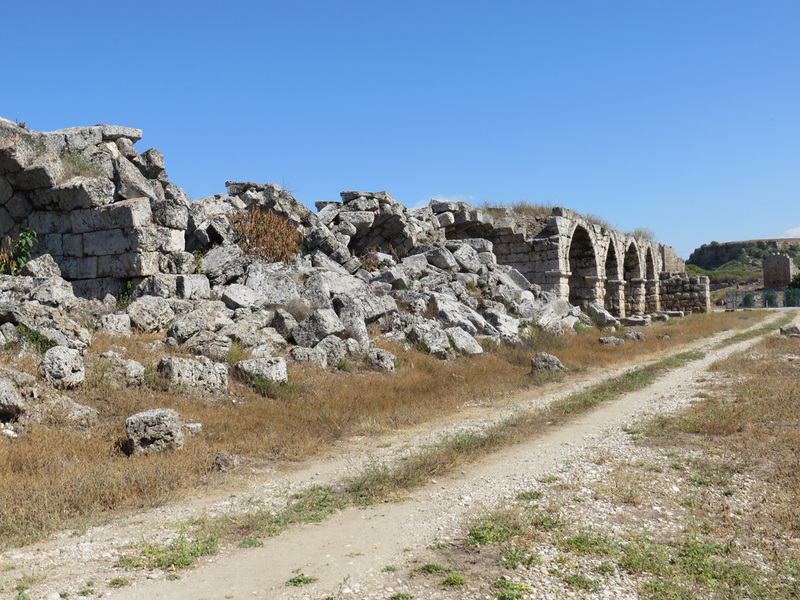 Water canal from the Roman age, and the remains of a road. 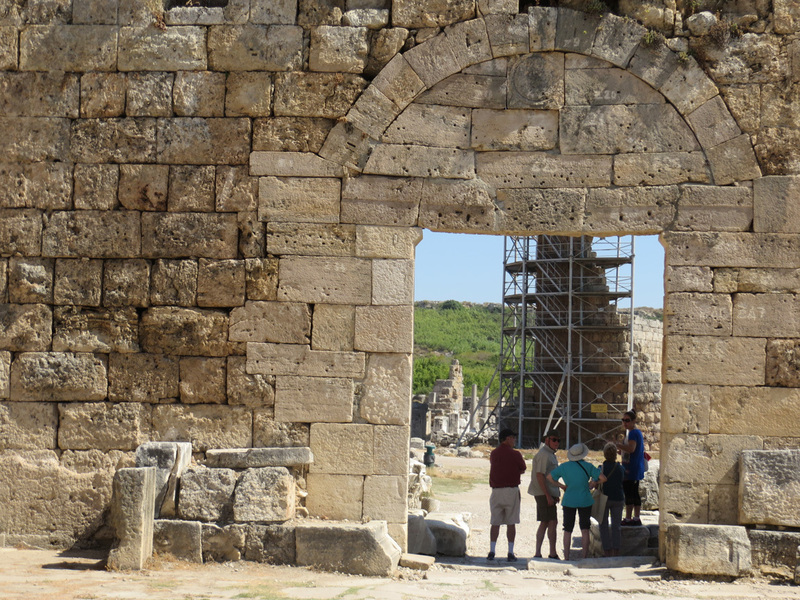 After two hours at Perge, itâ€™s time to make our way back to the bus. And of course first, the WC. 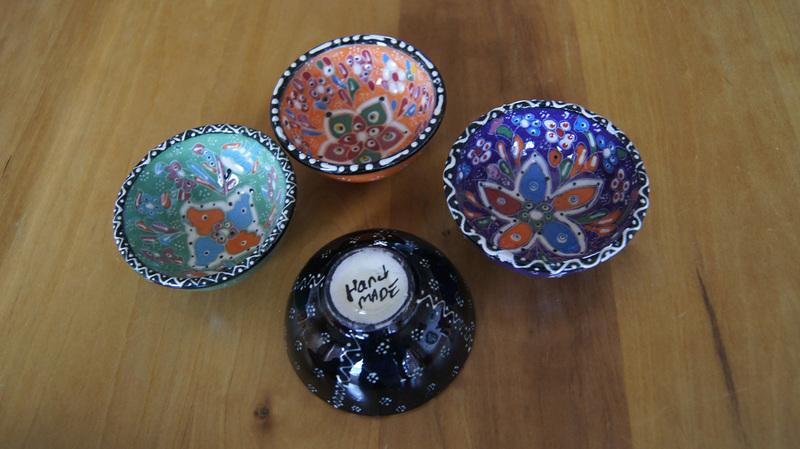 I spent a few dollars on some small souvenir bowls to use for mese en place. 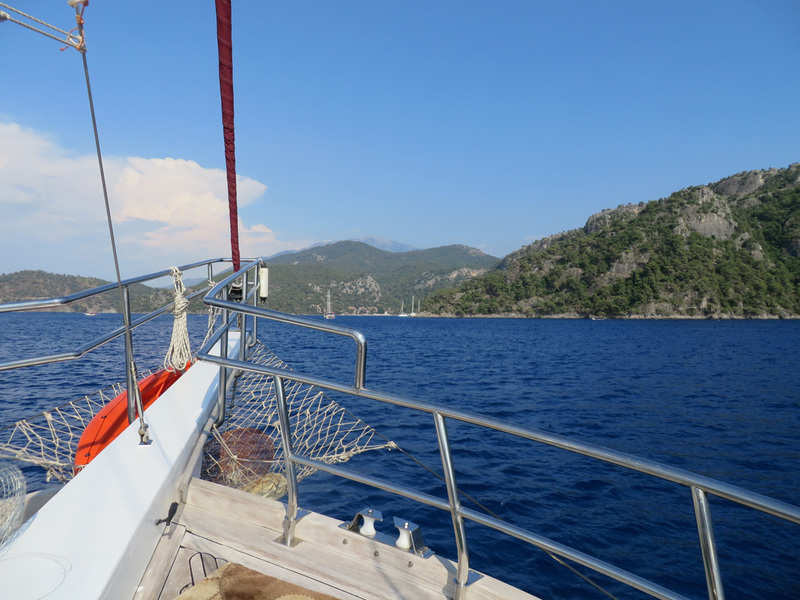 Sadly, we took our last short jaunt on the gulet. We disembarked and picked up our recovering tourmate from the hospital. 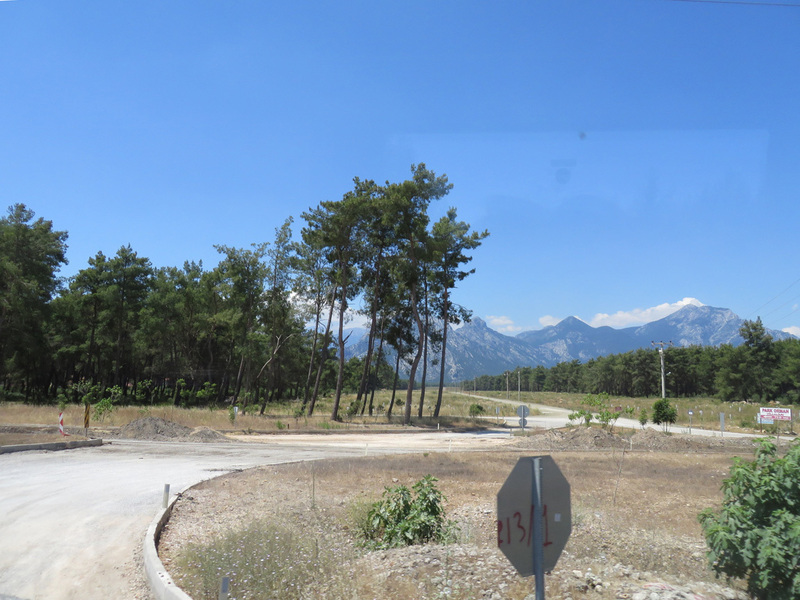 By 9 am, we were on the bus bound for the resort town of Antalya, over 3 hours (about 100 miles) away. 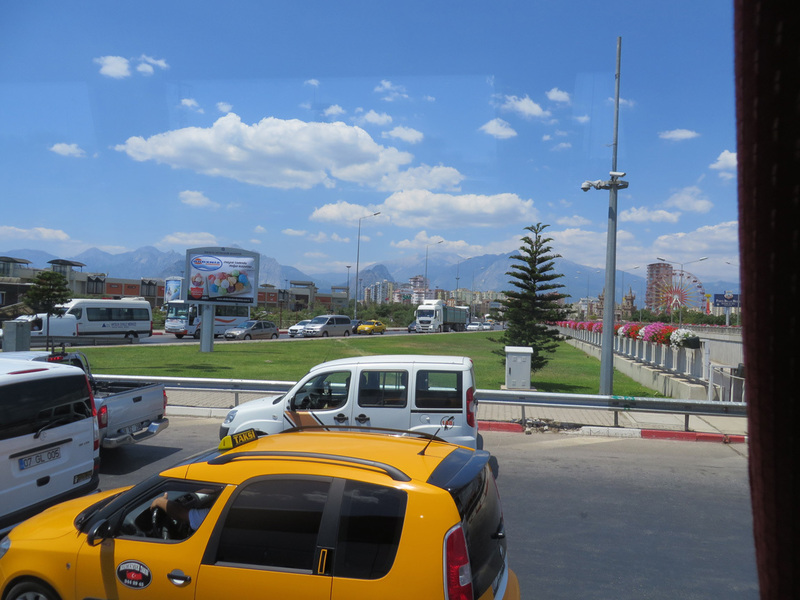 The highway skirted the snow-capped Taurus Mountains that rise sharply from the fertile plains of the Anatolia peninsula. 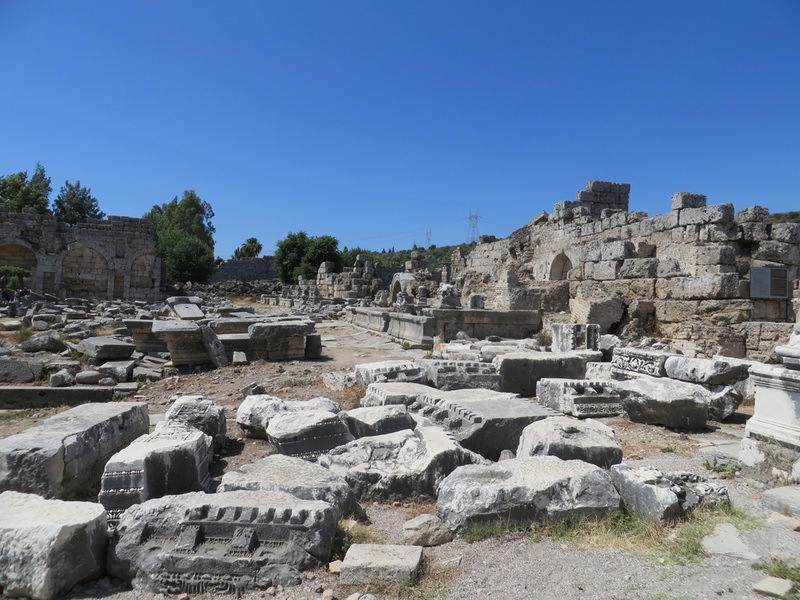 We passed more marble quarries, and a lot of road construction. 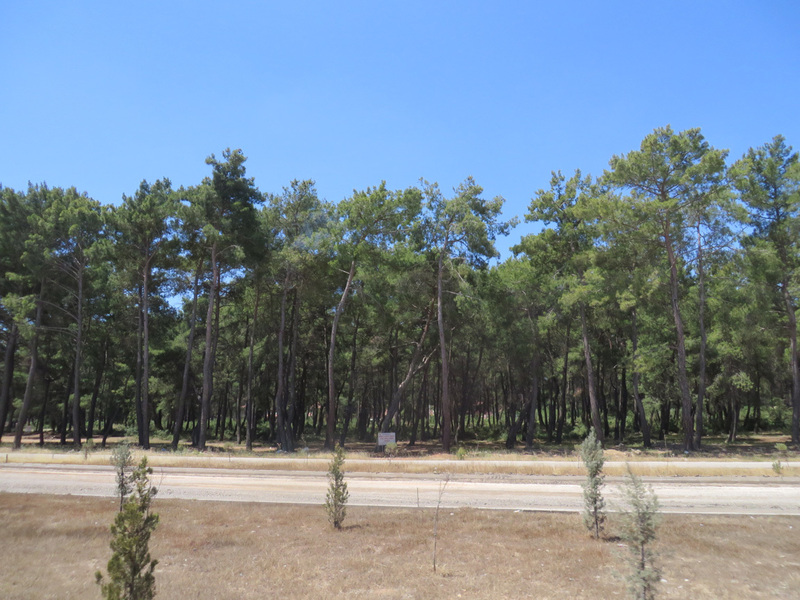 These are the neatest pine trees. 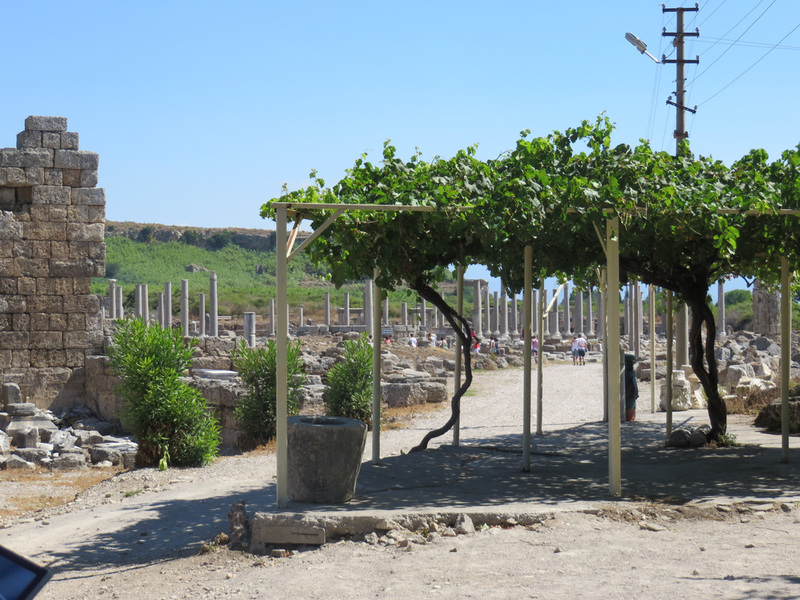 As we viewed the fertile lands of Turkey, Ali talked about Turkey working to join the European Union (EU) and the impact this has had on agriculture. To join the EU, Turkey must enforce the â€œSeed Lawâ€, which regulates what seeds can be sold and planted. 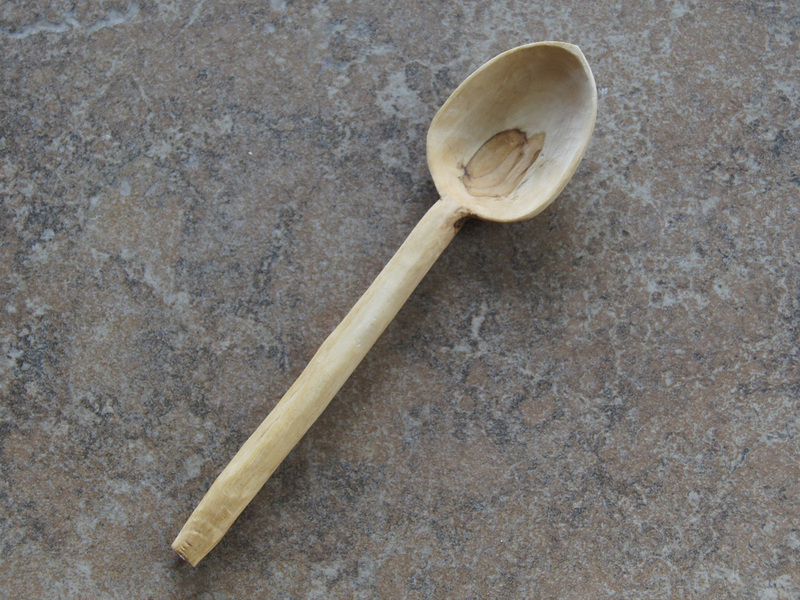 Many farmers believe that their own seeds, derived from centuries of tradition, grow better tasting and sturdier plants, and keep necessary diversity in crops. Read more if you are interested in this controversial topic. 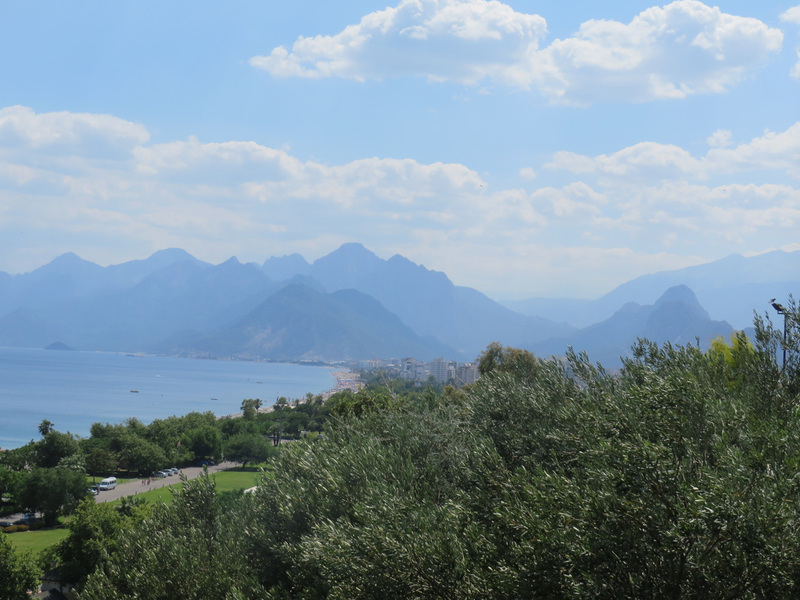 We arrived in Antalya a little after noon and enjoyed lunch with our group at a restaurant overlooking the Mediterranean. 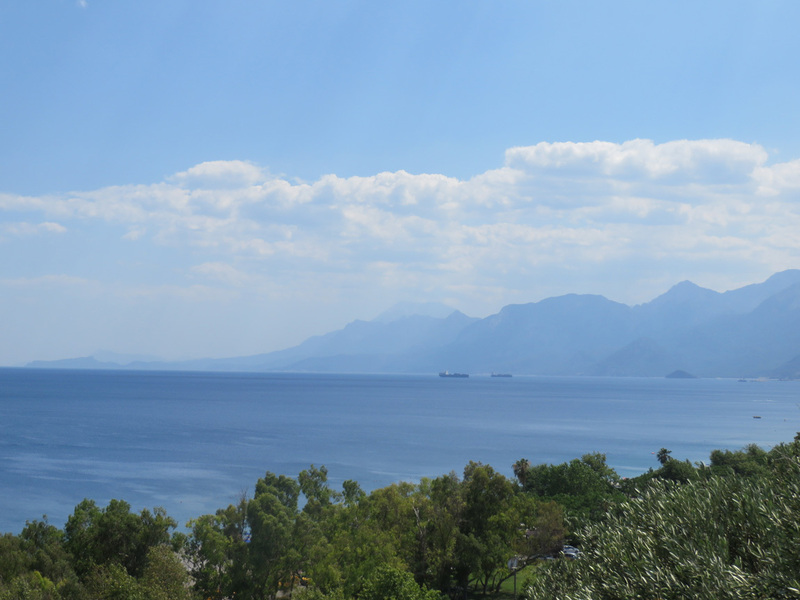 Mountain peaks rise dramatically straight up from the sea. Our meal was kabobs and meze, fruit for dessert, â€œsame old same oldâ€, but these were about the best we had on the entire trip. 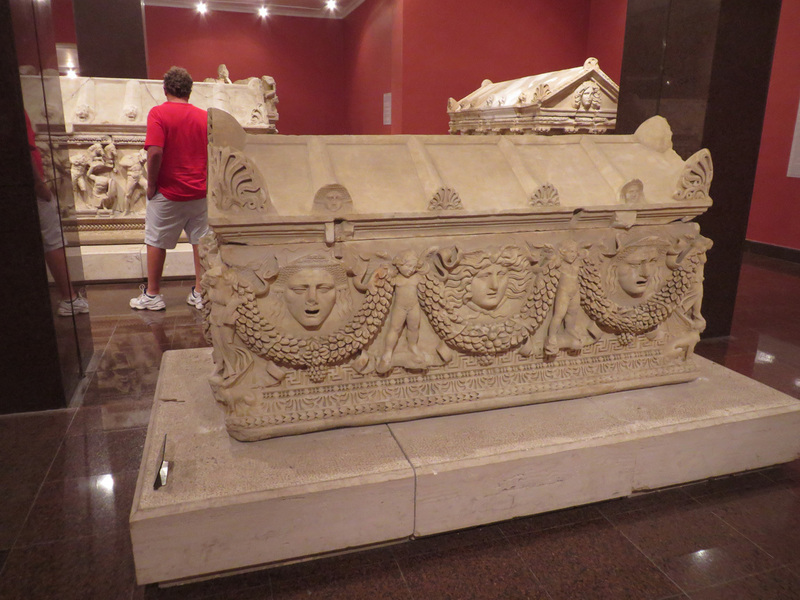 Before we checked into our hotel, we visited the Museum of Archeology. 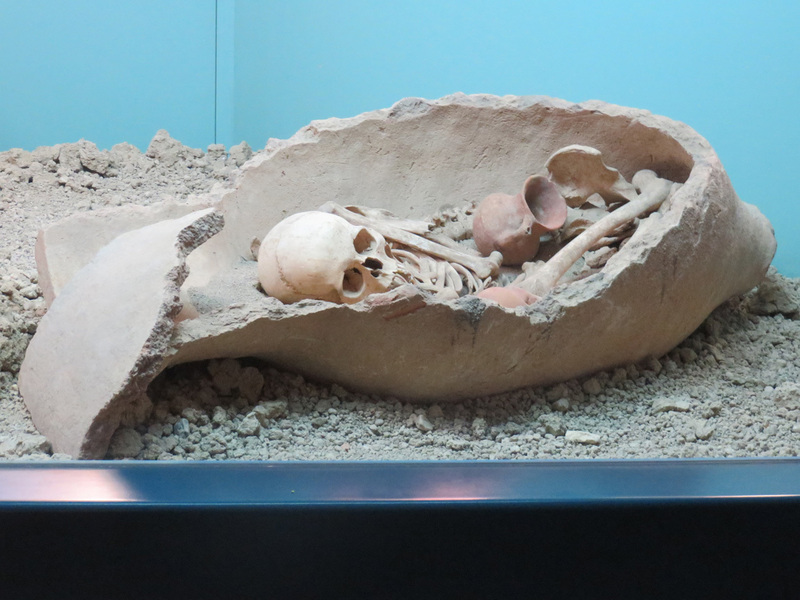 Bones in a burial jar. Plates - with chickens: I couldnâ€™t resist a photo. 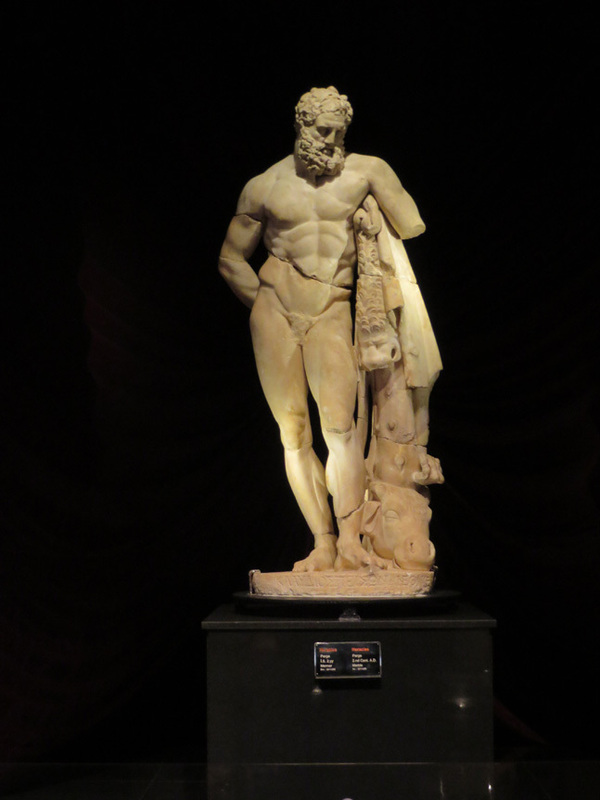 The statue of Herakles is the Roman period copy of original bronze statue "Herakles Farnese" which was made between 330-320 AD by Lysippos, one of most important personalities of world sculpture history. There are approximately 60 copies of aforesaid statue and can be seen in as many little bronzes. Sorrowful, introverted and pathetic expression of the statue is one of the main features of late classical - early Hellenistic period. 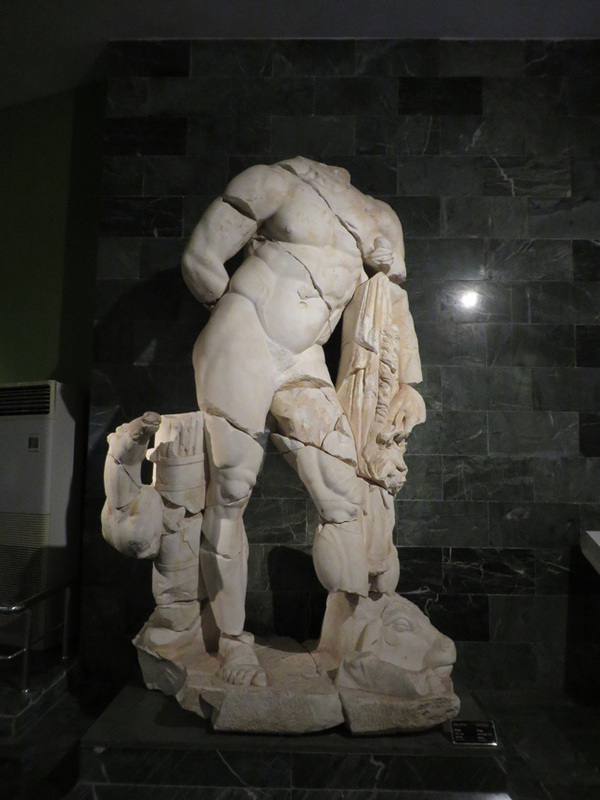 The upper part of the body and the head of the Statue is in a leaning position toward the front and right shoulder. The hair and the beard are thick and curly. 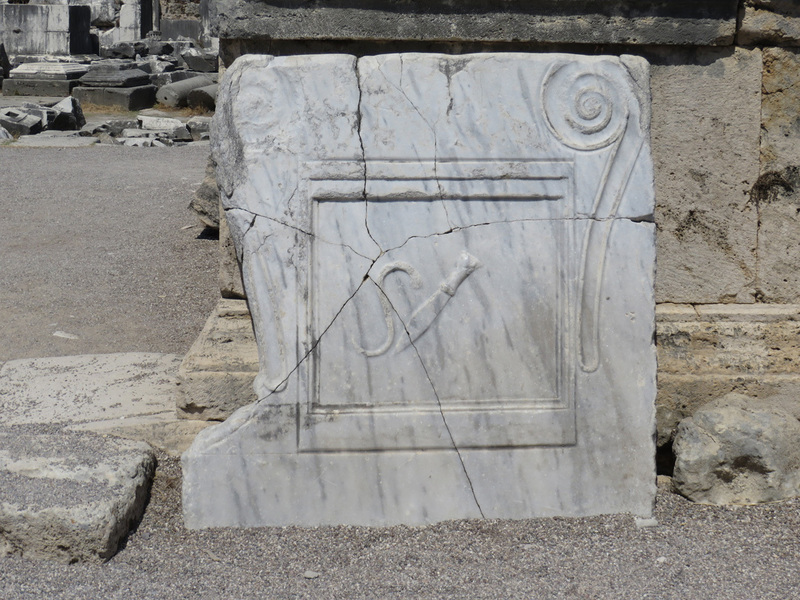 His body has "s" shape due to his leaning upon the stick and with the fur of Nemea lion beneath his left arm. Body muscles especially in the chest and stomach are distincltly visible. 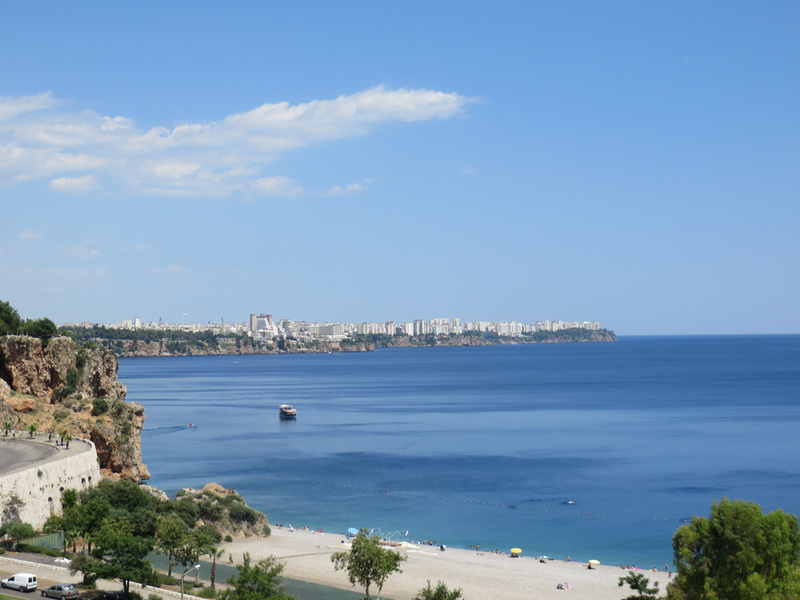 Our hotel is the Rixos Antalya Downtown. 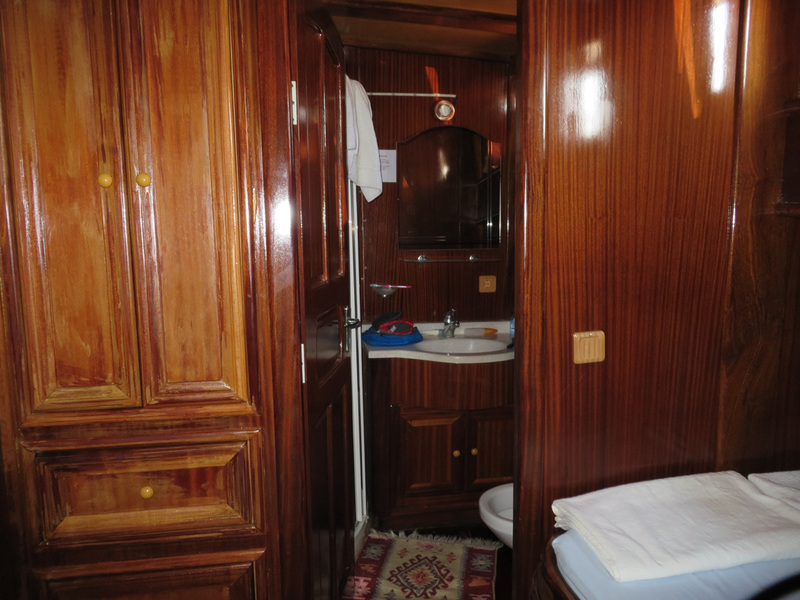 Quite luxurious, to say the least. 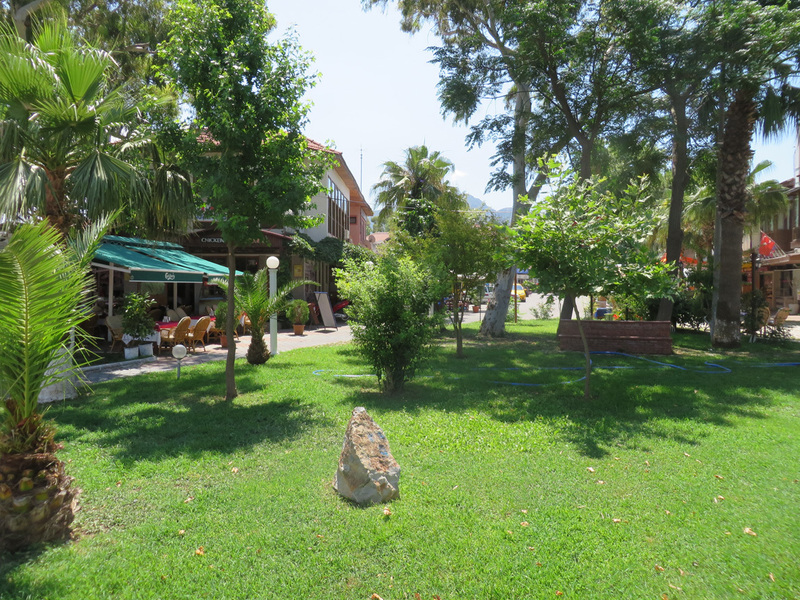 A couple outdoor swimming pools and lovely gardens. Grand lobby. Bowls of chocolates. (We scarf them up, weâ€™ve been without sweets for too long.) Glass elevator. Great restaurants. 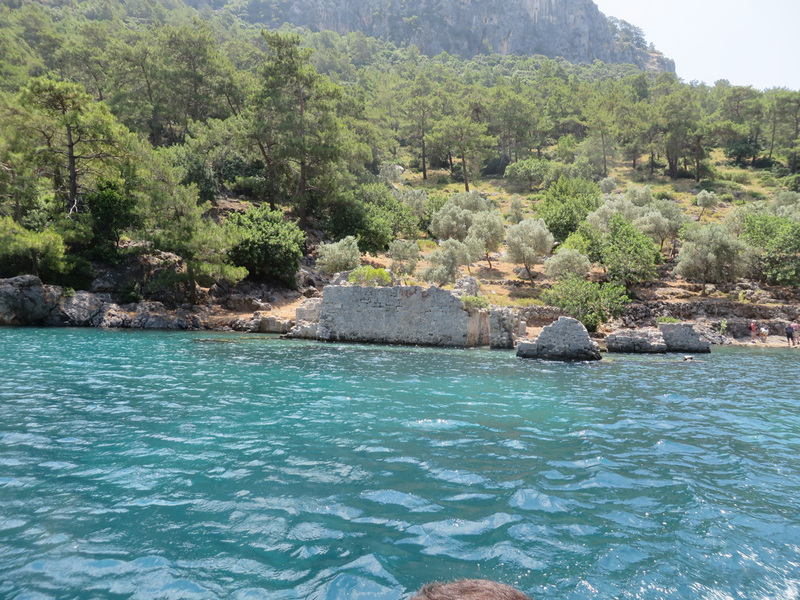 We enjoyed a swim in the pretty pool, but sort of missed the warm sea swims off our gulet. Dinner is on our own tonight. In the late afternoon we walked down a bunch of steps to the long beach. 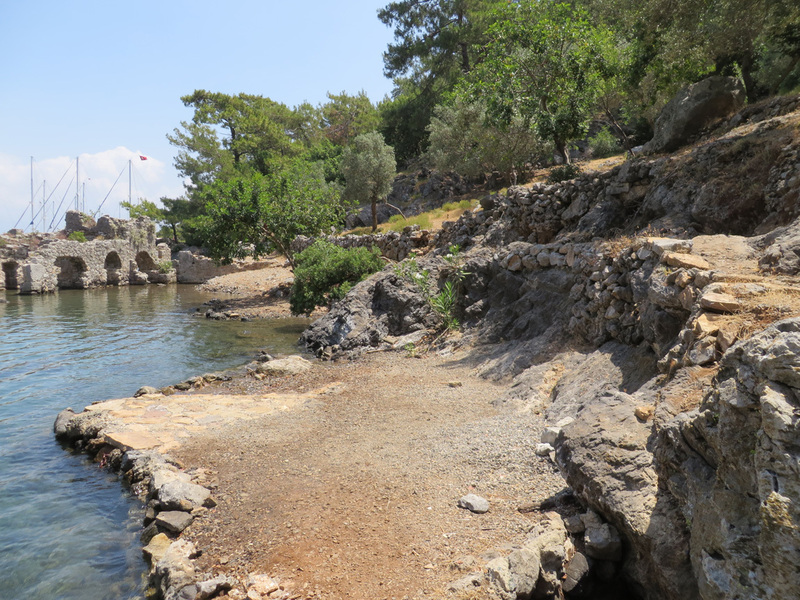 There is a walkway along the shore, with public beaches off to one side and little shops and restaurants to the other. So interesting to watch the people. 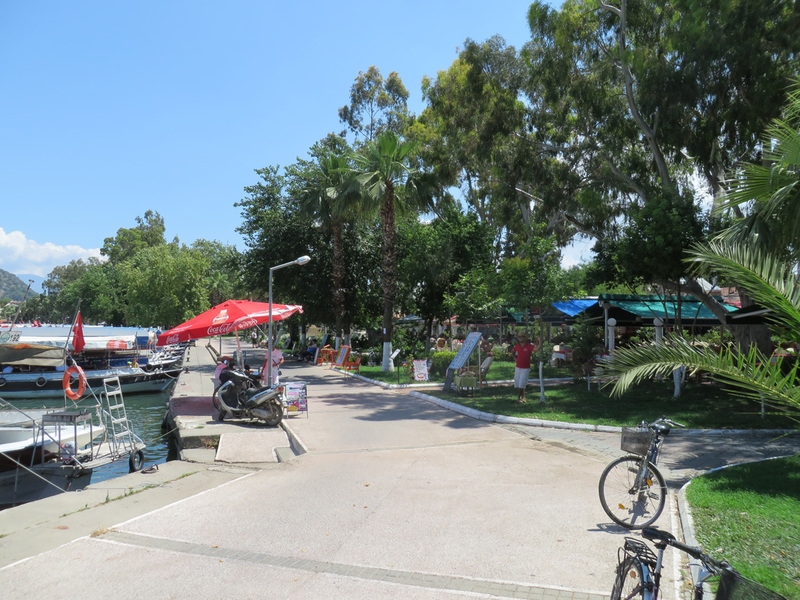 We wandered for awhile, then found a beach bar and had Ezes. Later yet we found a pizza place frequented by locals. The restaurant had tables set up in an area that looked more like someoneâ€™s backyard than a restaurant. Parents watched their kids play on the swings and slides while they smoked and drank and talked with friends. The pizza was excellent. A small cat that was marked like Tori asked for a piece of my pizza. She had a malformed paw and daintily accepted just one piece of cheese and stopped begging. 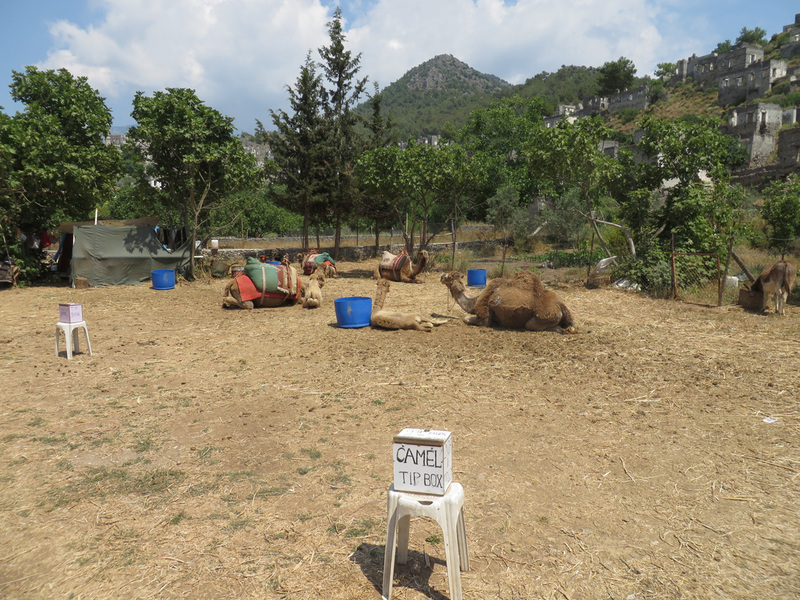 Tomorrow is our last full day in Turkey. We make our way back up the long set of steps and stretch out in our big beds in the fancy Rixos hotel. We had a long cruise to our nightâ€™s mooring. 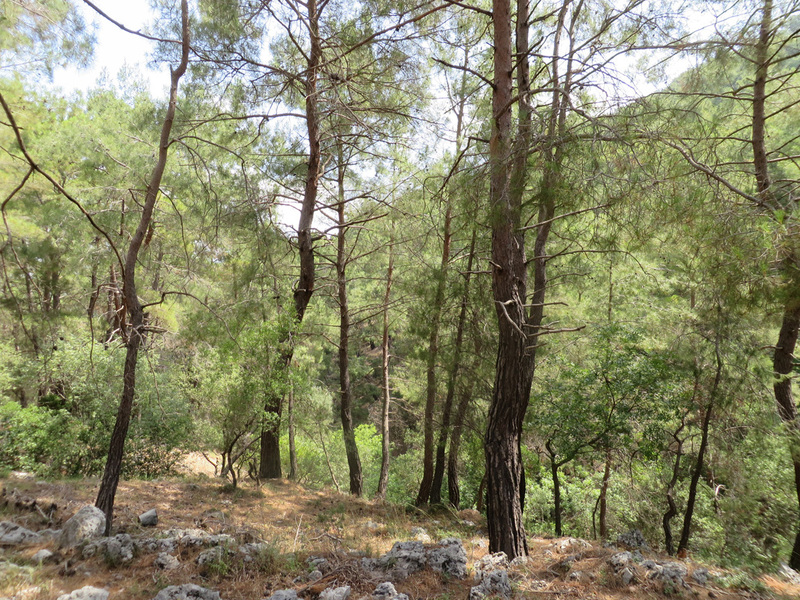 I enjoyed the scenery, especially the way the land rises sharply in some areas. Hang gliders rose on the thermals. 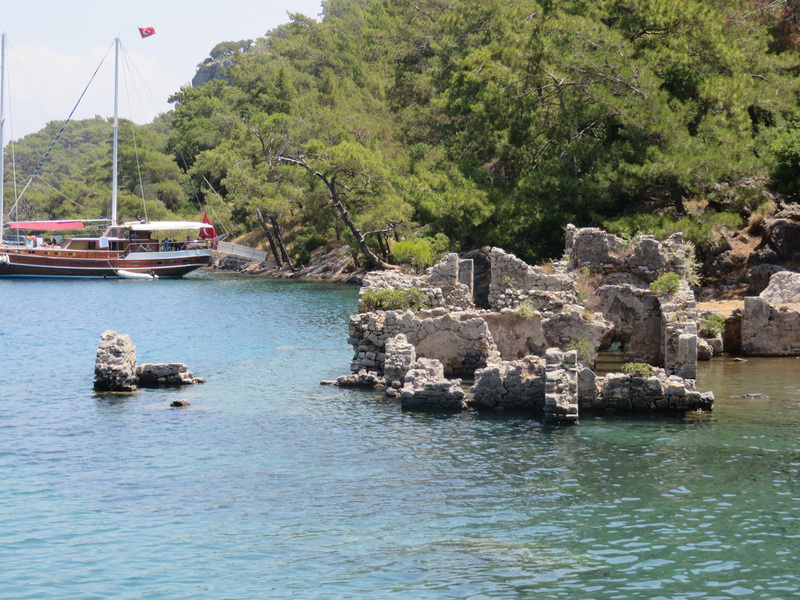 Turquoise waters, interesting rock formations. 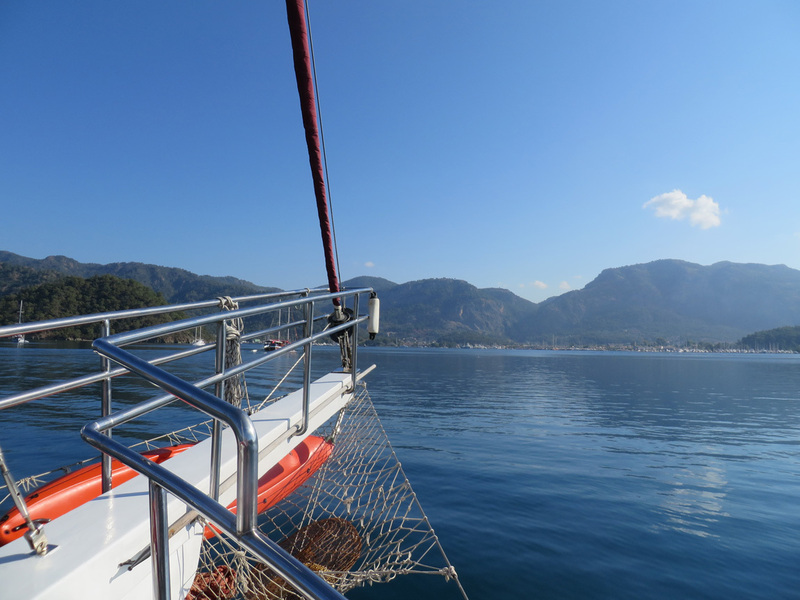 On the way to our mooring near Fethiye. 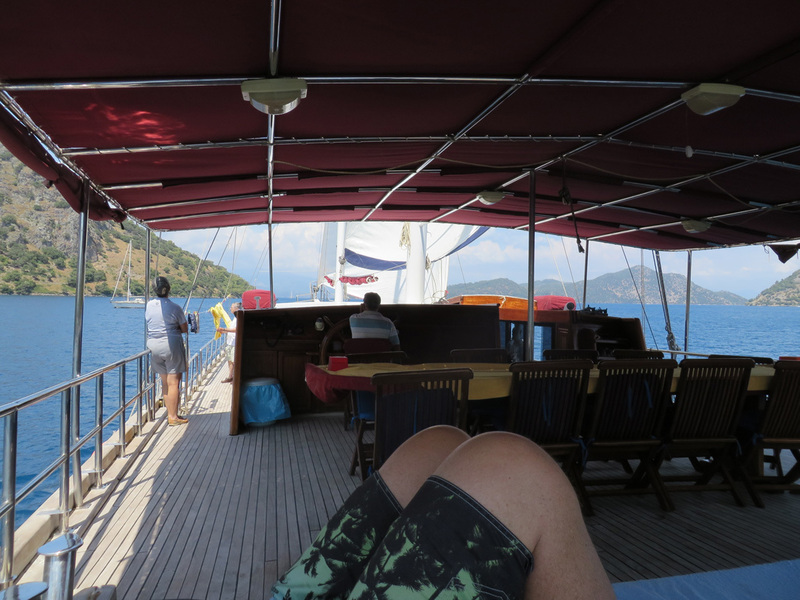 This is our last night on the gulet. 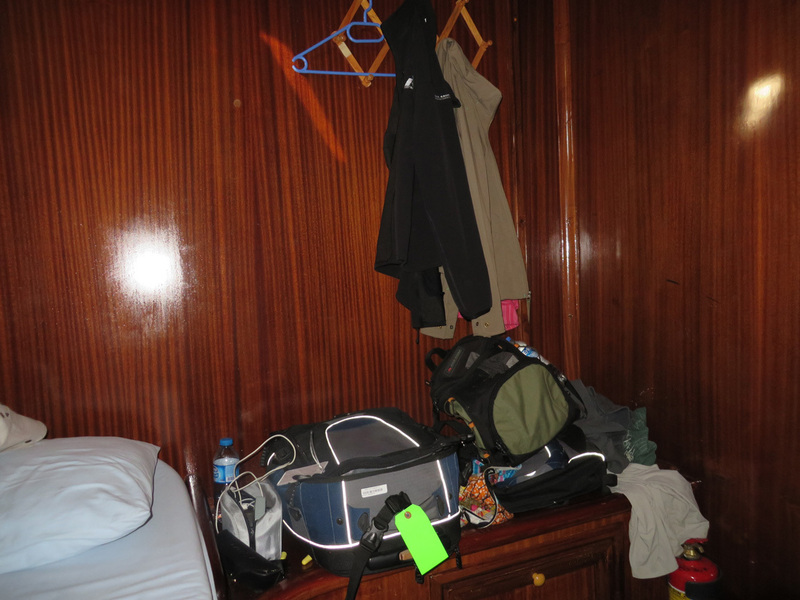 I took a few photos of our room, to remember and to share. 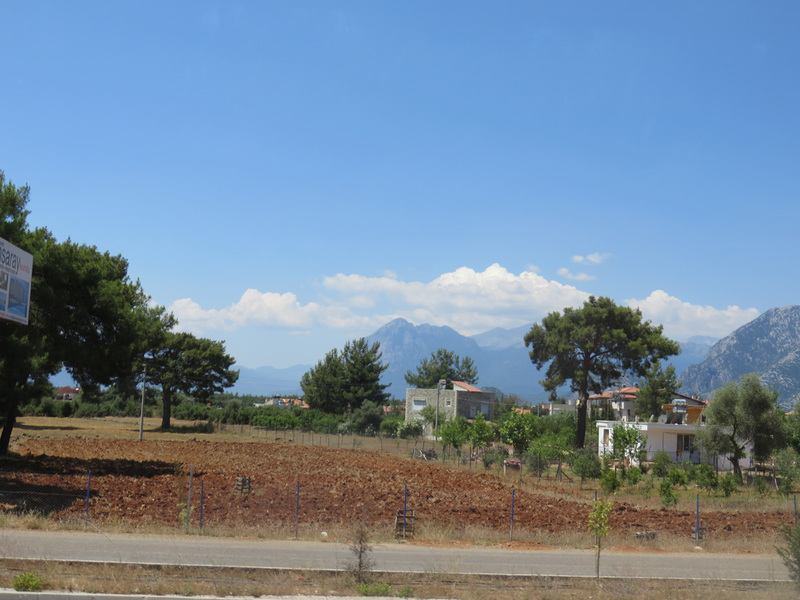 One of our tour members had to go to the hospital, so we moored near a road, near Fethiye. 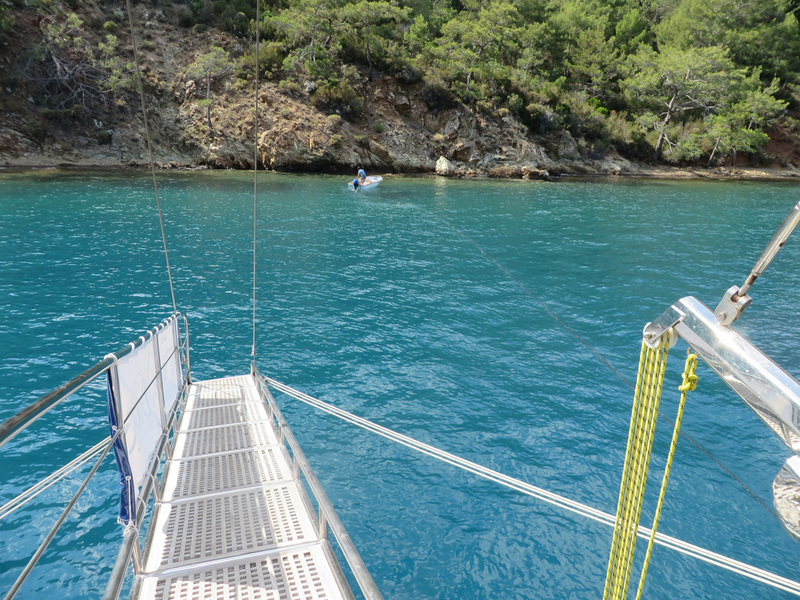 The cove was less secluded than our other nights on the gulet. One boat full of Turkish partiers was pretty noisy late into the night. Still, we were able to sleep. While we slept, the protests in Taksim Square erupted into violence. When we were able to access the internet on June 16, we saw photos of the Divan hotel that we had stayed in, with protesters inside the lobby suffering from tear gas and pepper spray laced water cannon blasts. Maybe some of the same friendly protesters we met just a week before. World News - Tear gas fired inside hotel in Turkey protest crackdown. If you watch the video, you will see our Divan hotel lobby full of tear gas. News article from CNN, June 15. You can scroll through the photos and see our hotel in a few. 1923. 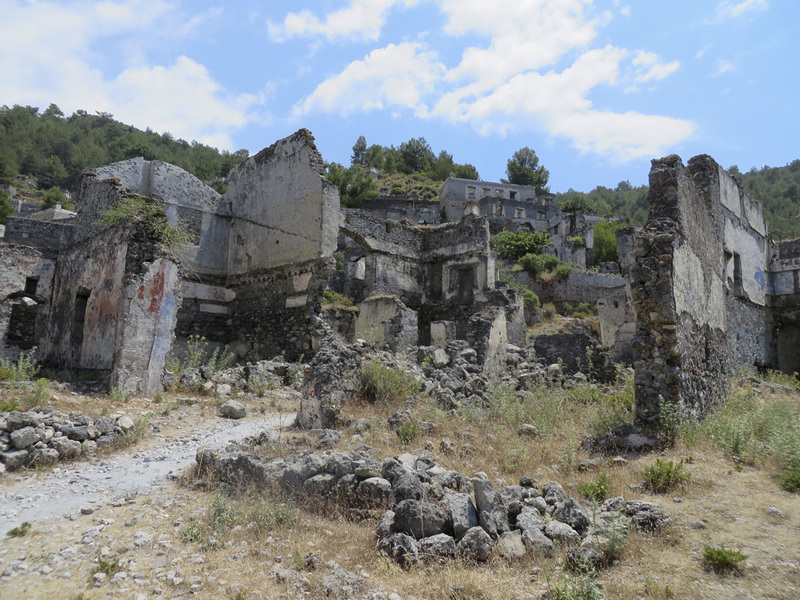 Two thousand residents of the Greek Christian town of Kayakoy, Turkey, are forced to evacuate their homes and move to Greece. 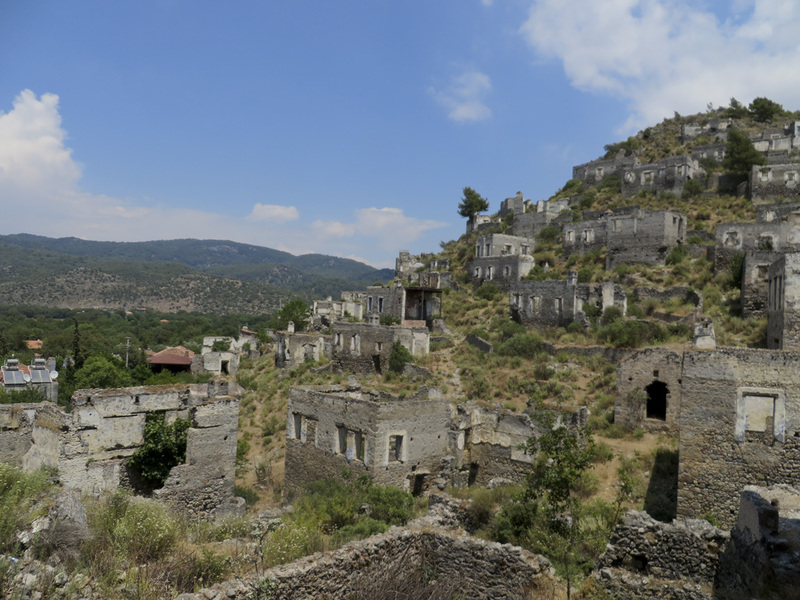 Turkish residents in Greece are forced to move to Turkey, but they do not move into Kayakoy. 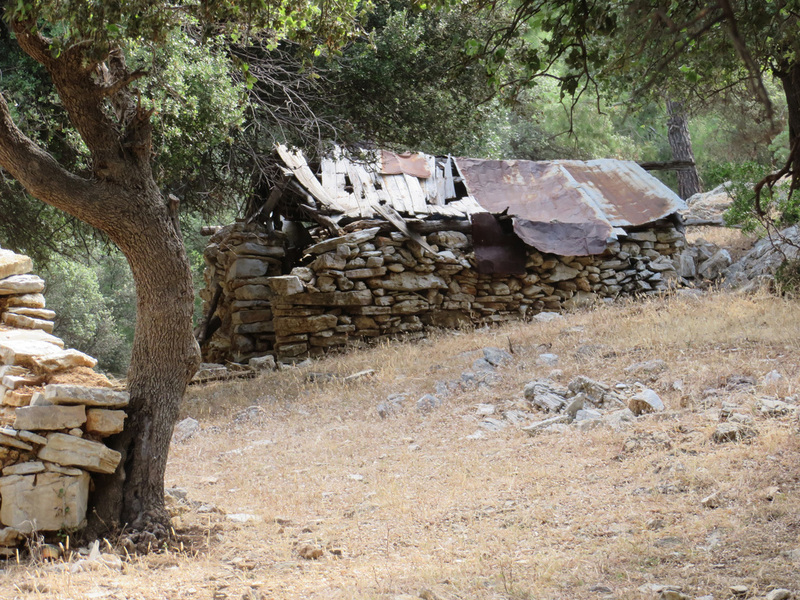 The old homes still lie abandoned, partially crumbled by the ravages of nature, including an earthquake in 1957. 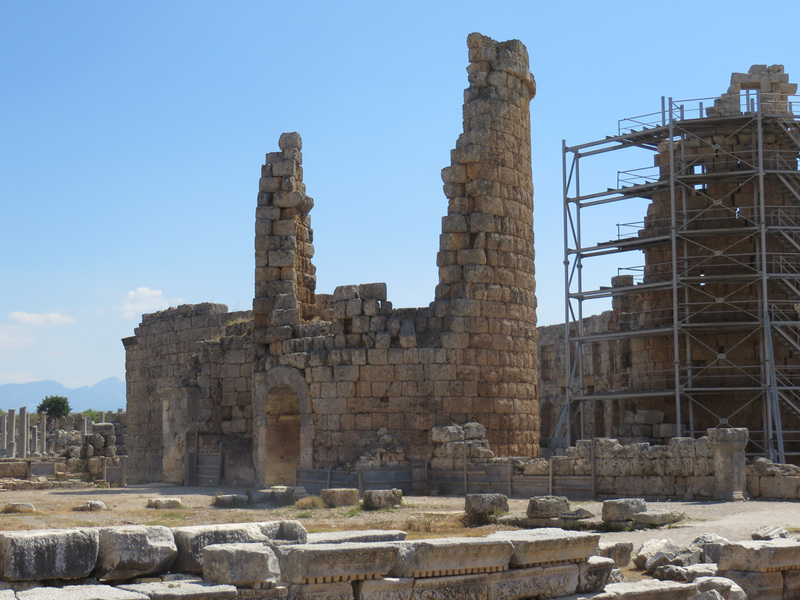 Why did the Greek-Turk population exchange happen? The Greeks fought the Turks from 1919-1922, a war won by the Turks and that led to the establishment of the current Turkish democracy. A lot of peopleâ€™s lives were disrupted, and not just by the war itself. 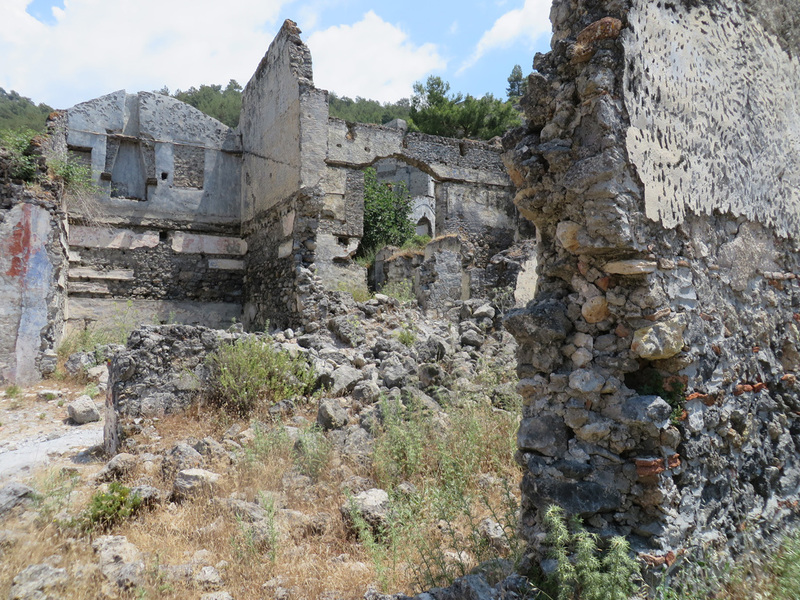 As part of the treaties signed in January 1923, the Convention Concerning the Exchange of Greek and Turkish Populations forced 1.5 million Greek Orthodox Christians to move to Greece and 500,000 Muslims to move to Turkey. 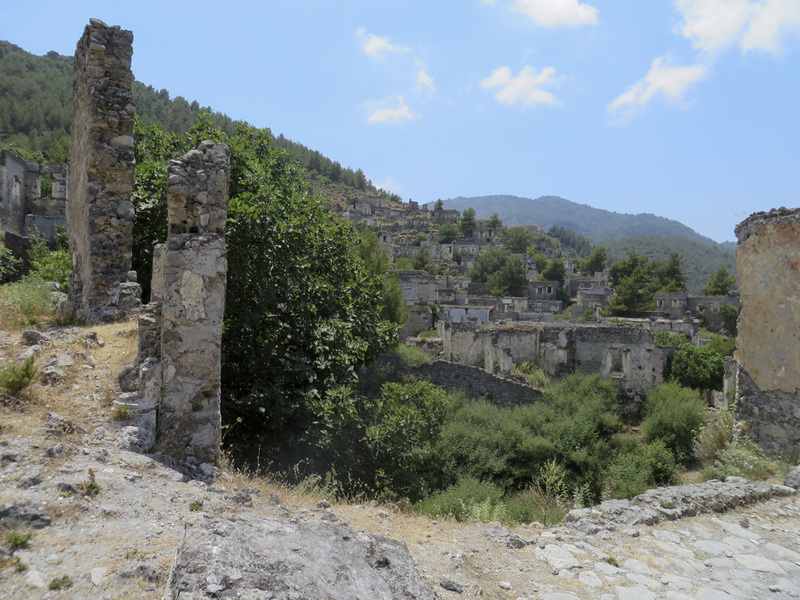 This uneven exchange left towns like Kayakoy abandoned. 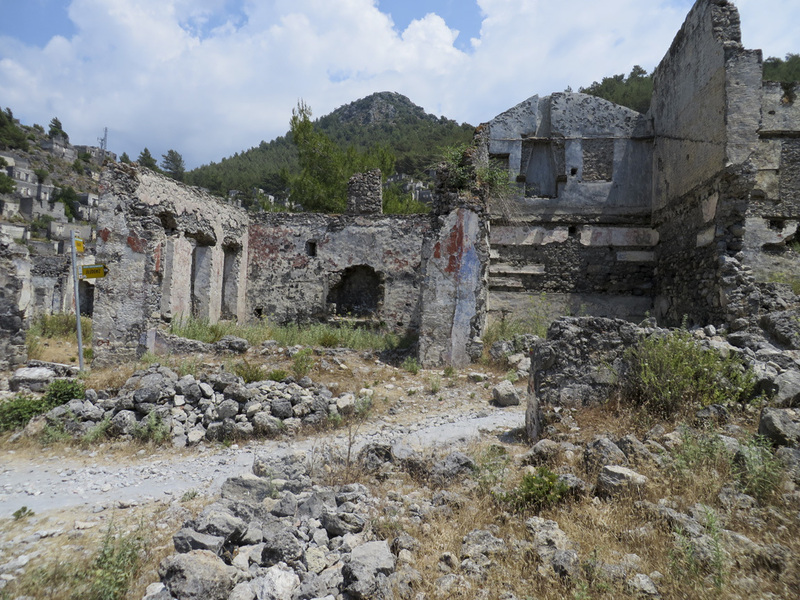 Today, an effort is being made to restore parts of Kayakoy, to preserve it as a museum. 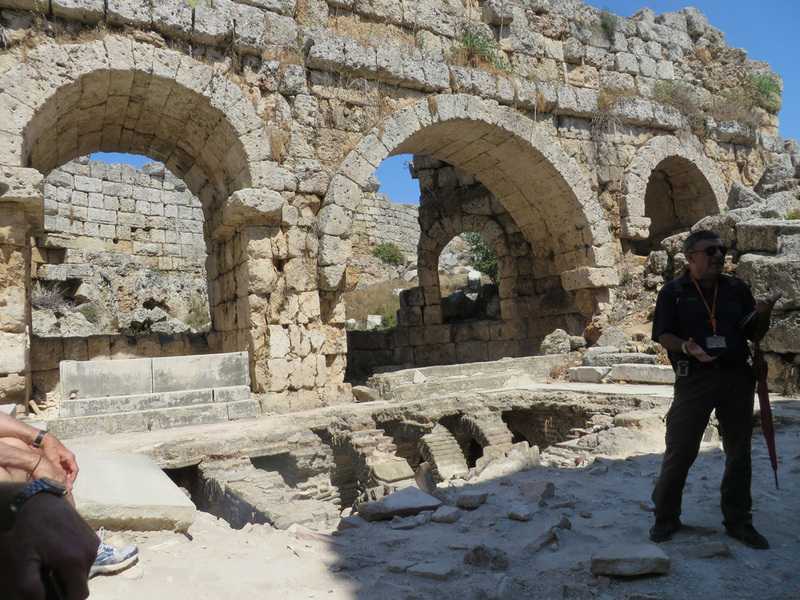 Tourism helps this effort, and I donâ€™t mind being part of the project. 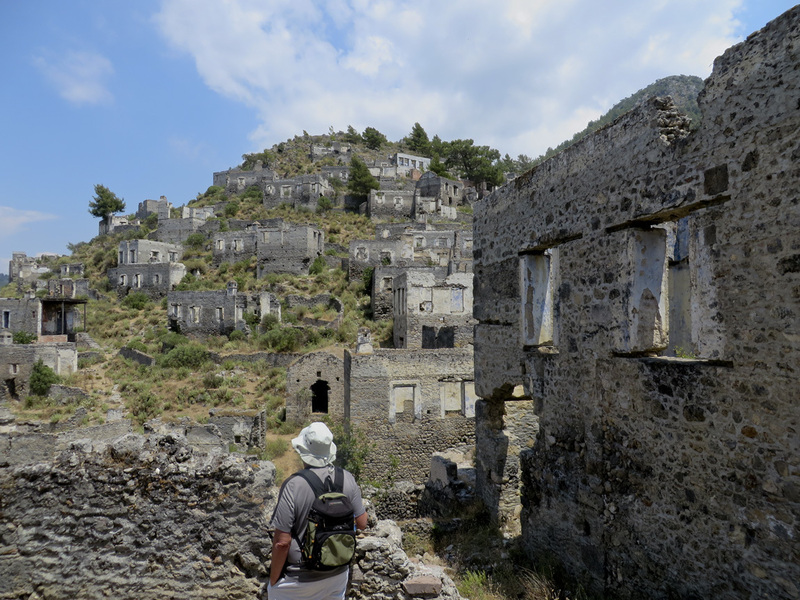 We get to wander the streets of this ghost town this afternoon and wonder about the strange side effects of war. 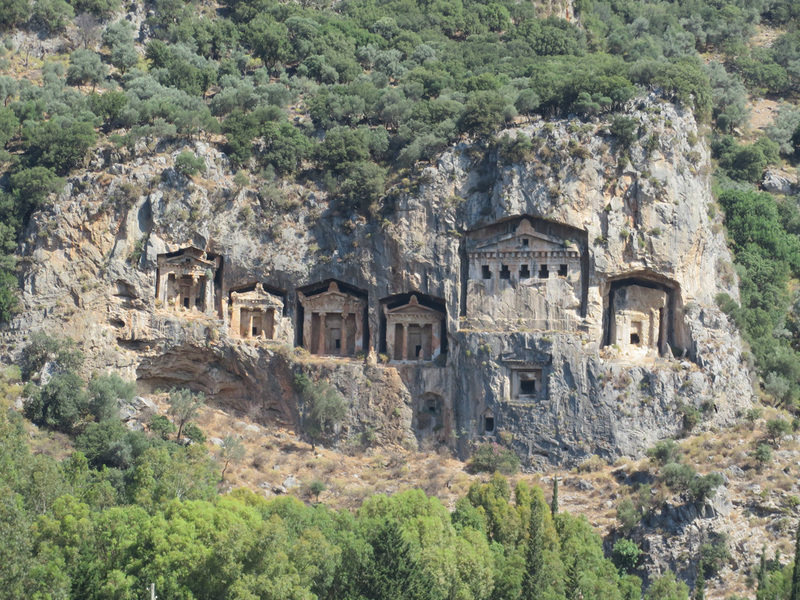 Although the history of the city dates back to 3 thousand B.C., the limited number of sarcophagi and the rock tombs still standing are dated to the 4th century B.C. The buildings on the slope were constructed during the second part of the 19th century and the first quarter of the 20th century. 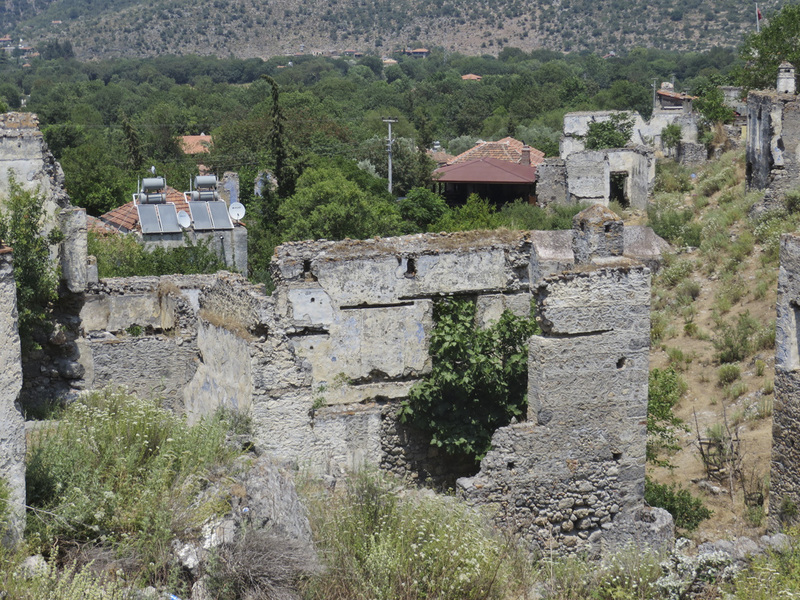 Shortly after the proclamation of the Turkish Republic, the Greeks living in the region were exchanged with the Turks resident in Greece, which resulted in the houses to be vacated. Subsequently, the wooden constructions were ruined due to natural causes, as a result of which the city assumed its present ghost-like appearance. 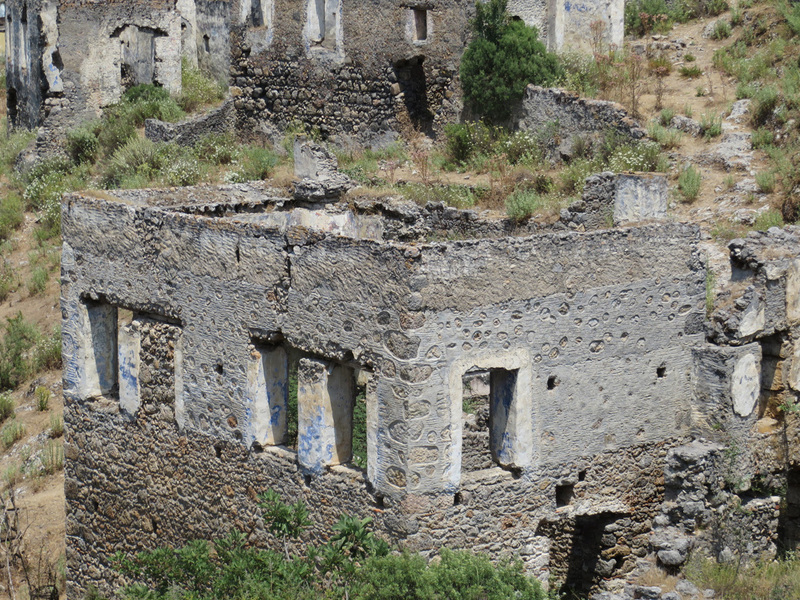 There were about 350-400 houses in the city, 50 square meters each, built in such a way as to allow for the panorama and avoid over-shadowing one another. 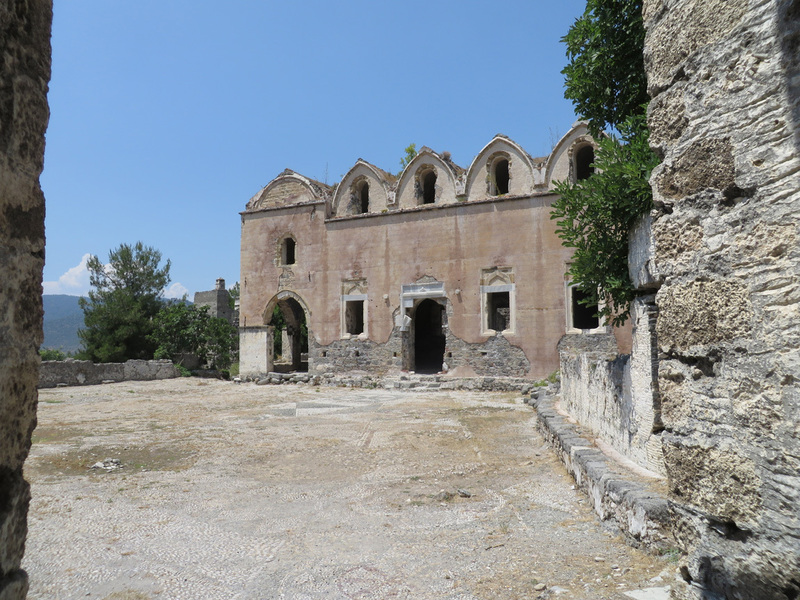 There were numerous chapels scattered among the houses, 3 large churches, one school and a customs house. We beseech our esteemed guests to assist and aid us in the protection of the city from devastation and pollution. This photo shows solar panels on top of one of the houses. A few people do live in the old homes. 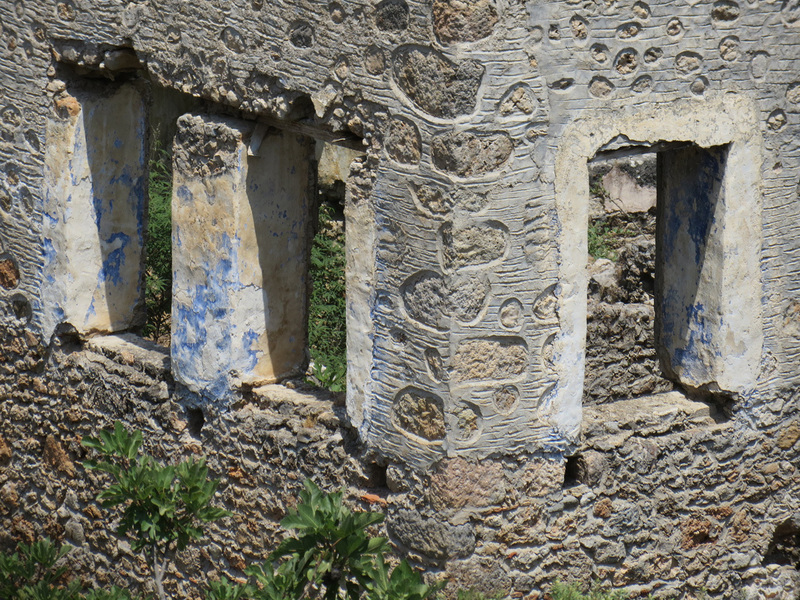 Look at the amazing details on this home, the faded blue fresco and the designs in the plaster. More views of the town. I couldnâ€™t get enough of these views. 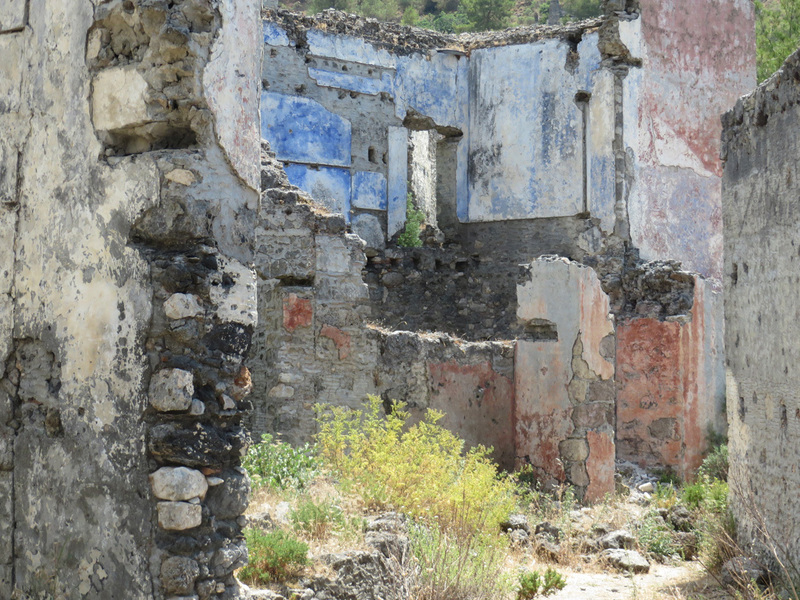 This house shows what remains of blue and orange frescoes. 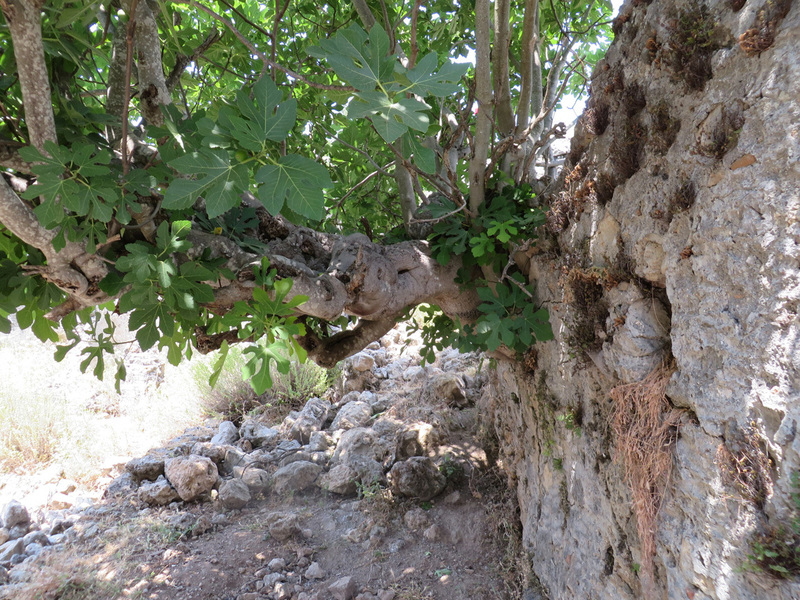 A tree growing right out of the stone wall of a house. 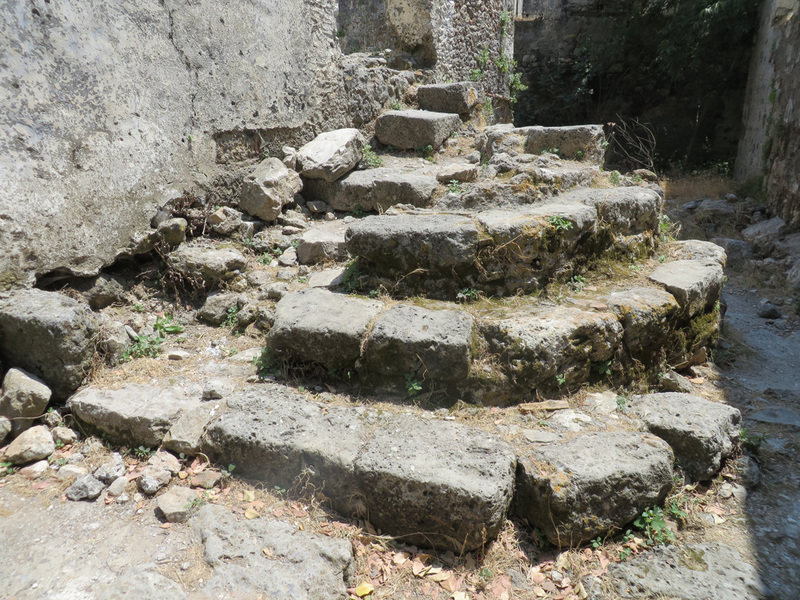 A hundred years ago, these steps felt the feet of a family walking in and out to the market, to visit friends, to share meals, to meet their lovers, to care for their aging parents. 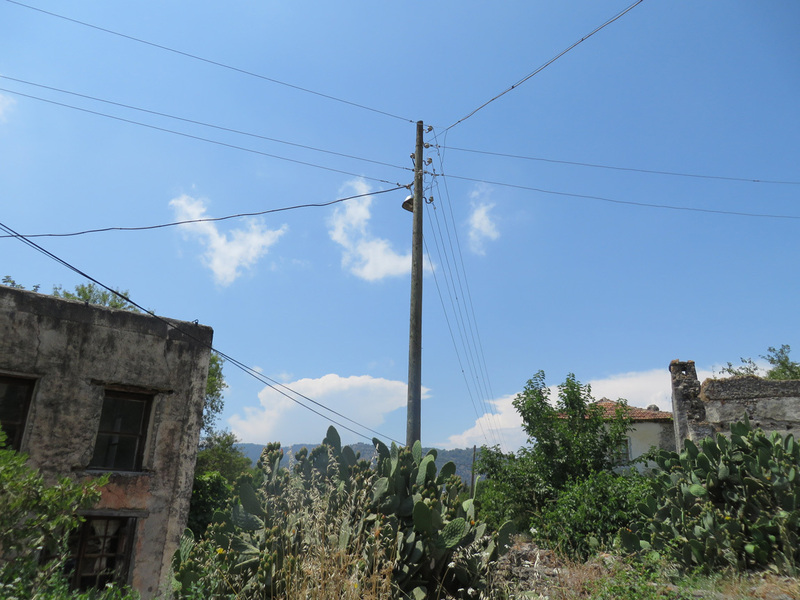 Power lines have come to this old village. 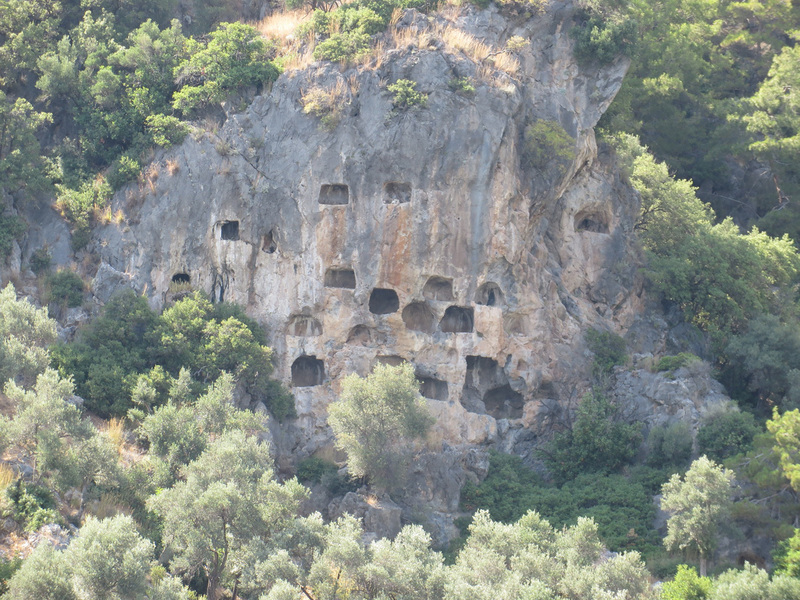 This is one of the houses that someone lives in. At the end of the tour through the village, a group of camels. Why? Donâ€™t know. 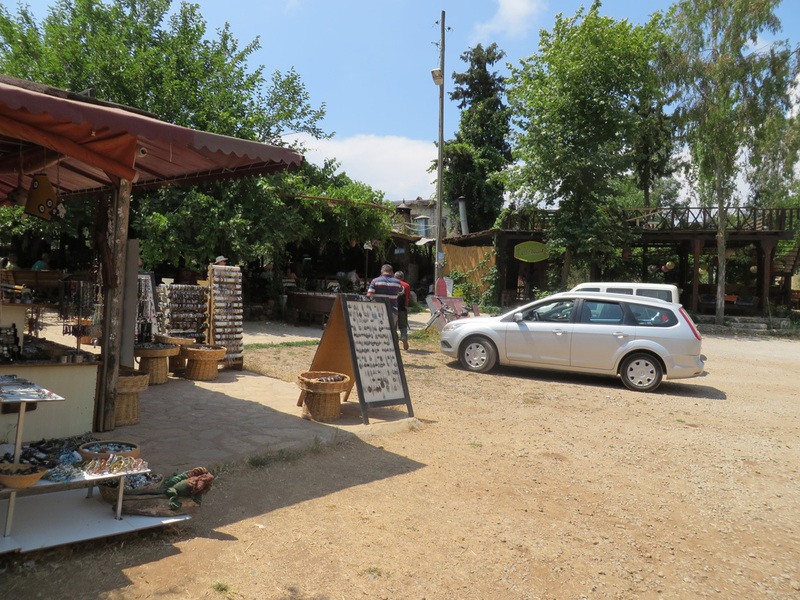 And the ever-present tourist shop. 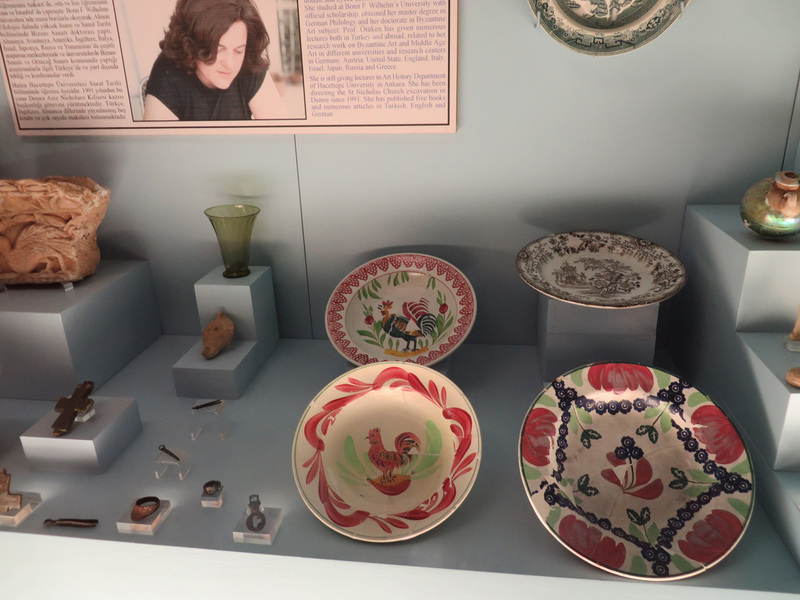 Close-up of some of the wares. Pretty and colorful. 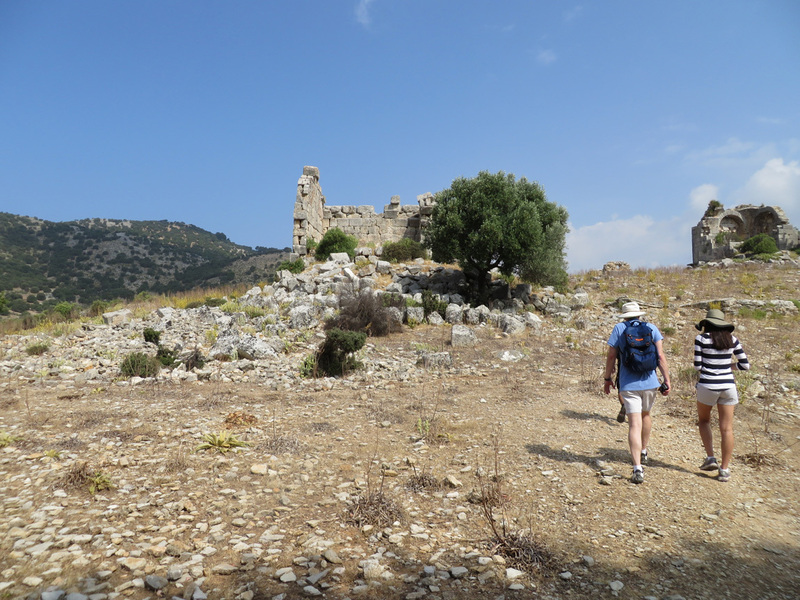 A few of our group hiked back down to the gulet, but we decided not to because we were told we had to wear long pants because of scratchy bushes. It was too dang hot for me to don long pants. 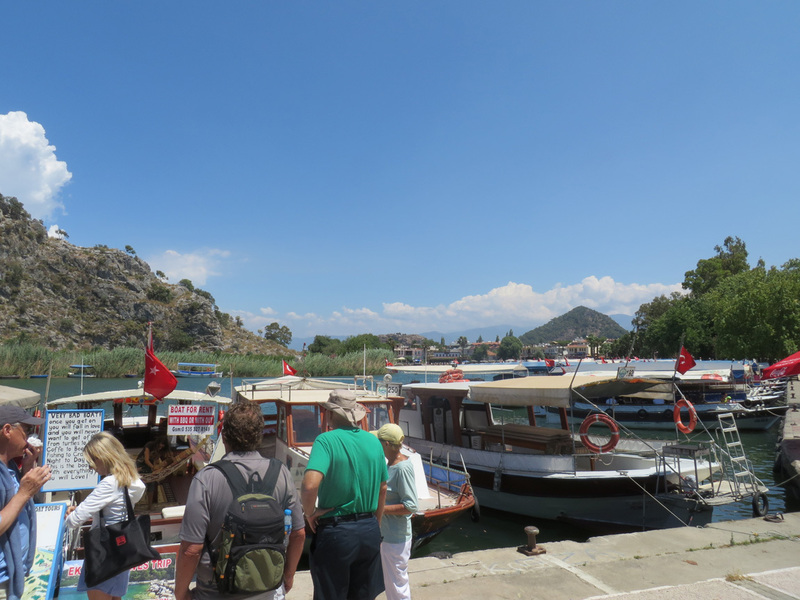 So we walked back to the air-conditioned bus that took us to our gulet. Itâ€™s 6 a.m. 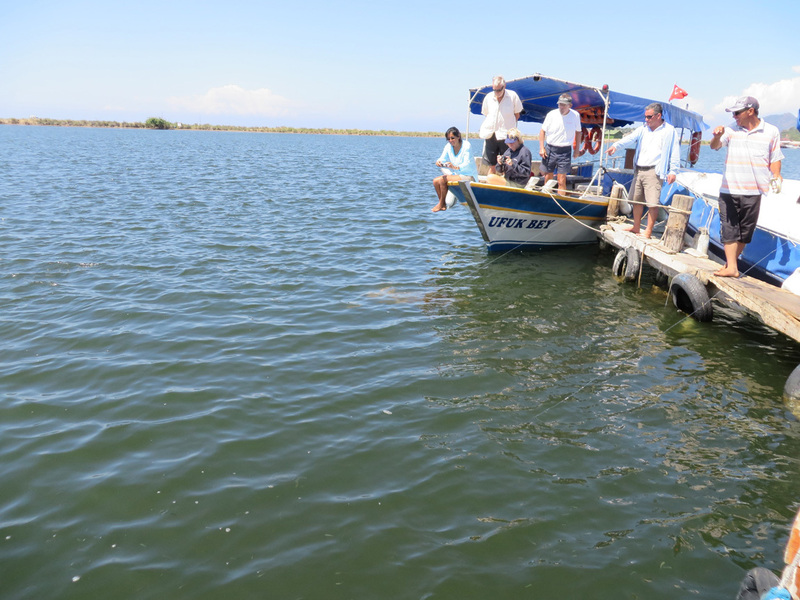 The captain starts up the motor to take our gulet to Gemiler Island. I put on a jacket and come up on deck in the cool, moist morning air, grateful for the thermos of coffee that the crew brings out. 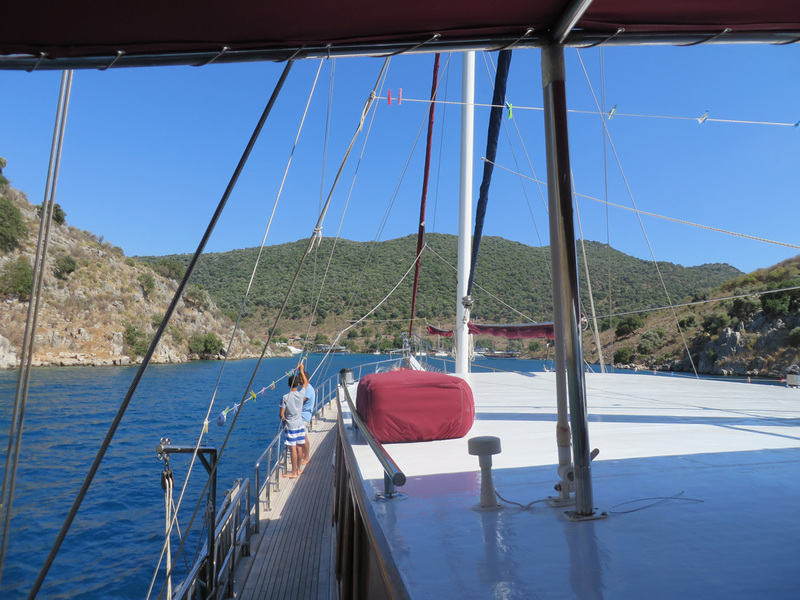 I love mornings, and here I am on a gulet on the Aegean Sea. I pull my coat close, sip my coffee, and enjoy the solitude and the views and the low murmurings of the crew talking in Turkish. 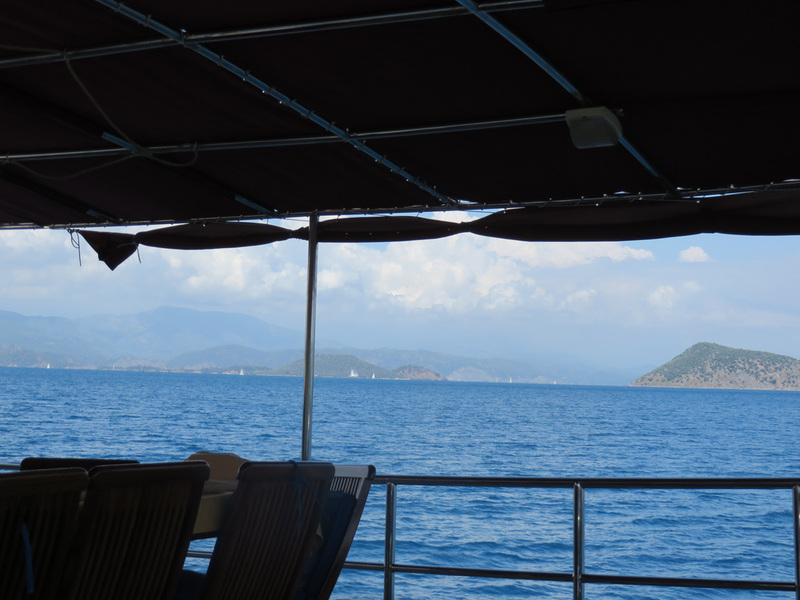 The sun comes up and so do all of our tourmates, and we enjoy breakfast on the gulet. 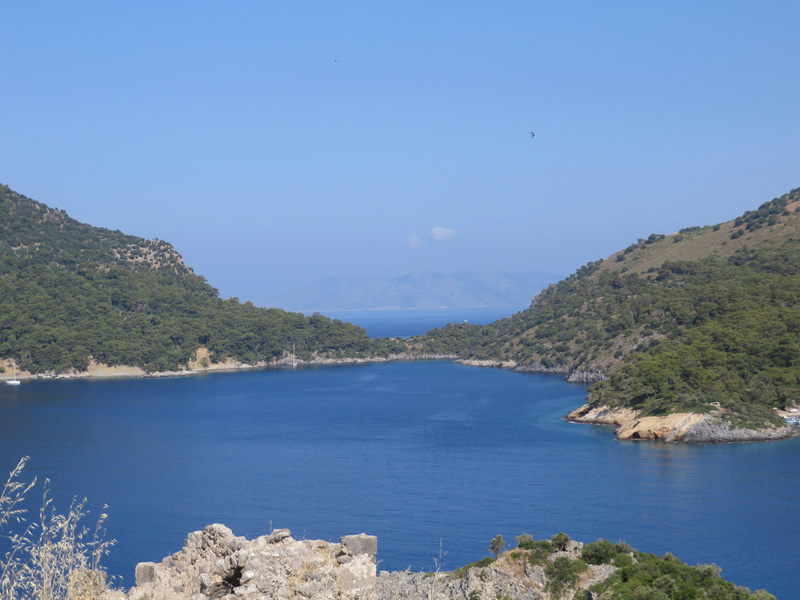 By 9 a.m. we arrive at Gemiler Island, also known as "Saint Nicholas Island". 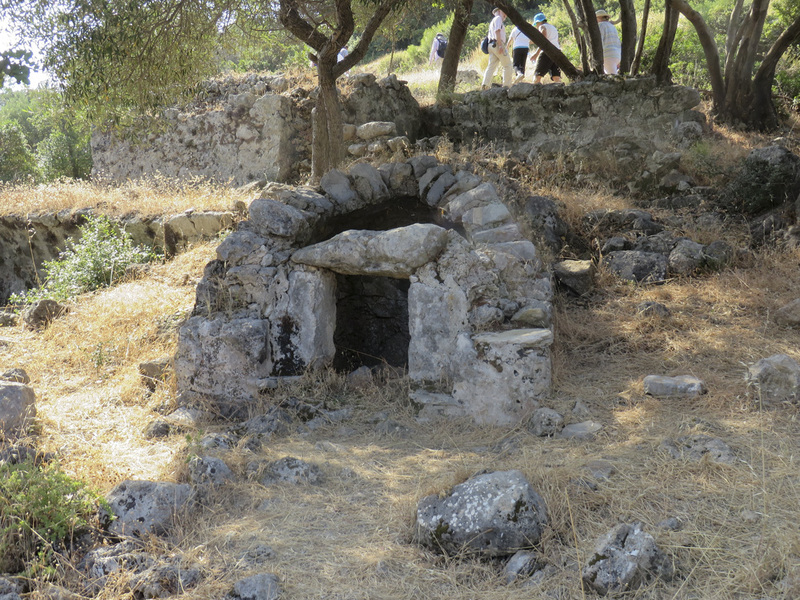 Modern archaeologists believe that this island may be the location of the tomb of St. Nicholas. St. Nicholas was known as a gift-giver, placing coins in the shoes that people left out for him. This is the model for Santa Claus, whose name is derived from Saint Nicholas. His feast day is December 6. Note the turquoise blue sign: â€œDuring your visit please fallow the path.â€ Hmm, where is the editor? 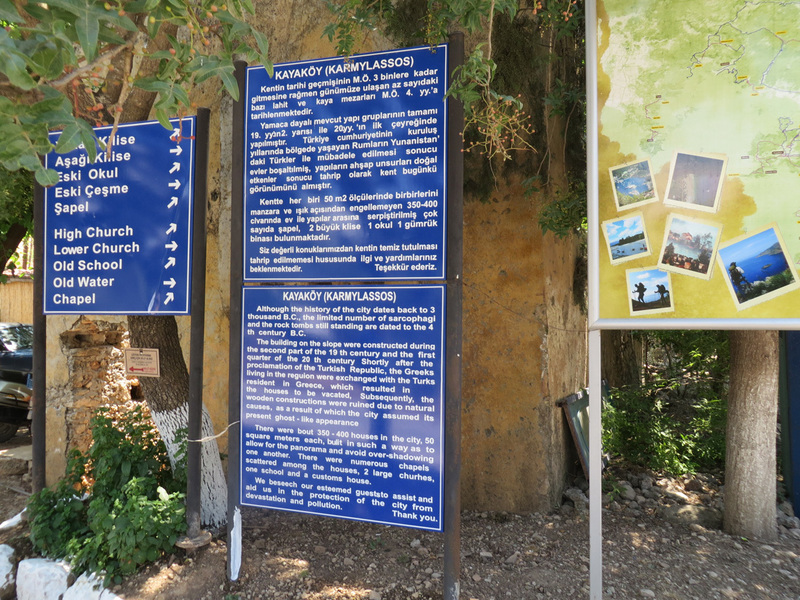 I typed in the content of the other blue sign, correcting errors. 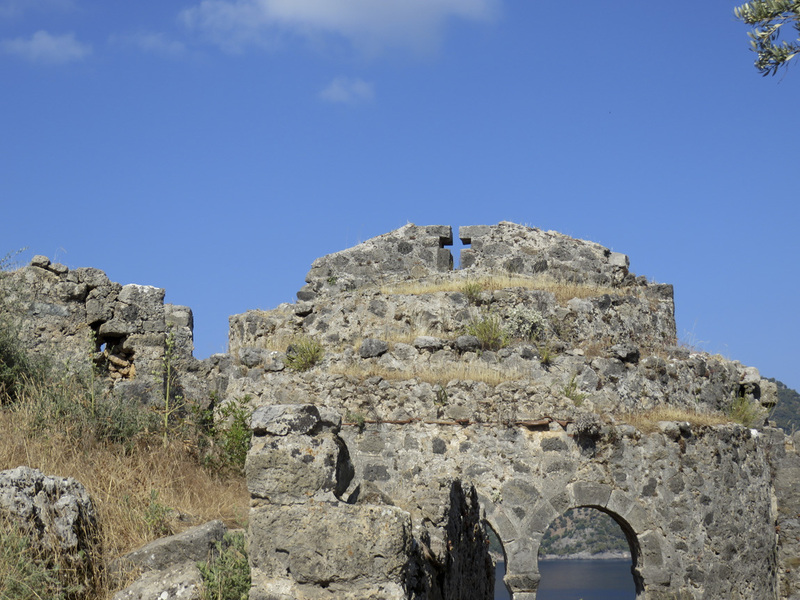 This island became a residential area during the early Byzantine Period. 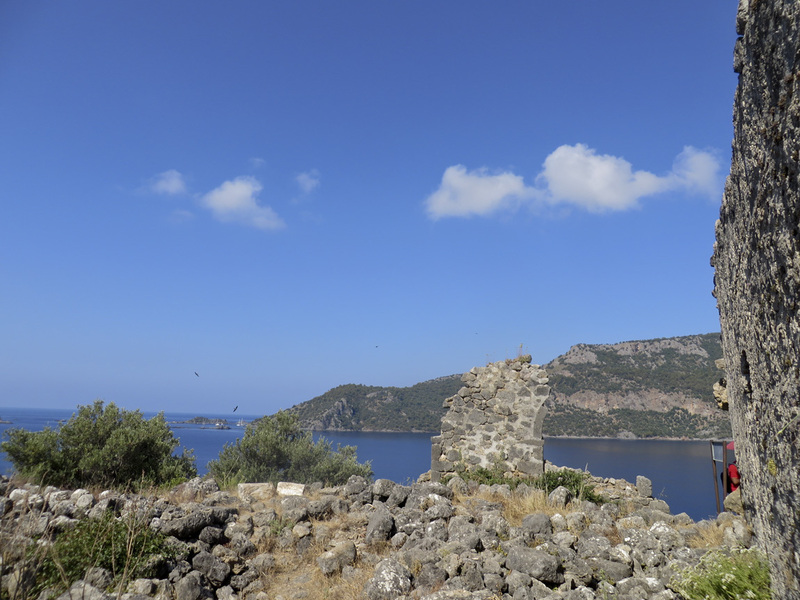 Some medieval sources claim that Saint Nicholas, known as Santa Claus, came here or lived here for some time, which enhances the present prominence of the island. Some sources name the region as Symbola. 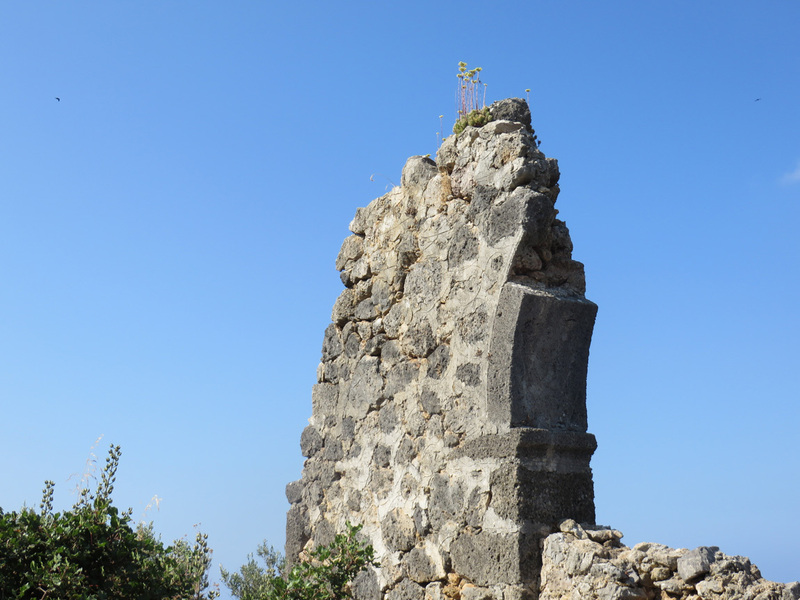 There are various religious buildings and numerous small houses on the island. 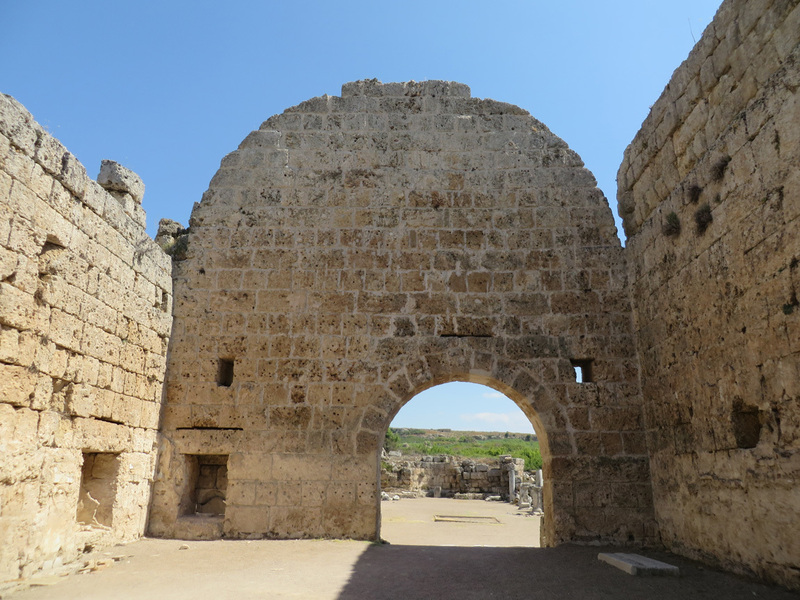 Four large churches, many vaulted tombs, the corridor connecting Churches No. 3 and No. 4 and the church No. 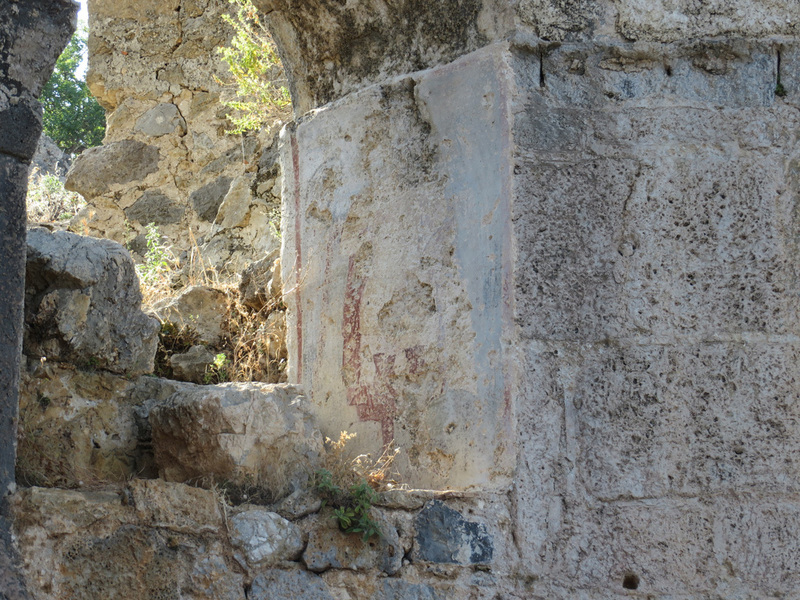 2 with frescoes dedicated to Saint Nicholas are among sights worth visiting. 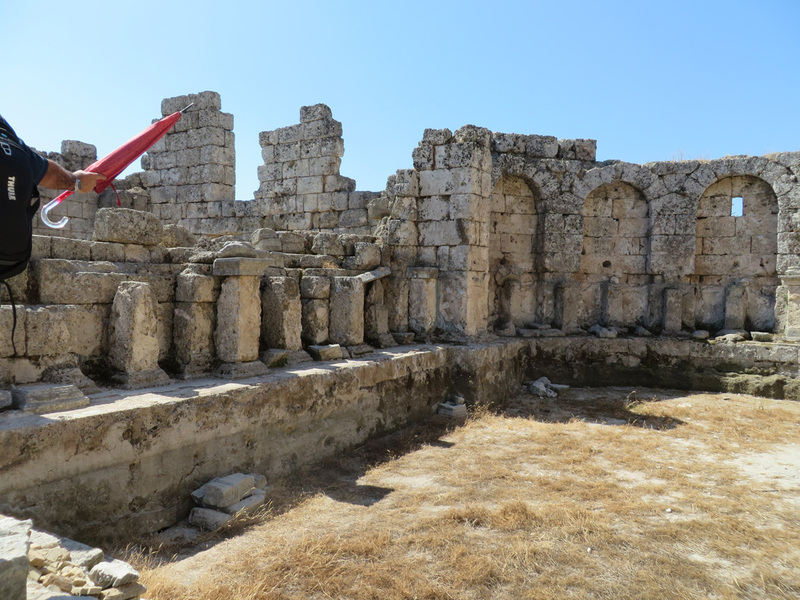 From the early Byzantine Period until the 12th century AD, the island was inhabited and was an important port of call, especially for vessels sailing from Italy and other Western Mediterranean countries with pilgrims destined for the Sacred Lands in Palestine. 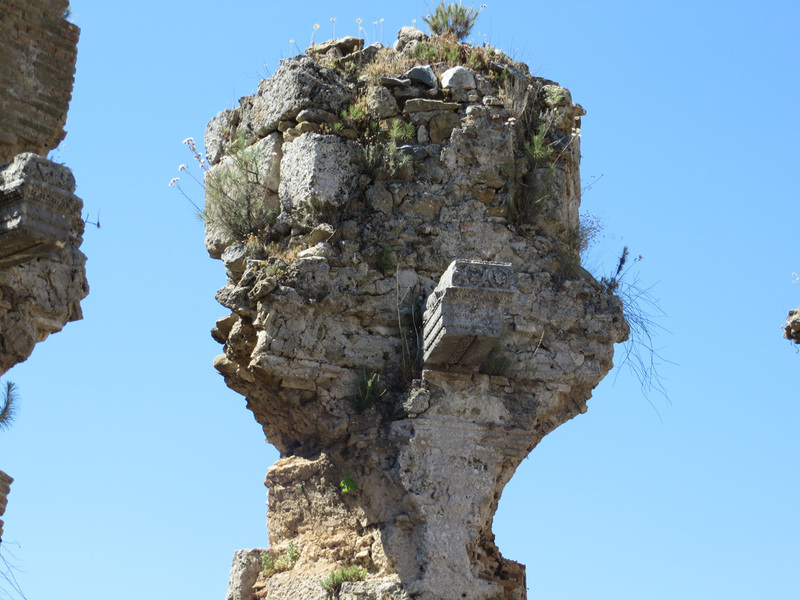 The island was deemed significant also because of existing cults of certain saints. The aid and interest of our esteemed guests are requested in the protection of the island from devastation and pollution. 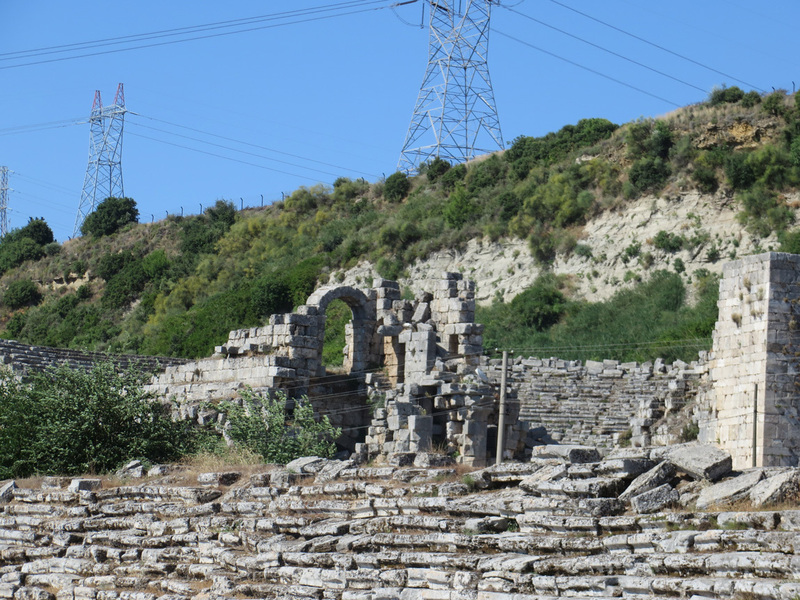 History reminder: Byzantine was the Greek-speaking Roman empire, lasting from about the third century AD through the time of the Middle Ages, and was the ruling force in Turkey until 1453. 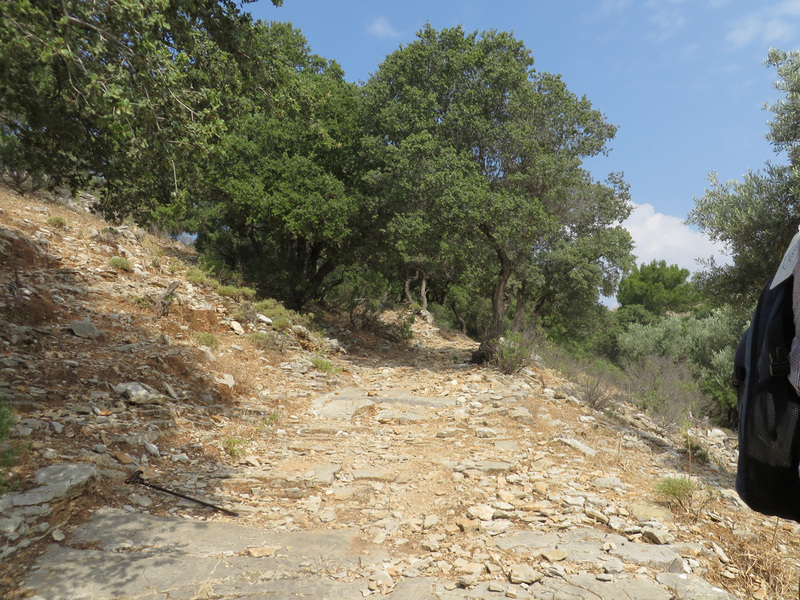 The path is very steep, winding up to the top of the hill where the churches were built around the 6th century AD. 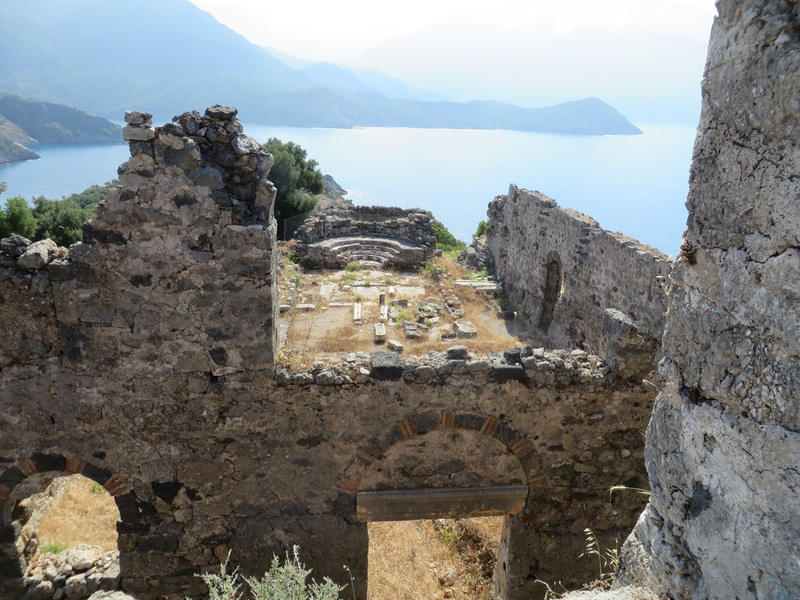 Itâ€™s worth the hard hike, because the ruins and the views are amazing. 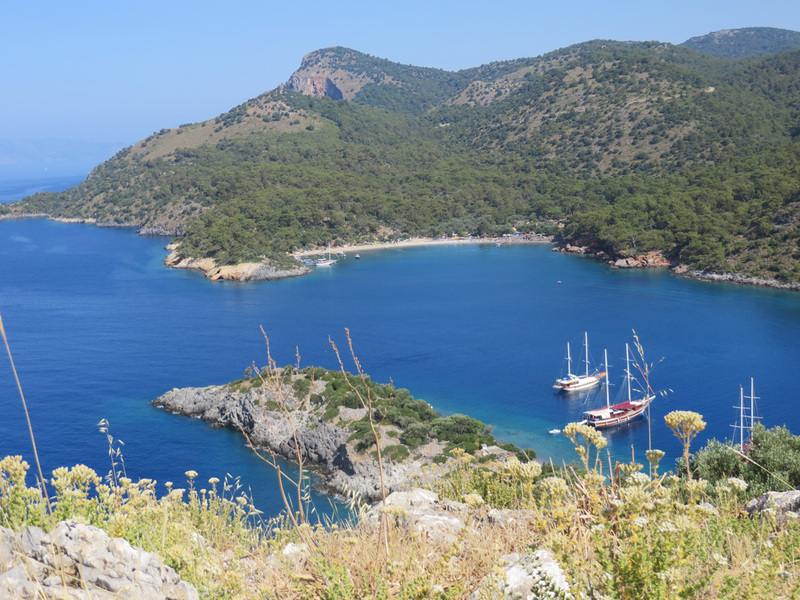 I took this photo of our gulet after walking a little ways up the path. 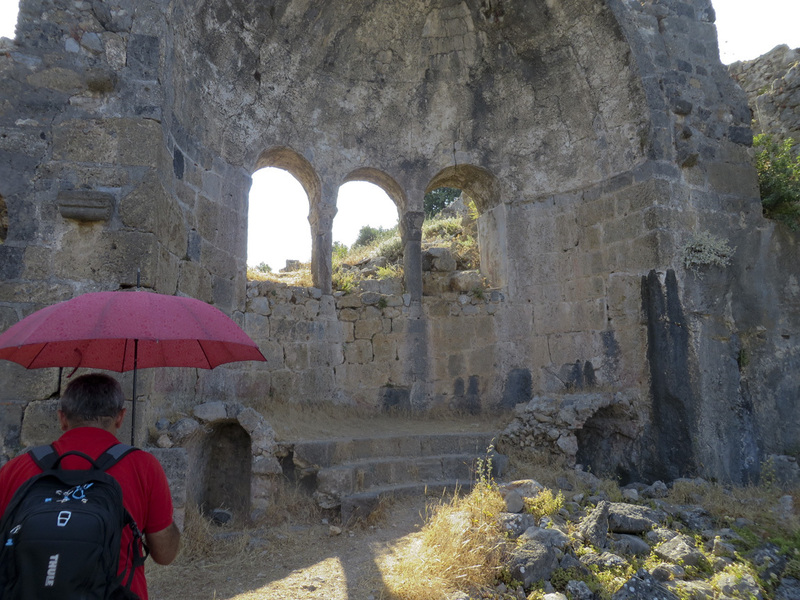 One of the old churches. 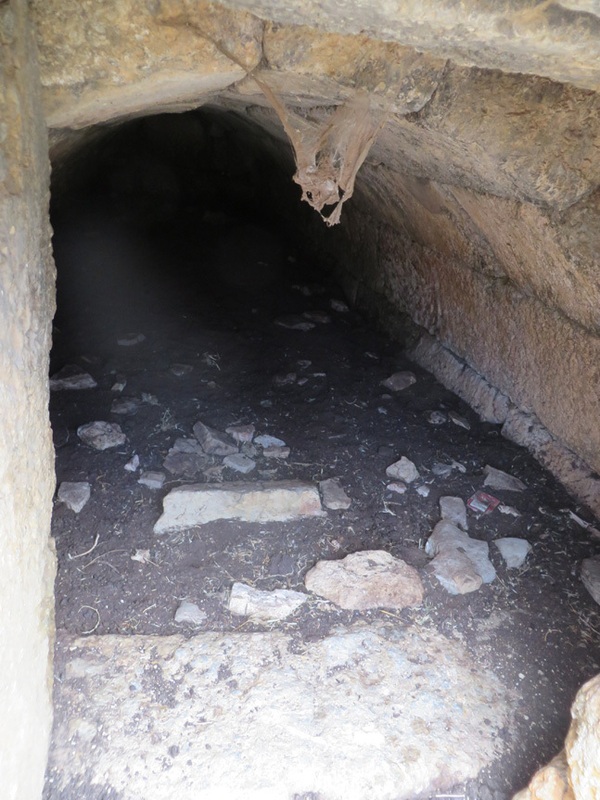 The corridor connecting two of the churches. 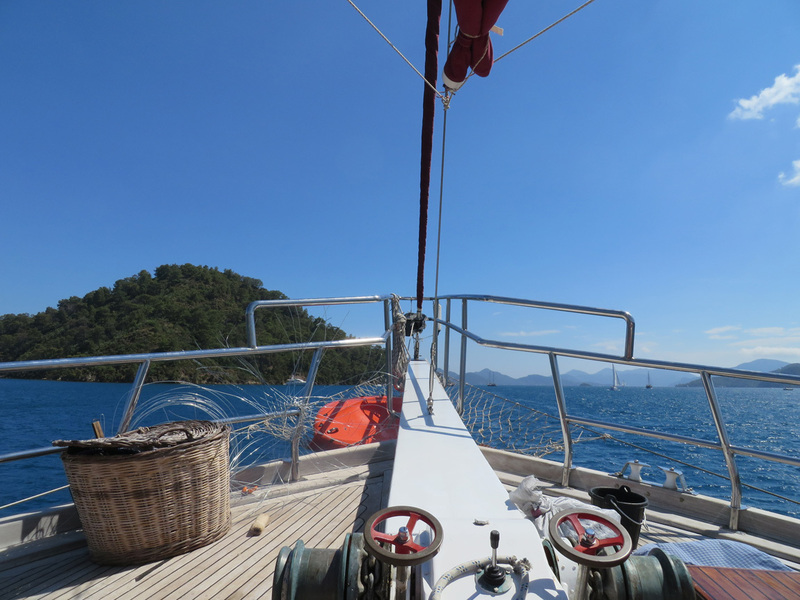 The view of our gulet. Ali leading us to another church. 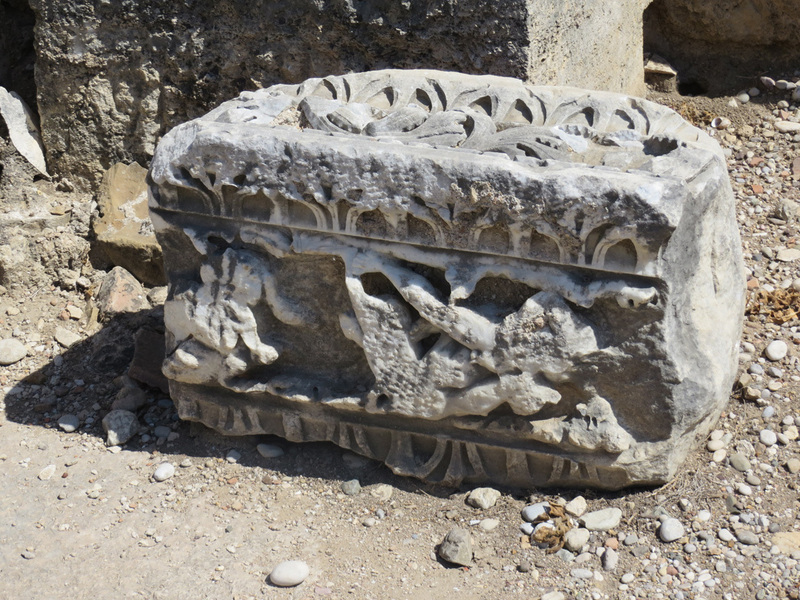 What remains of one of the frescoes. 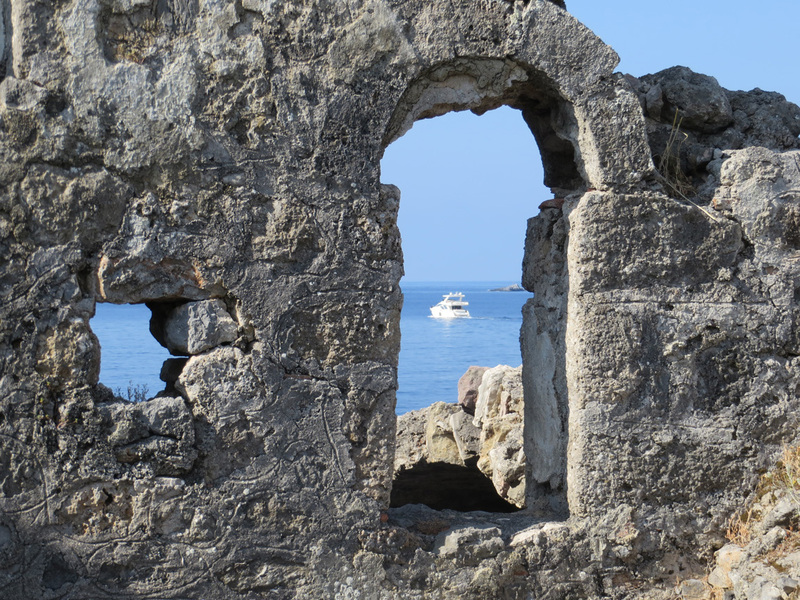 Church ruins against the view. 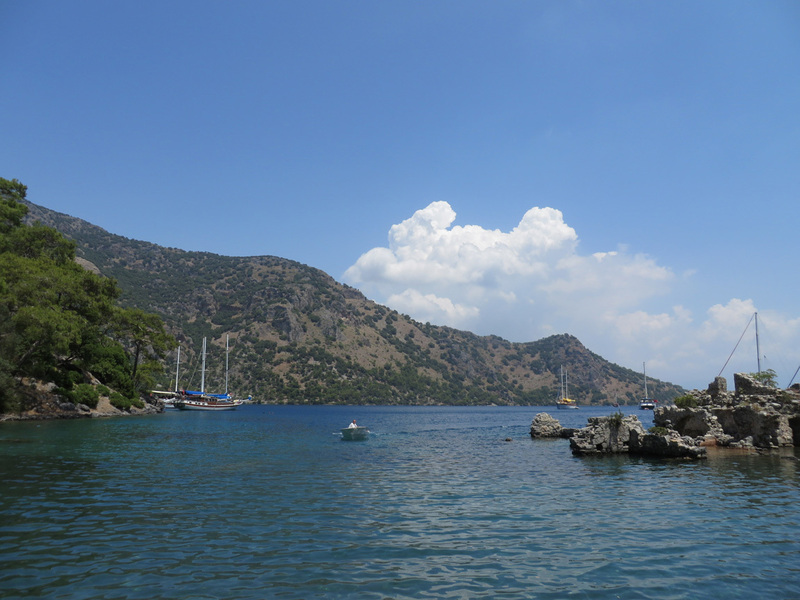 We hiked back to our gulets and had a couple hours to swim and snorkle around the cove. 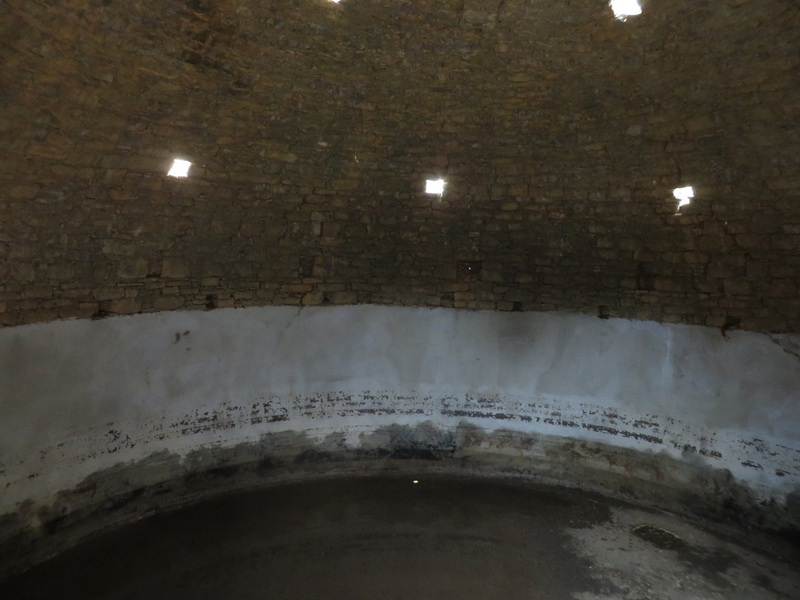 It was really cool, because some of the ruins were underwater. Too soon, it was time to leave for our next adventure. 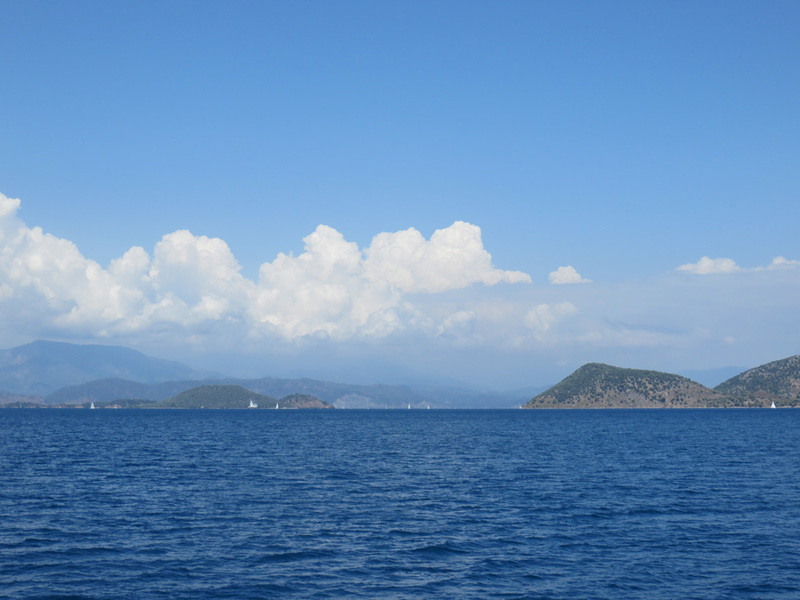 This was taken from our gulet, looking back at Gemiler Island. June 14: Afternoon and evening. 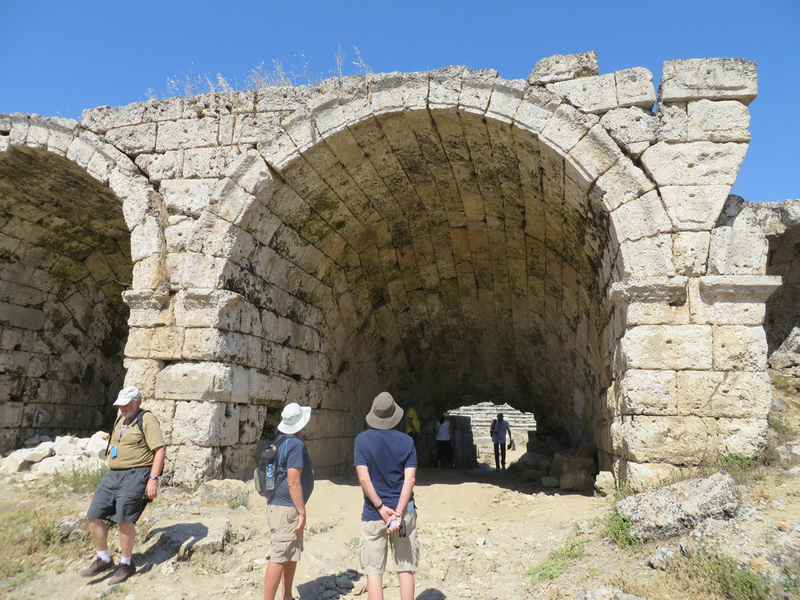 Here I am in October, writing about our June trip, and I find that my written journal for the rest of June 14 is sketchy. (Perhaps because of the gin and tonic incidence . . . more below.) 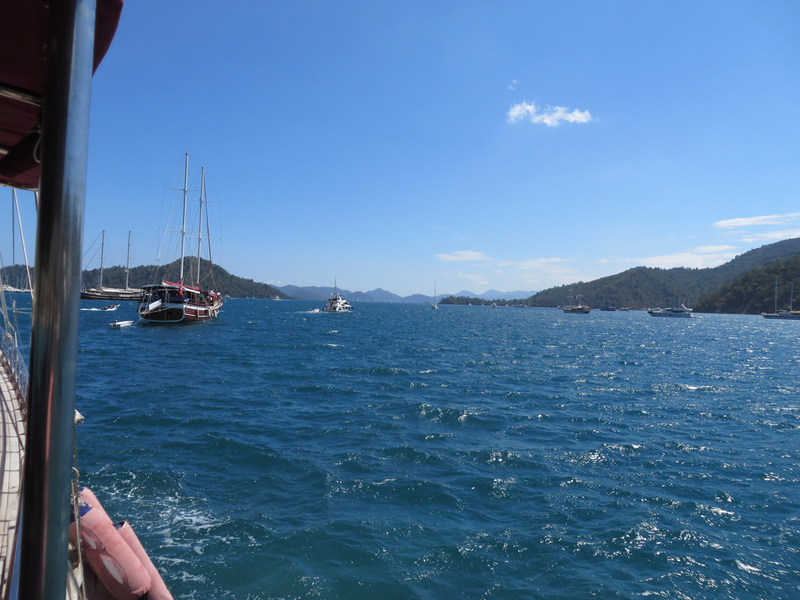 I know that we left Gocek around 3 pm and cruised to a shipbuilding ghost town, but my photos donâ€™t clearly show this. 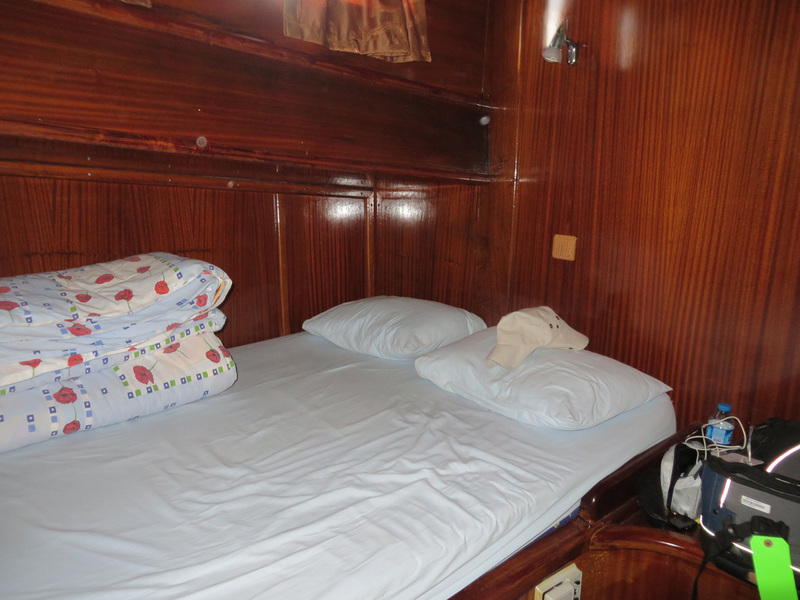 From the times on the photos, I do know that within an hour, our boat had docked for the night in a new cove. We swam and snorkled. Below are a few of my photos. 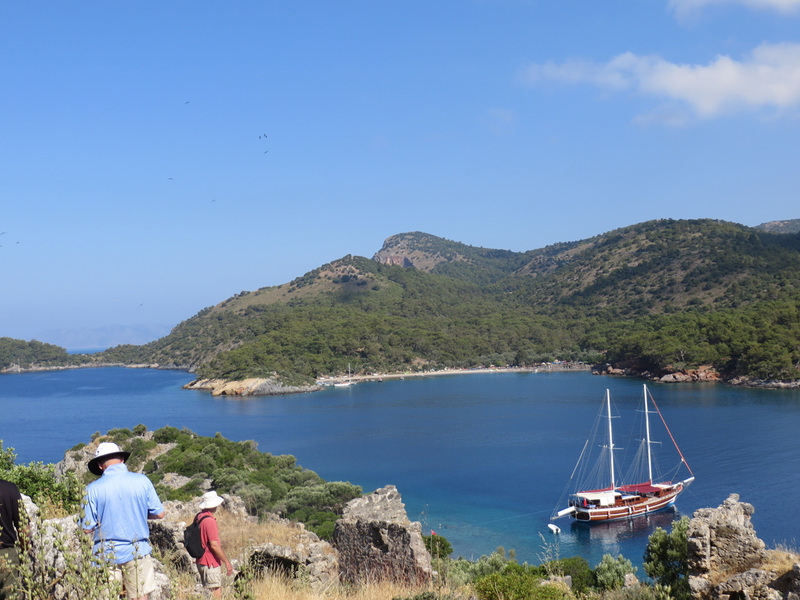 A nice view of gulet #1. 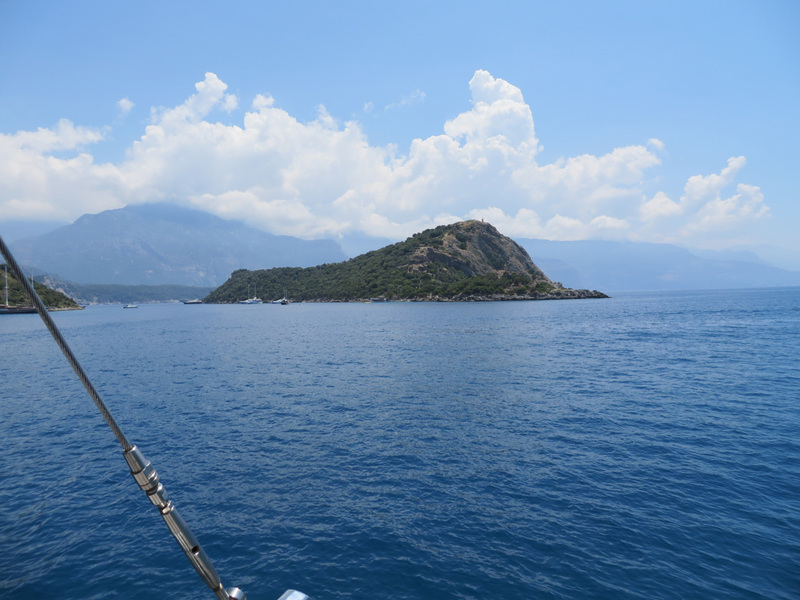 Our captain was making a trap for fish, you can see it here on the prow of the boat. 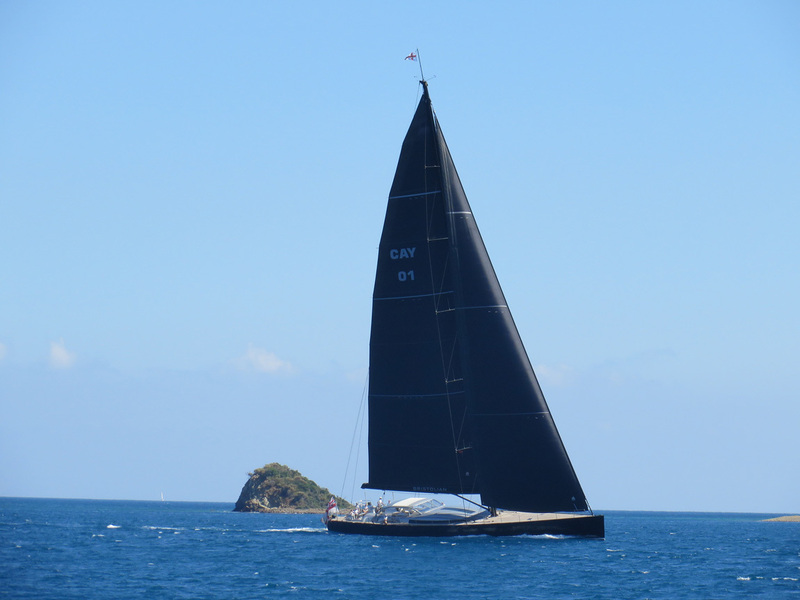 A very cool sailboat with black sails passed. Coming into the cove where we spent the night. Looking back out to the sea. 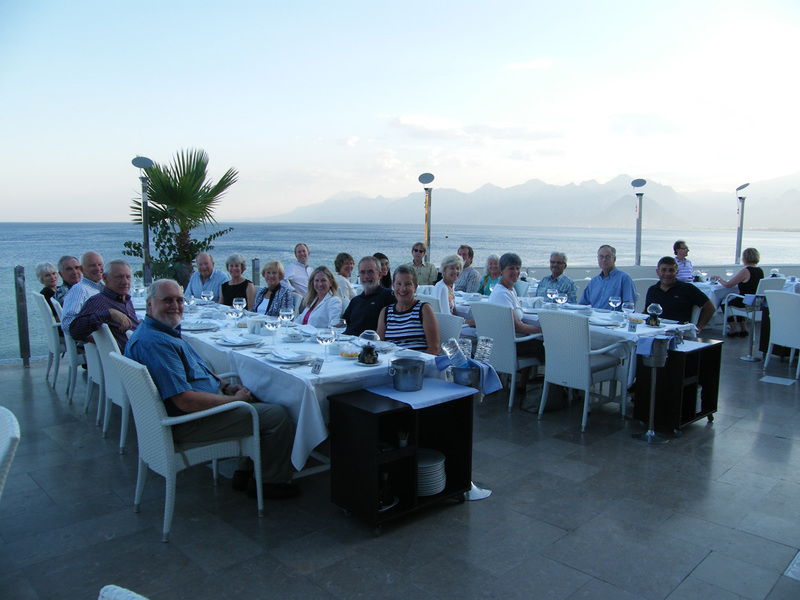 As the sun set, gulet #2 tour members gathered for cocktail hour. What, tonic, but no gin? Help, we need gin! 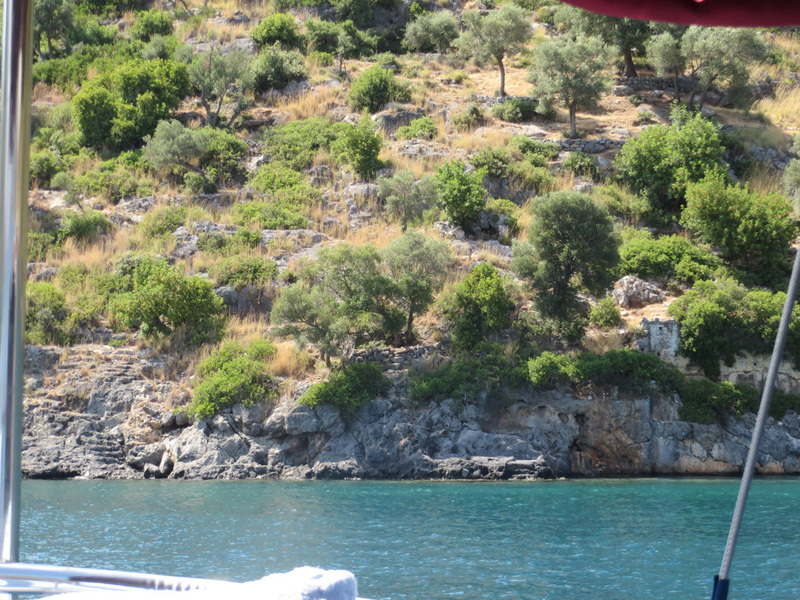 We waved our arms and shouted to our tour members on gulet #1 and asked if they had any gin, but they said no. Our captain radioed all the other captains in the cove, but none was to be found. Oh well, we would just have to make do with what was on board. And that we did. Ah, the problems of travel. 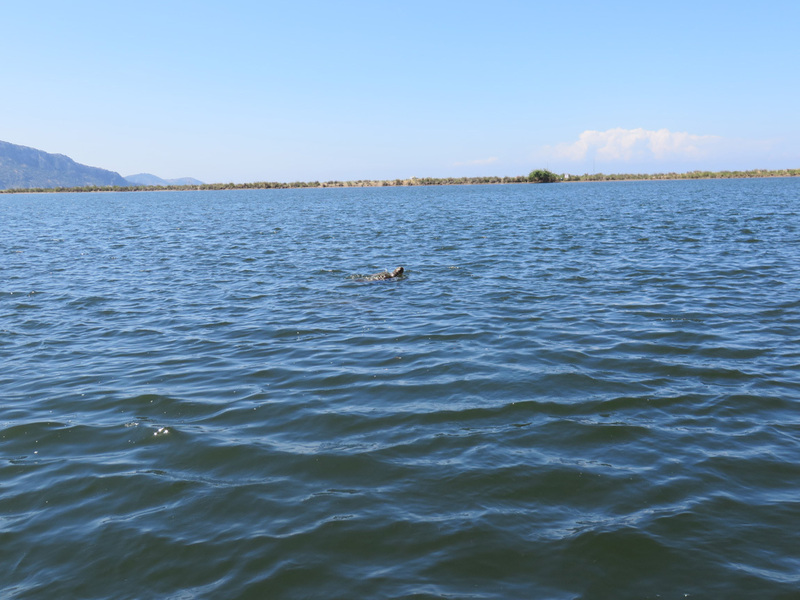 June 14: Dalyan and loggerhead sea turtles. 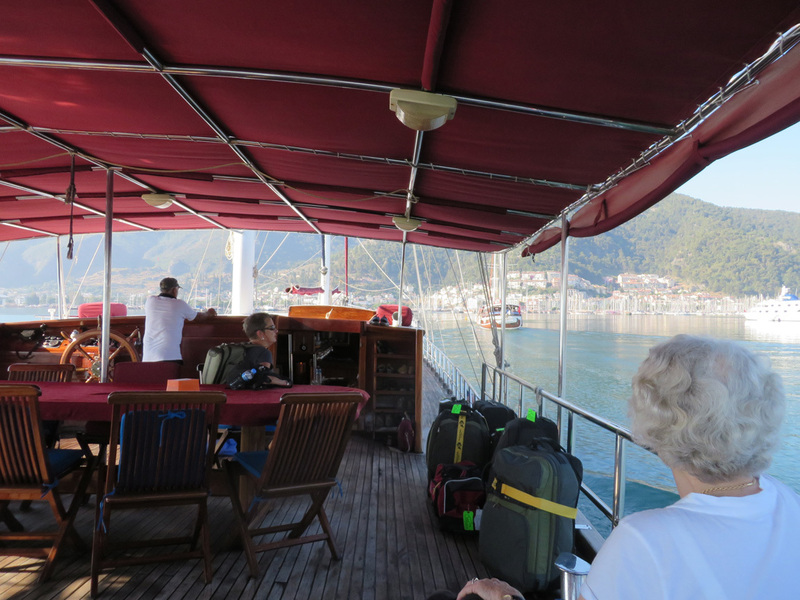 Our gulets motor to Gocek by 9 a.m., where we disembark and board our bus. 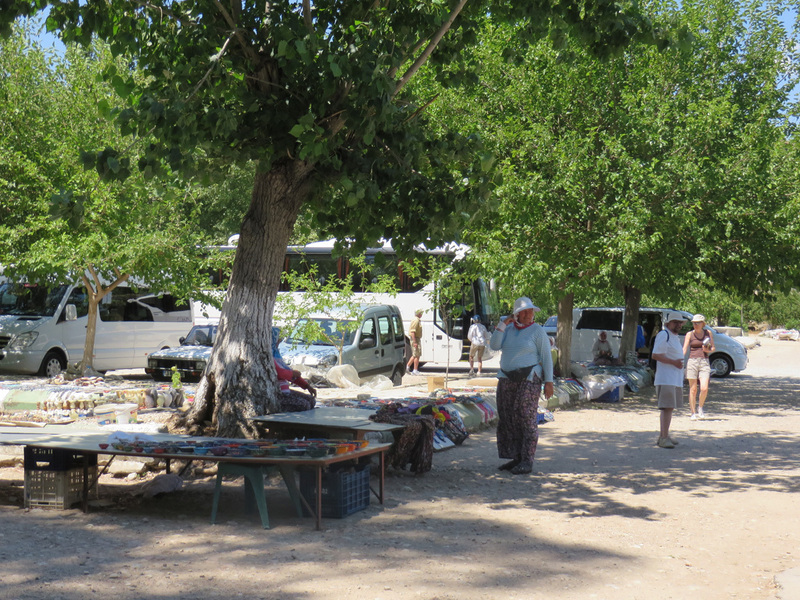 Our bus takes us to Dalyan, a town less than an hour north of Gocek. Along the way, I noted that the buildings in the town are architecturally pleasing, more European; they are less blocky than most of Turkeyâ€™s structures. Ali says that a lot of Brits live in this area as it has a great climate and is a relatively inexpensive place to retire. 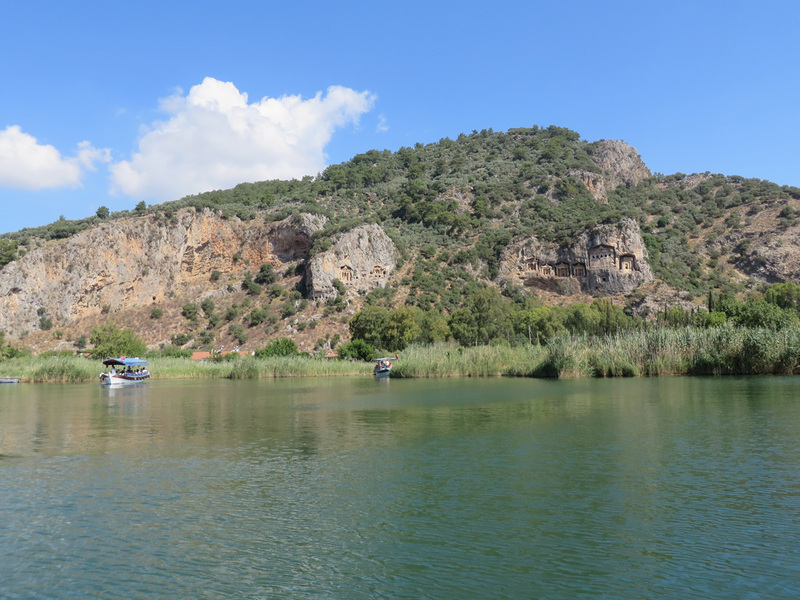 Dalyan is famous for the endangered loggerhead turtles that breed on a nearby beach. 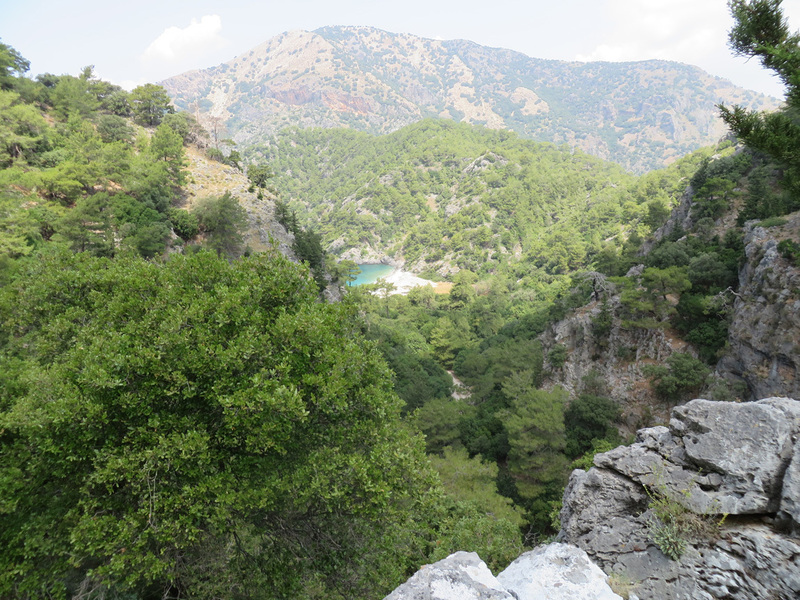 In June 1988, the area was declared a protected natural preserve, the first in Turkey. 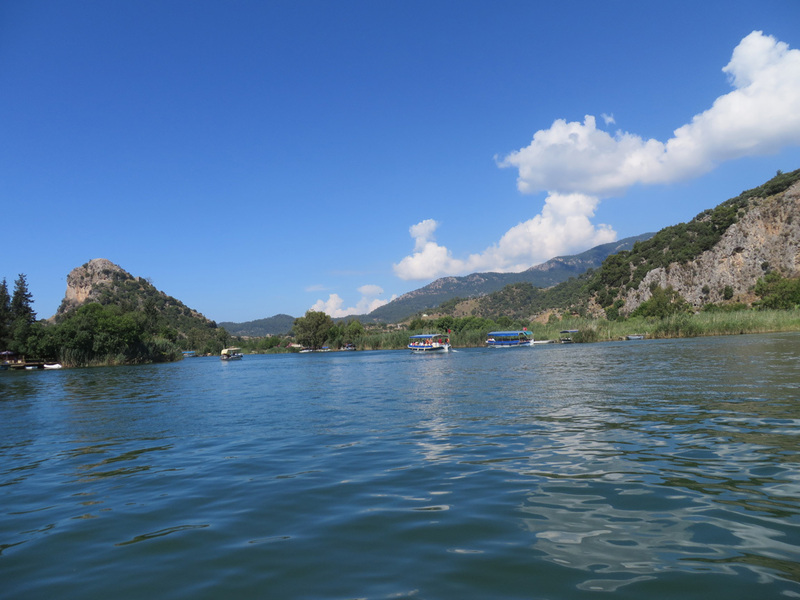 (See Koycegiz-Dalyan Special Environmental Protection Area.) 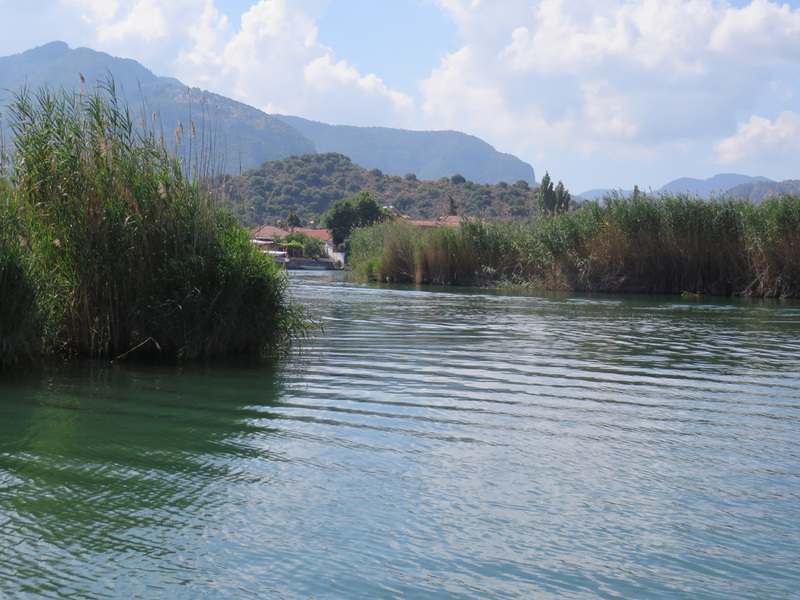 We will be on the Dalyan River, that connects Lake Koycegiz with the Aegean Sea through a delta-like matrix of channels. 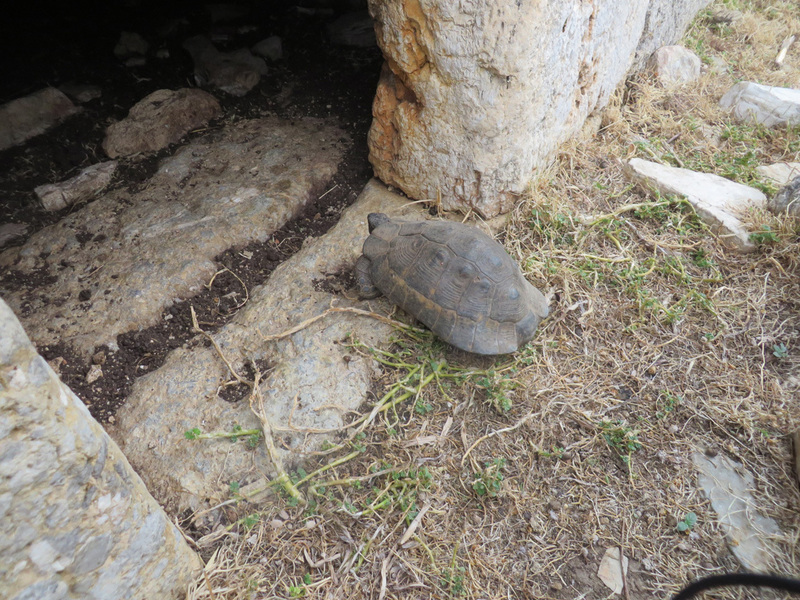 We walk through the town to the pier where we board an open boat and head out the channels to see the loggerheads. 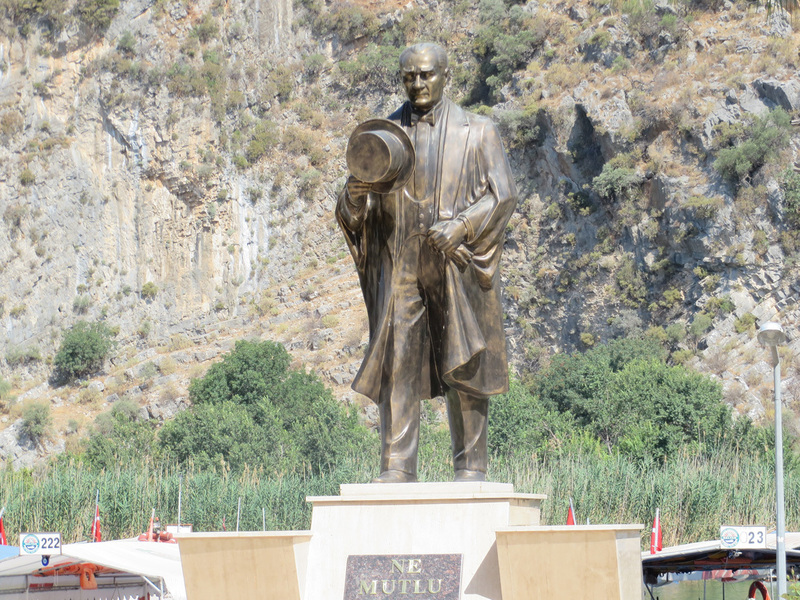 First we pass a statue of Ataturk, a common sight in Turkey. 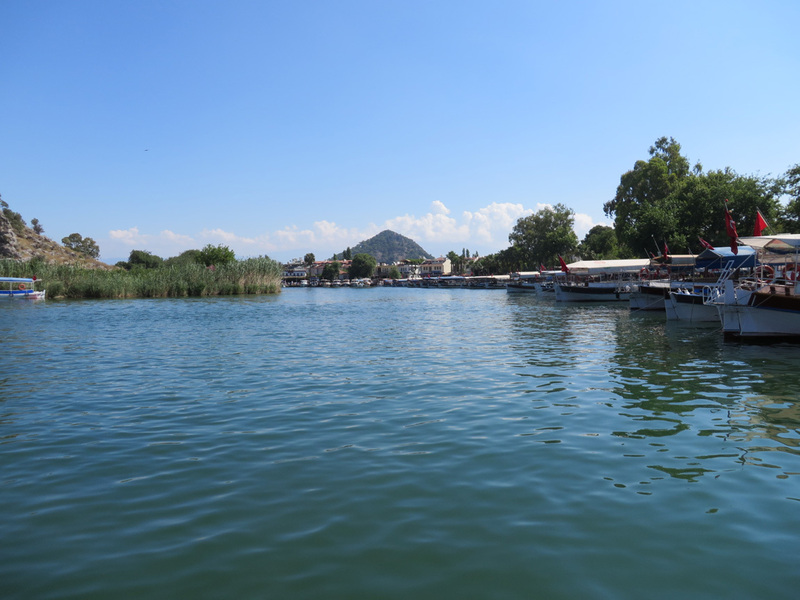 This photo looks back on the pier and the town of Dalyan. The river winds through a marshy, reedy delta. 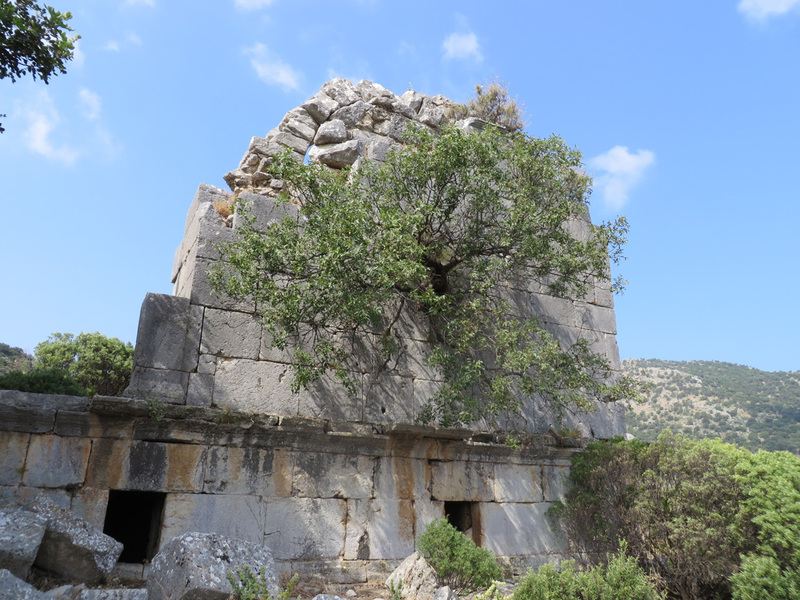 Soon we see Lycian rock tombs carved into the hills that rise from the shore. The view as we motor out towards the sea. 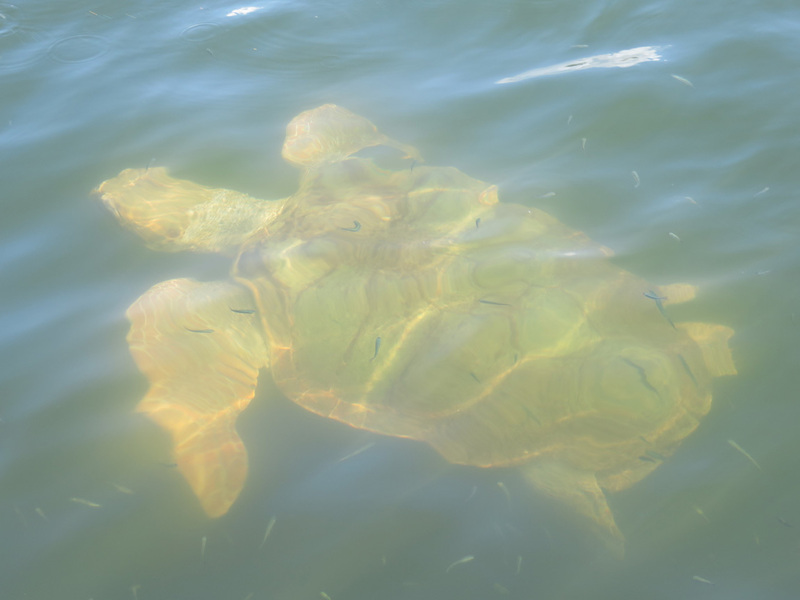 We stop to get blue crab to attract the loggerhead turtles. Ali gets extra to take to the restaurant later in the day. What are these people pointing to? 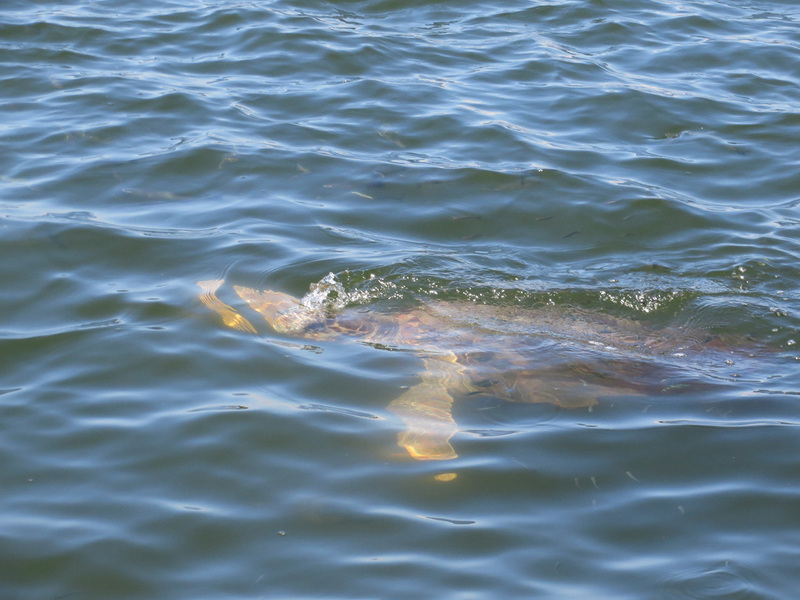 A loggerhead - you can barely see it. Our boat moves in closer and fish and crabs are tossed overside. Oh! 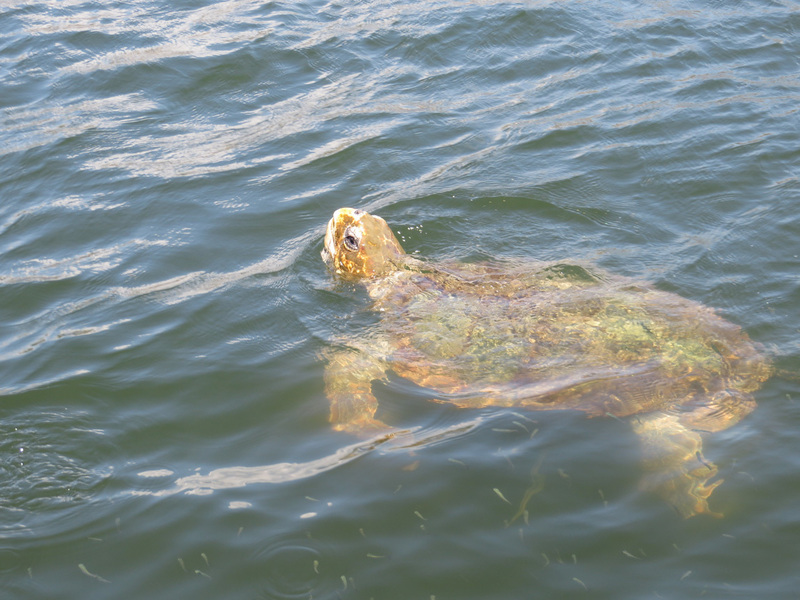 Here comes a loggerhead turtle! Underwater, with little fish swimming above. In the distance, you can see a loggerhead and the beach where the turtles breed. 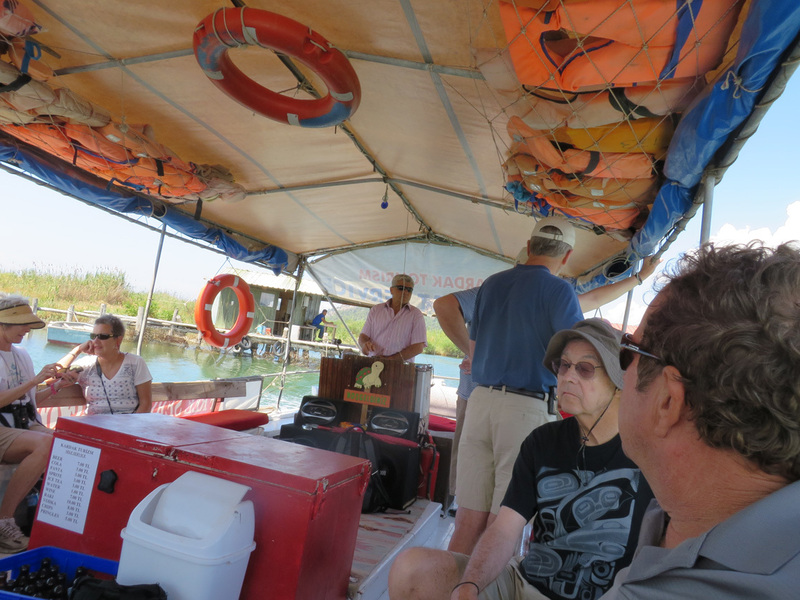 Our boat turns back to town and we sit and talk about our experience. Back at the pier, we disembark and gather together before we walk back to the town. Itâ€™s pretty in this resort town. Restaurants line the walkway, inviting us in. Ali takes us to a planned restaurant, where we order a variety of dishes and also the chef prepares the blue crab that Ali has brought. We enjoy the food and the wifi access. Later we wander the shops of the town and I get some harem pants and a cute shirt. 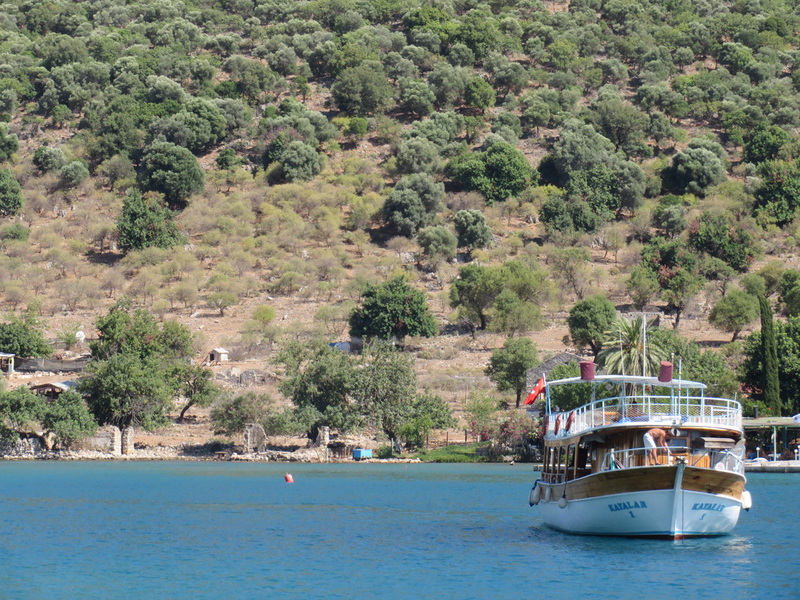 Then, back to the bus and then the gulet. The day is still young! 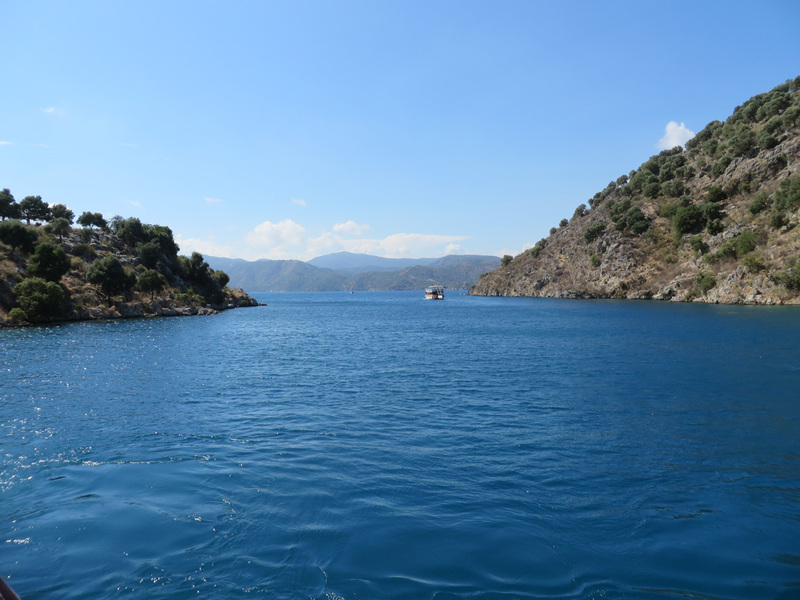 June 13: Sailing the Aegean. 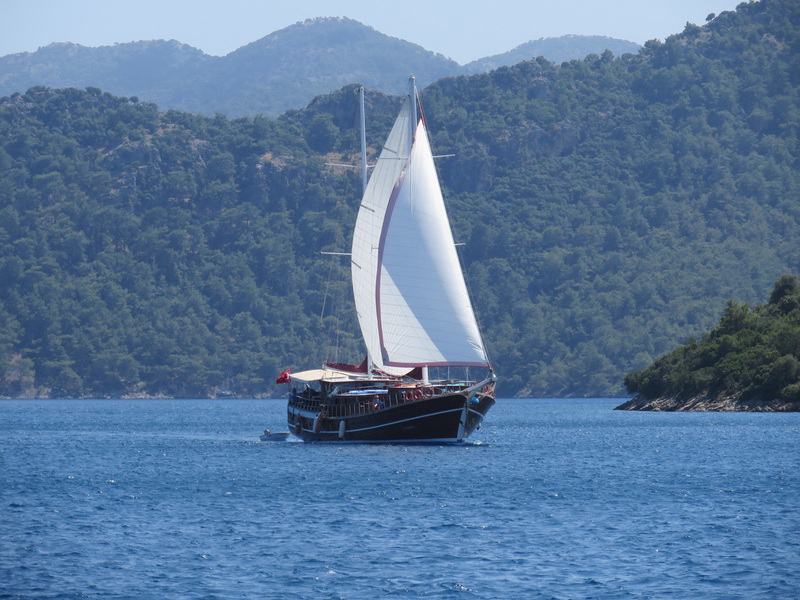 After lunch, our captain put up the sails on the gulet, and we sailed northeast up the coast towards Gocek. 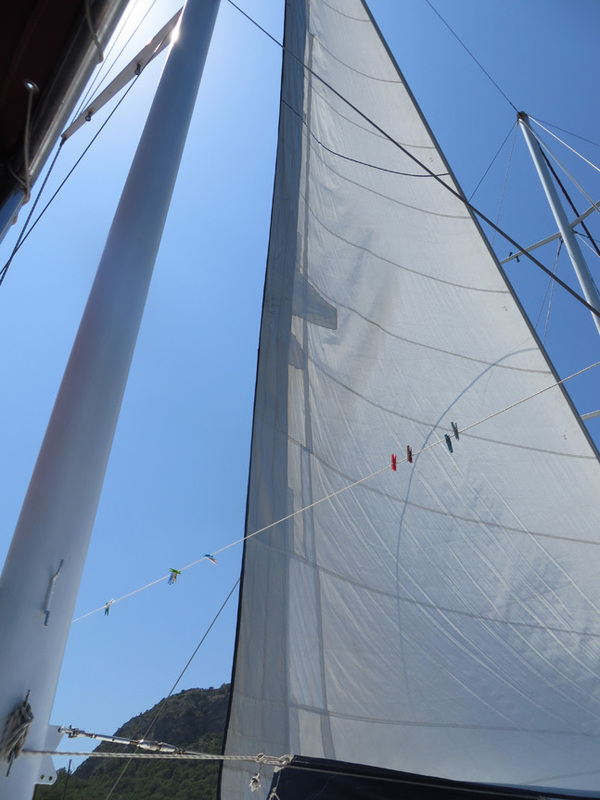 The sails are not the primary means of propelling the boat, but they sure were pretty. 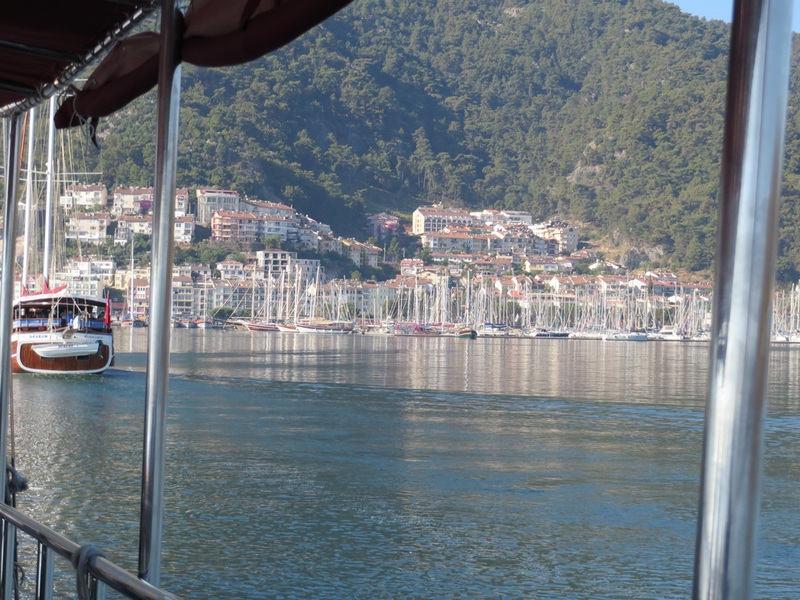 We sailed along for about two hours, then the crew moored the boat for the night in yet another pretty cove. The foresail is out. The clothespins on the lines were for our towels and wet swim suits. The view from the back of our boat. 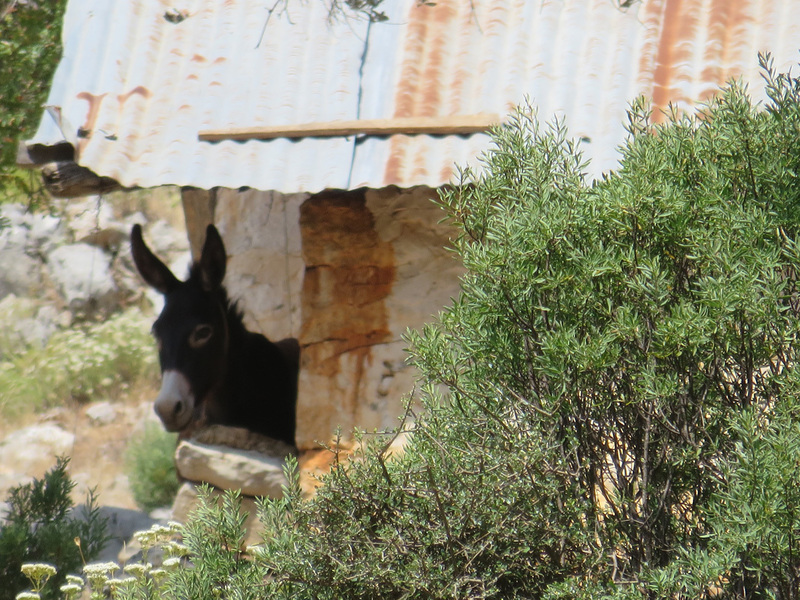 Looking out on the Aegean. 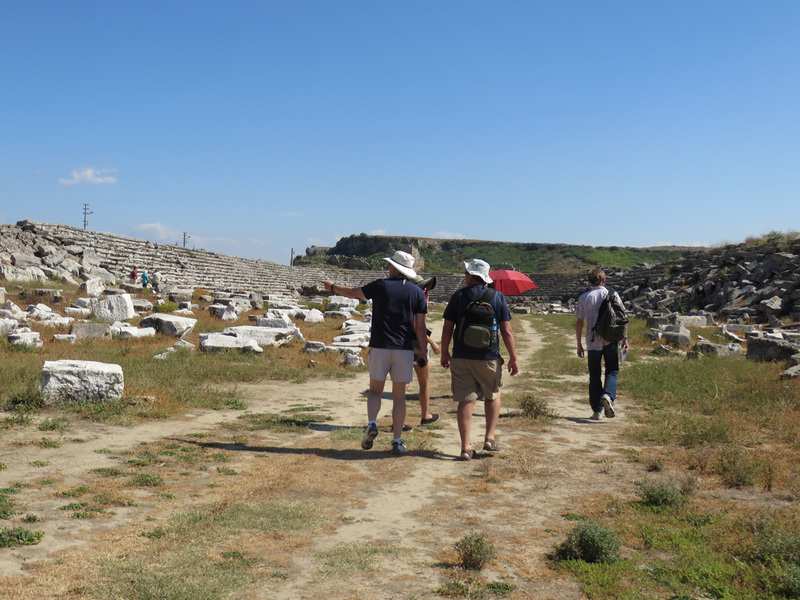 We sail close to the shore to see steps and burial chambers from the Lydean period. The crew uses the motorboat to take the mooring line out to the shore. 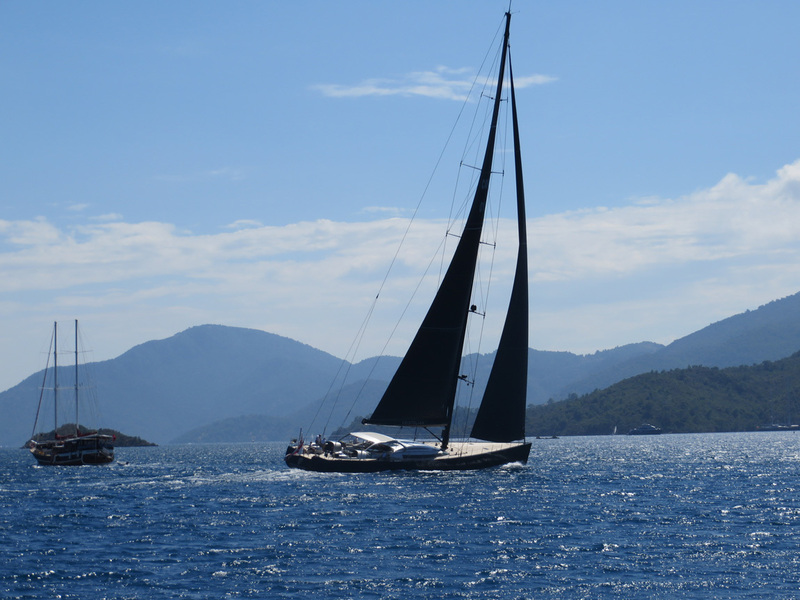 The captain pulls the line taut by motoring the gulet in the opposite direction, then he drops anchor. We again don our swim suits and jump in the turquoise waters. 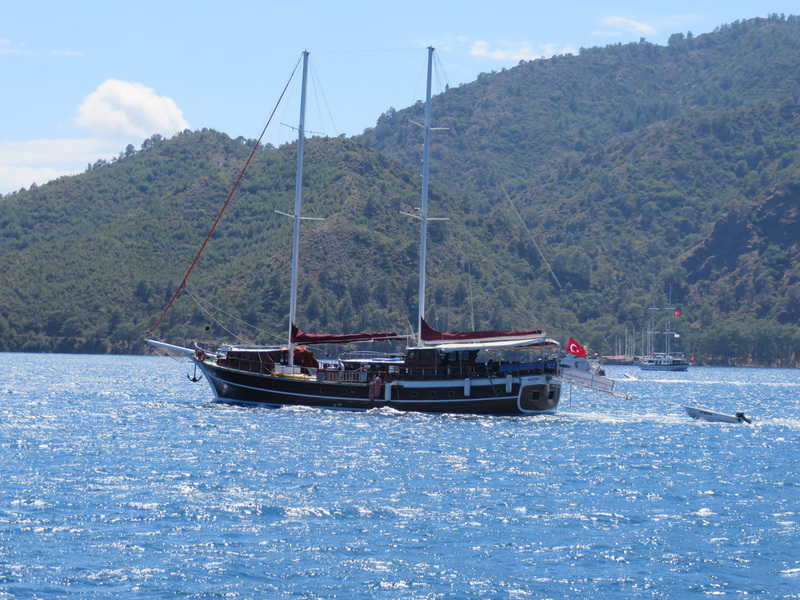 Later we enjoy food and drink and conversation on the gulet. Another great day. 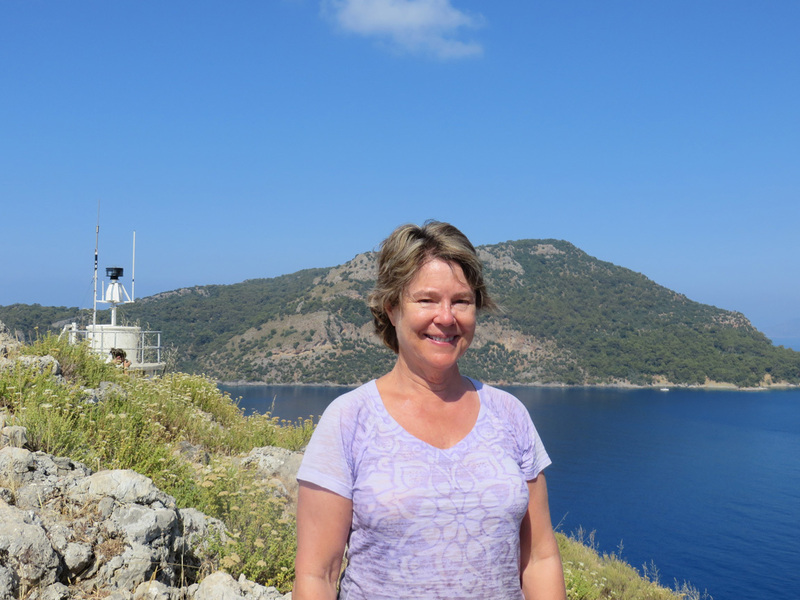 June 13: Enjoying a hike and the gulets. Ah, this is the life. 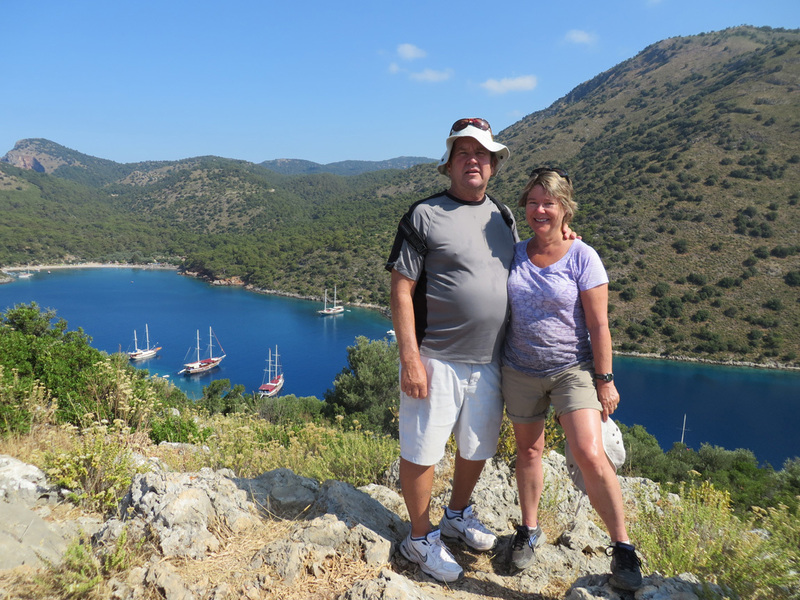 A day of hiking, swimming, snorkeling, and sailing on the Aegean seacoast. 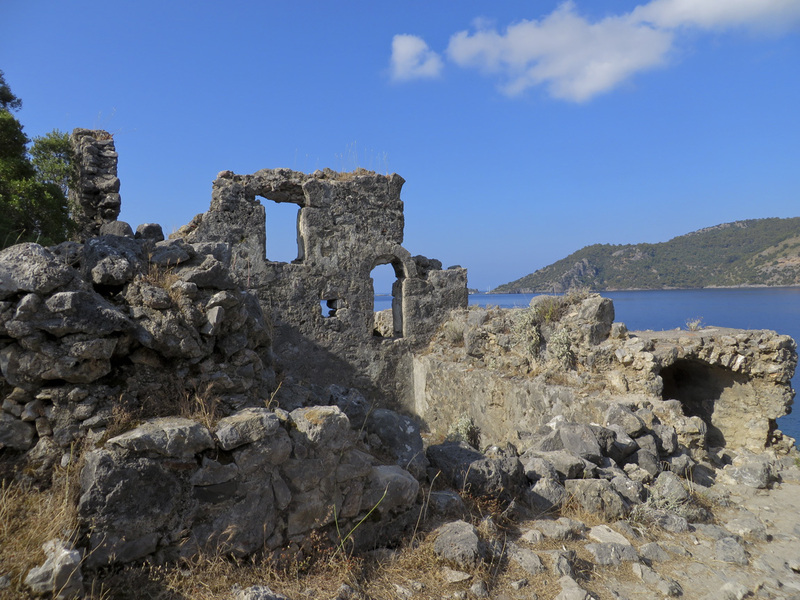 Ruins of buildings built thousands of years ago along the hiking path, ruins along the seashore and underwater. Turquoise water, warm and welcoming. Kayaks. Great food. Good conversation. This was a gem of a day. 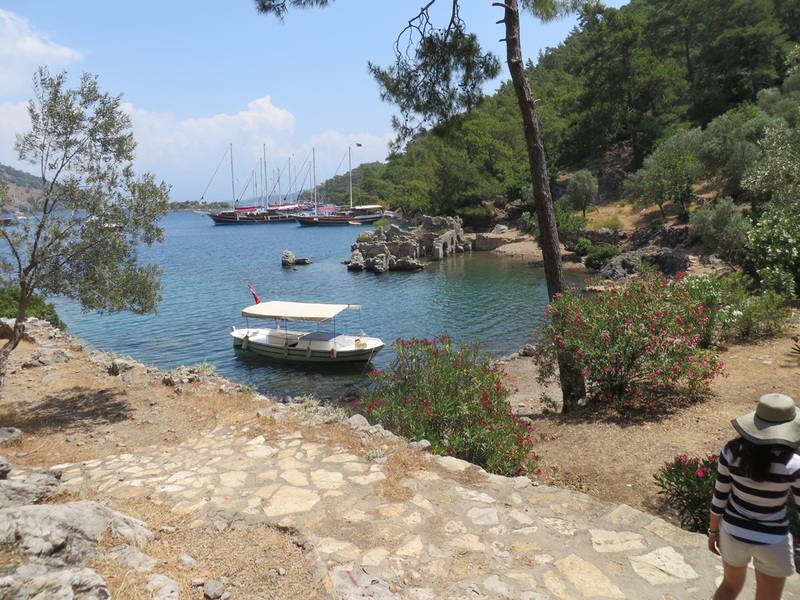 We begin our hike in the cove of Aga Limani, across the bay from Gocek. 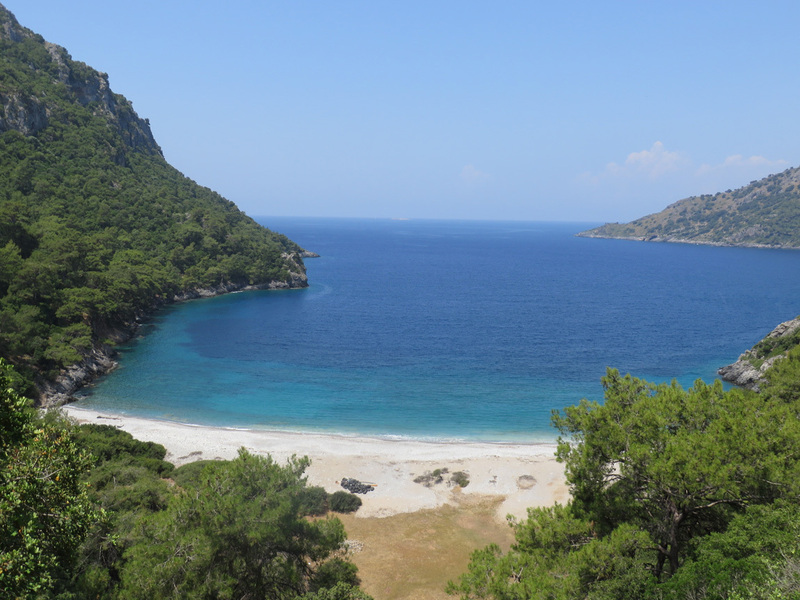 The hike is part of the Lycian Way, a long-distance footpath in Turkey along the coast of ancient Lycia. 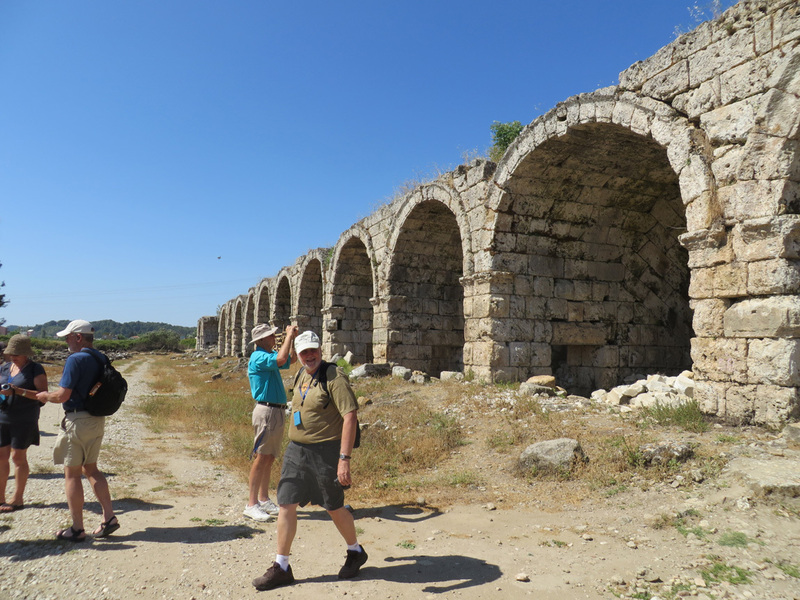 We hike past Greco-Roman ruins, Lydian ruins, and end at the Lycian era Sunken Baths of Cleopatra. 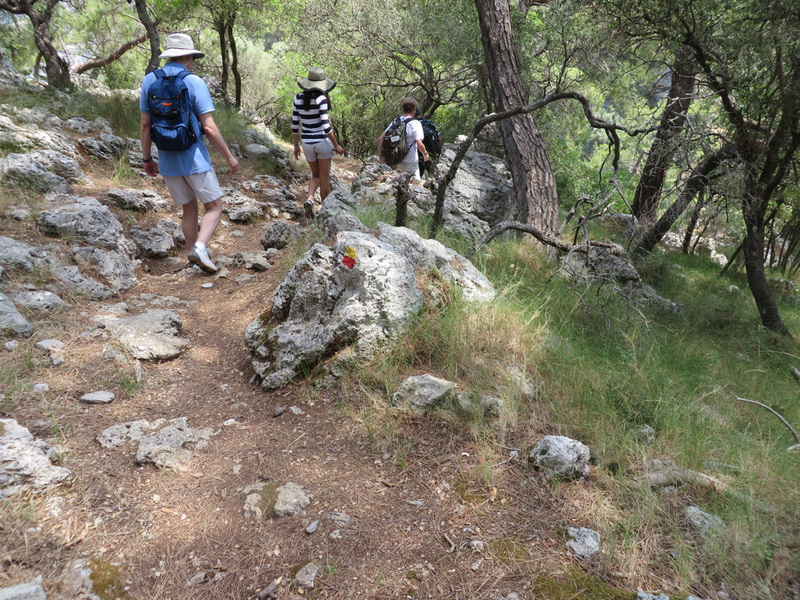 The hike took about 3 hours and was steep and rocky at times. 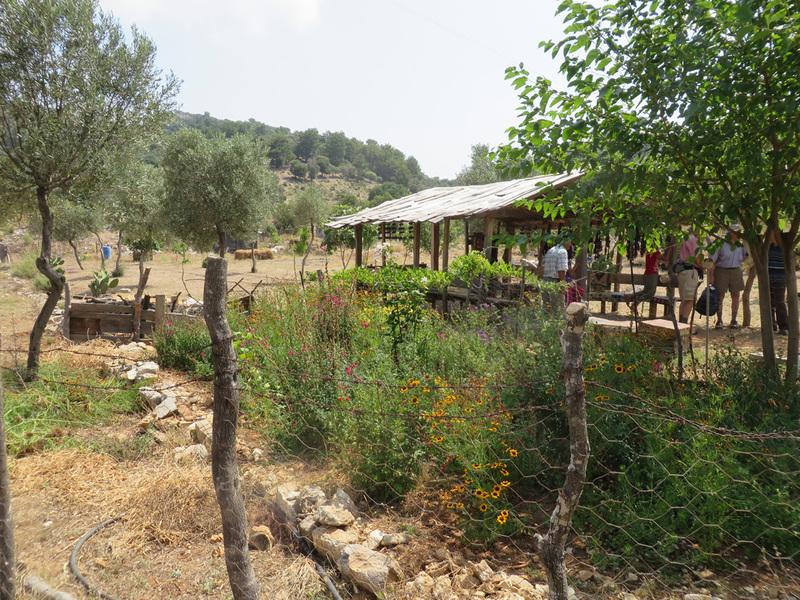 We stop a lot to learn about the different trees and flowers and local history. The trails rises quickly and we see our gulets starting off. They will motor along the shore and pick us up at another spot at the end of our hike. 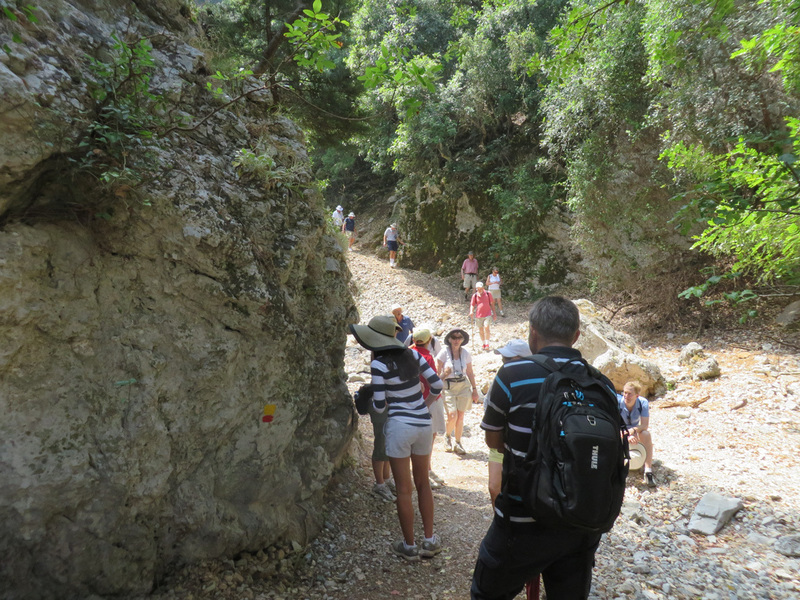 This trail was once paved with large stones. 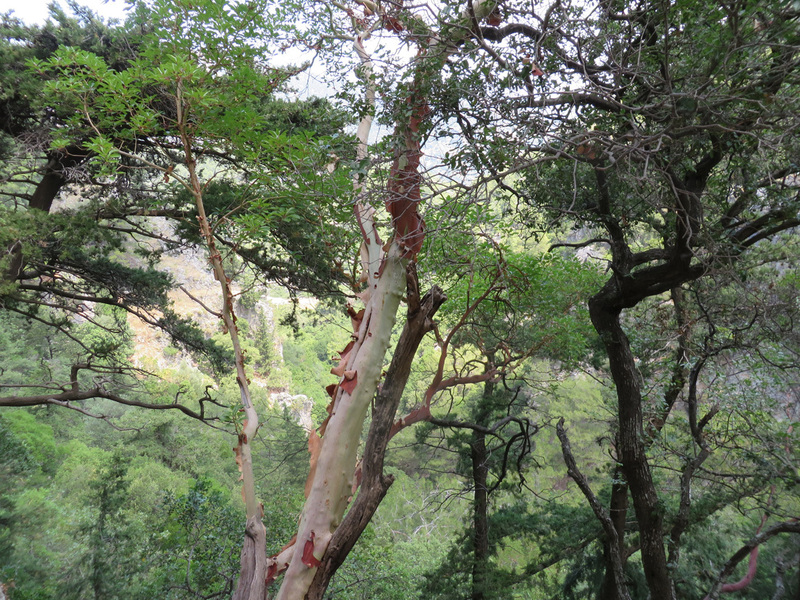 Different types of trees and plants line the trail. Ali points out pomegranite trees, bay leaf trees, and herbs such as oregano and sage. This was once a church. 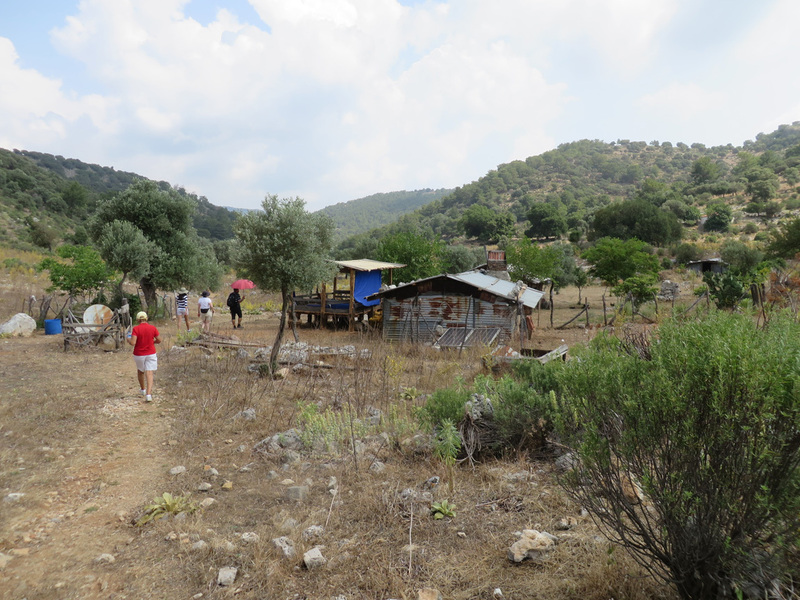 Ali has arranged for us to visit a family that lives in this rural area. 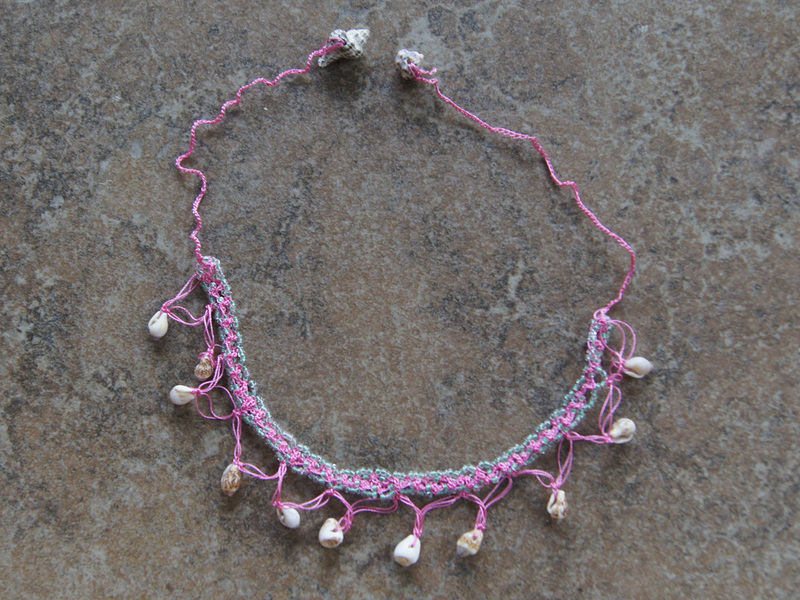 They raise goats and the wife makes necklaces and goat-bells to sell to passers-by. Their daughter is home for the summer, but in the school year she lives with relatives near a city so she can attend a good school. They offer us refreshments. 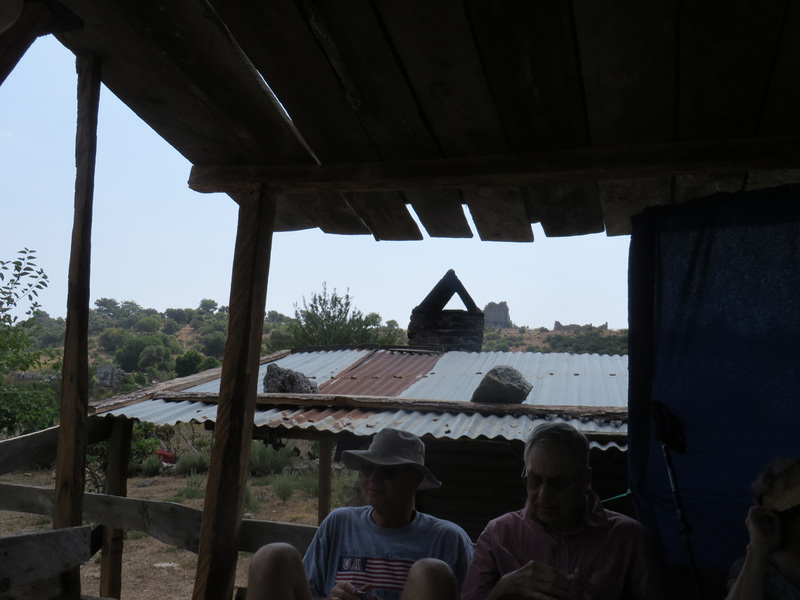 It is good to sit down out in the shade and enjoy the sage tea. They sell their crafts under a covered area. Our hike continues beneath these tall trees. They are kind of a feathery pine tree. 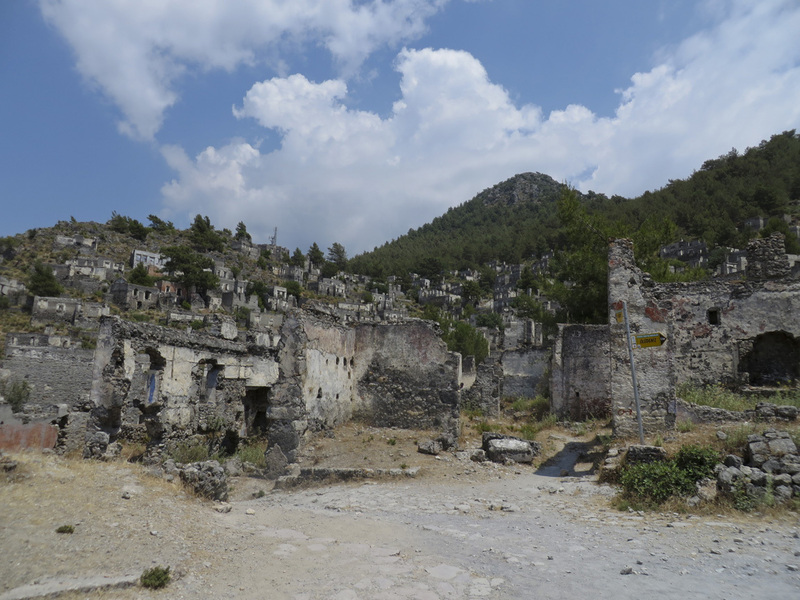 The Lycian Way is waymarked with red and yellow stripes of paint. 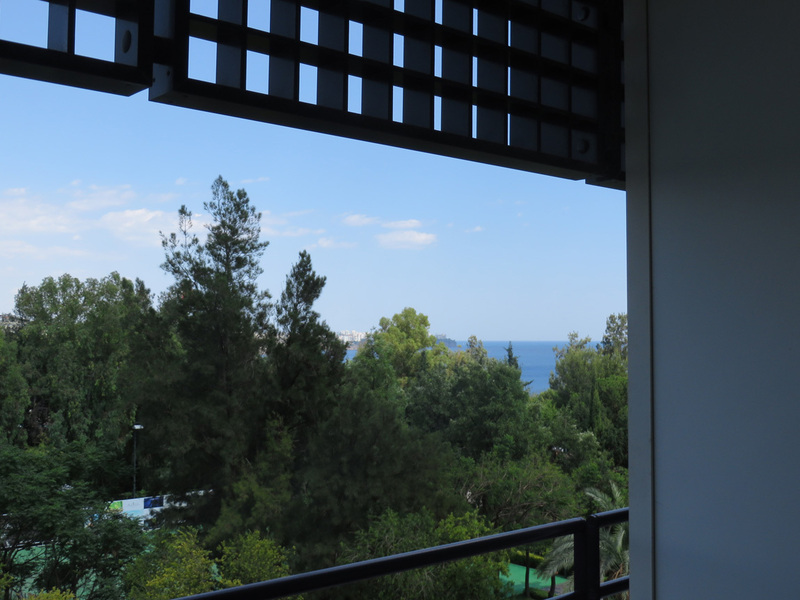 You can see the Aegean Sea in this photo. We climbed up pretty high. 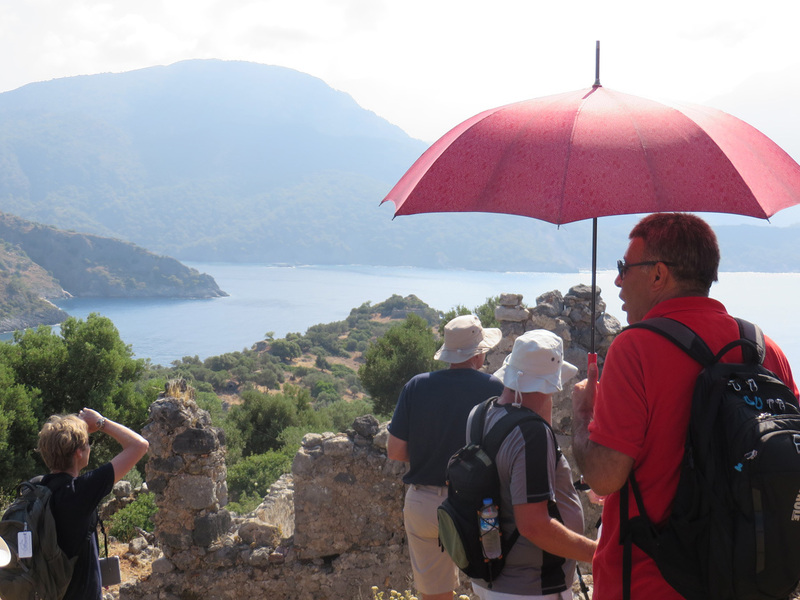 Ali tells us that Antony gave this part of the Lycian Way to Cleopatra as a gift, since the view is so beautiful. This is a strawberry tree. No, it doesnâ€™t produce strawberries, it just has bark that resembles the look of strawberries. 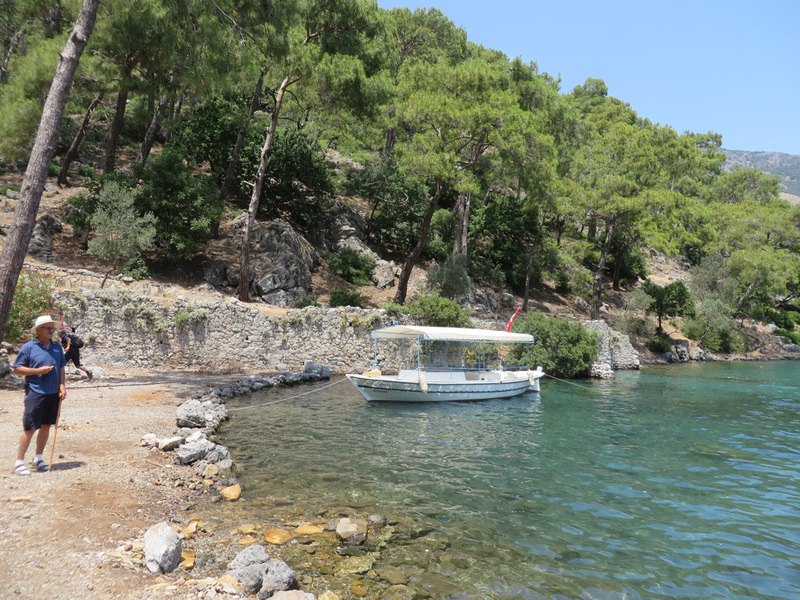 Our gulets await us in a different cove from which we disembarked this morning. 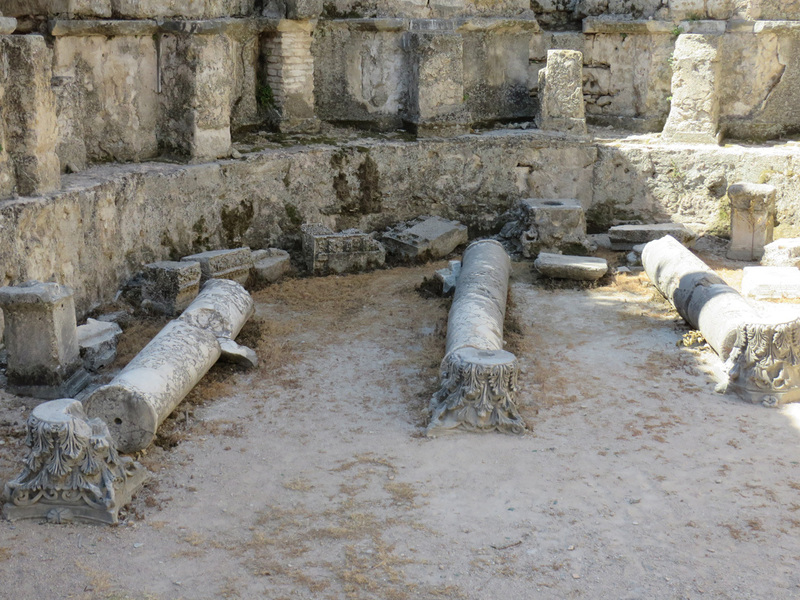 The ruins are the Sunken Baths of Cleopatra. 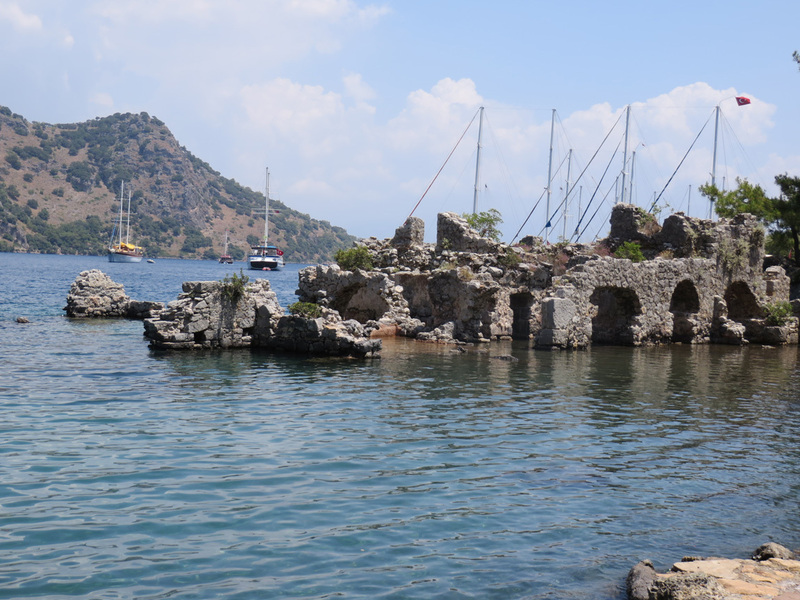 We will have lunch on the gulet and then spend the afternoon swimming and snorkeling around these ruins. 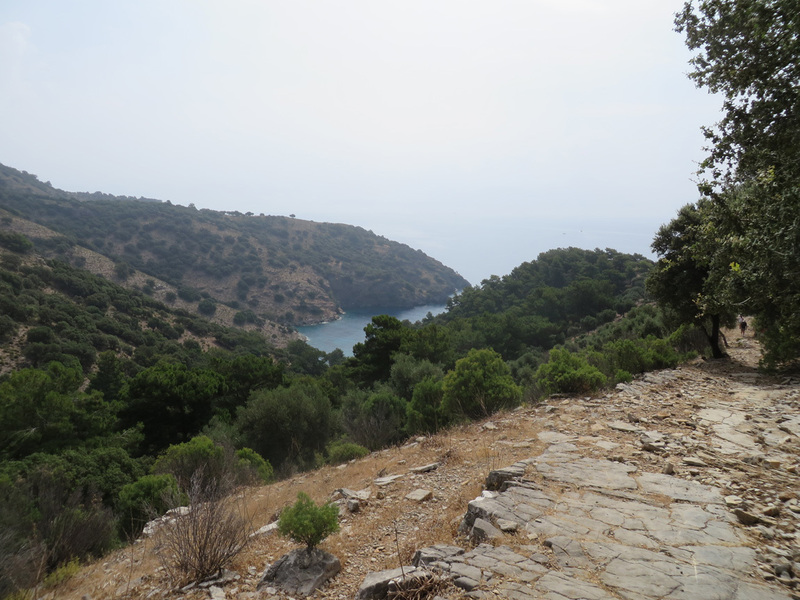 And we are all set for a rest from the hike and an afternoon enjoying the Aegean Sea.